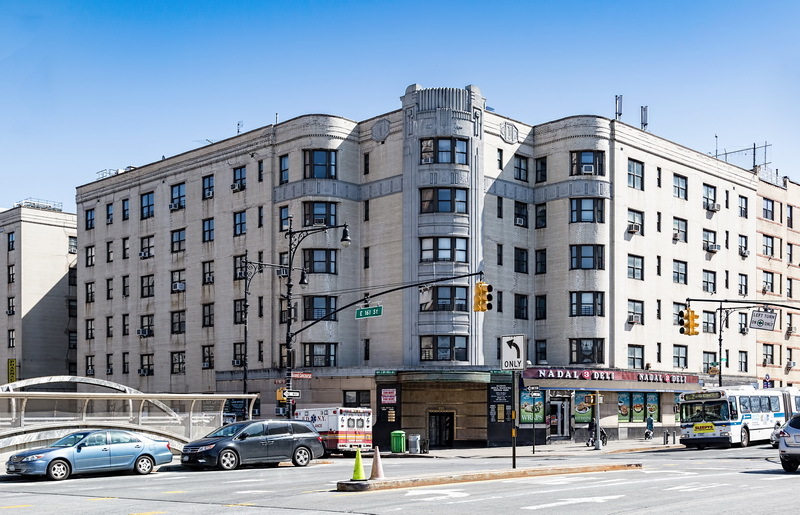 December 14, 2015 Bronx1005 Jerome Avenue, 1931, architecture, Art Deco, bronx, Highbridge, Horace Ginsbern, landmark, Marvin Fine, New York City, NYC, Park Plaza Apartments, residential. 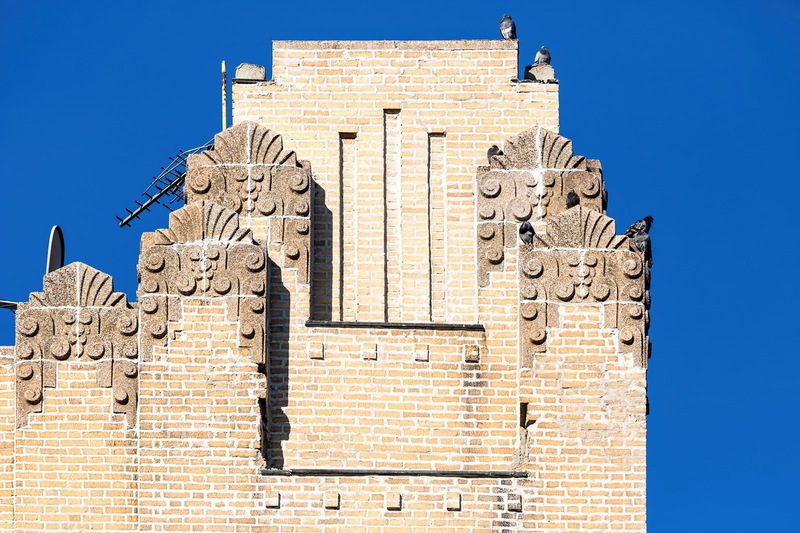 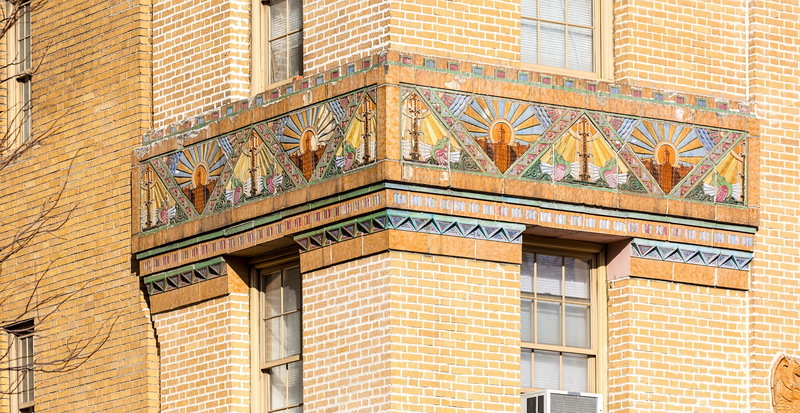 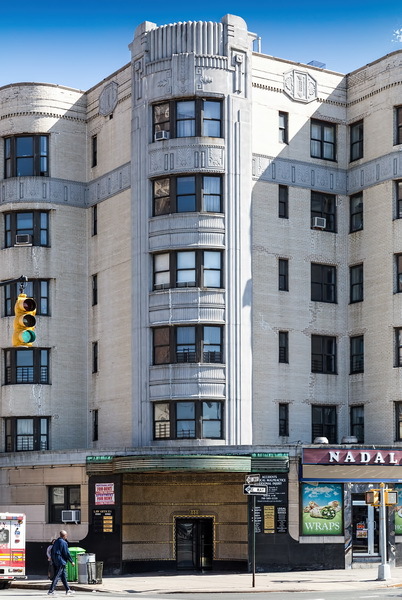 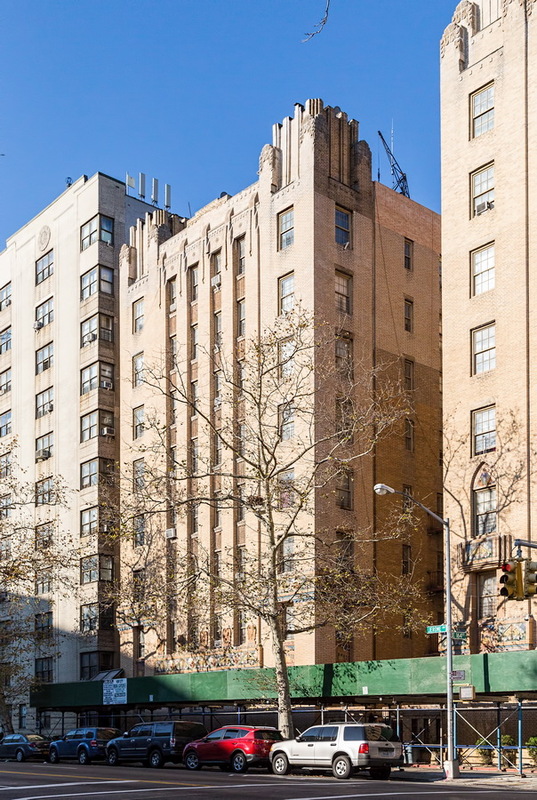 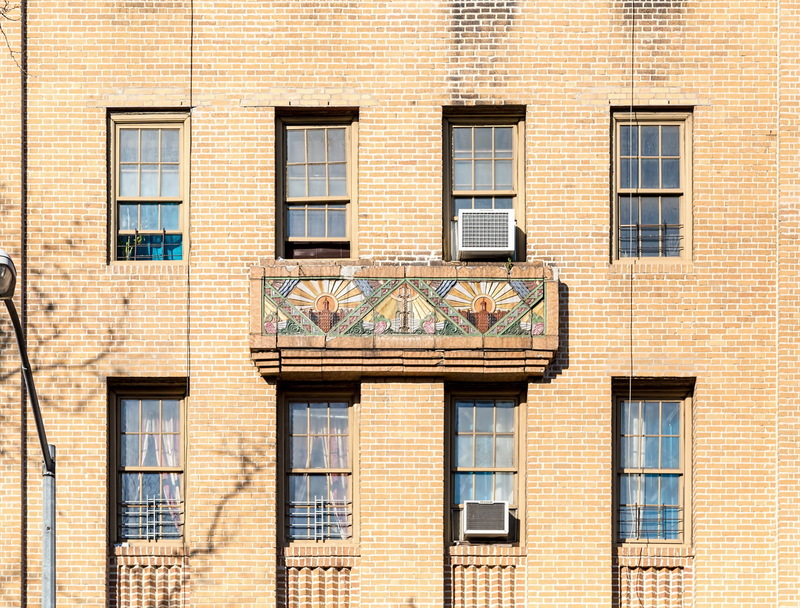 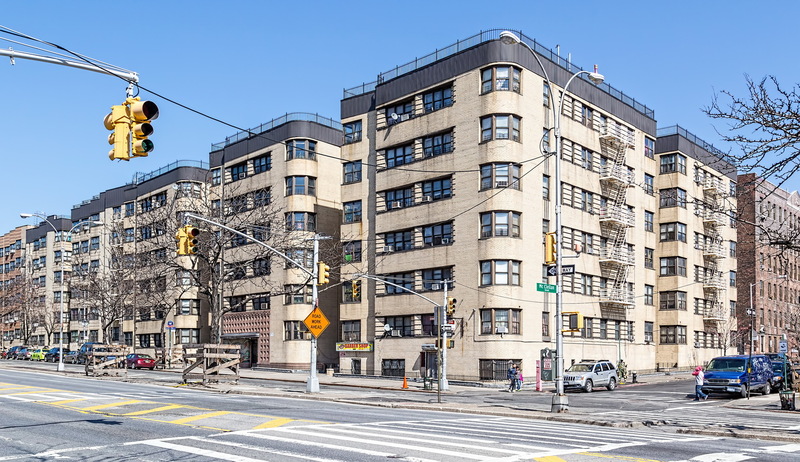 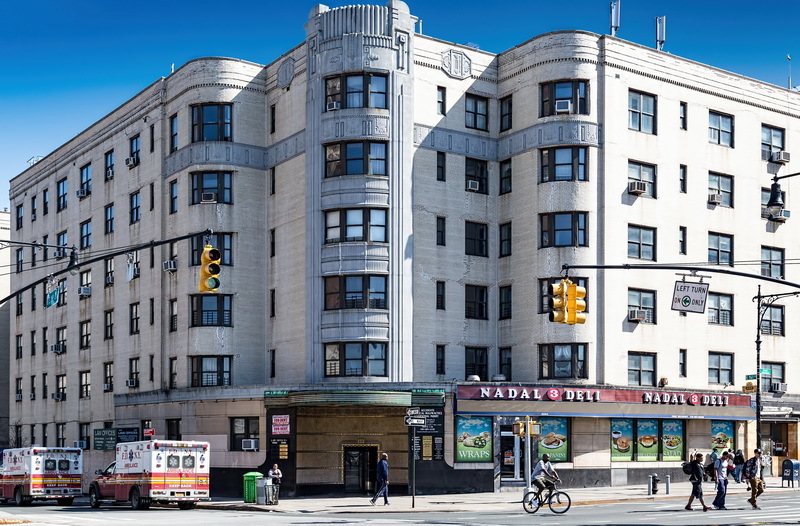 Park Plaza Apartments is one of the first Art Deco apartment houses to be built in the Bronx. 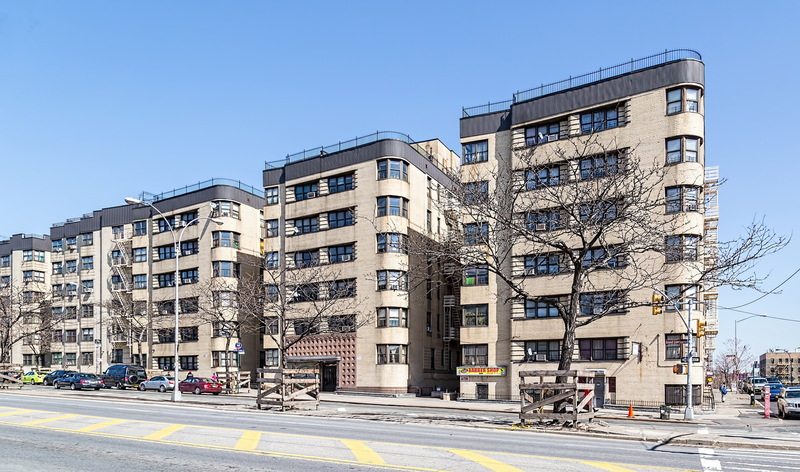 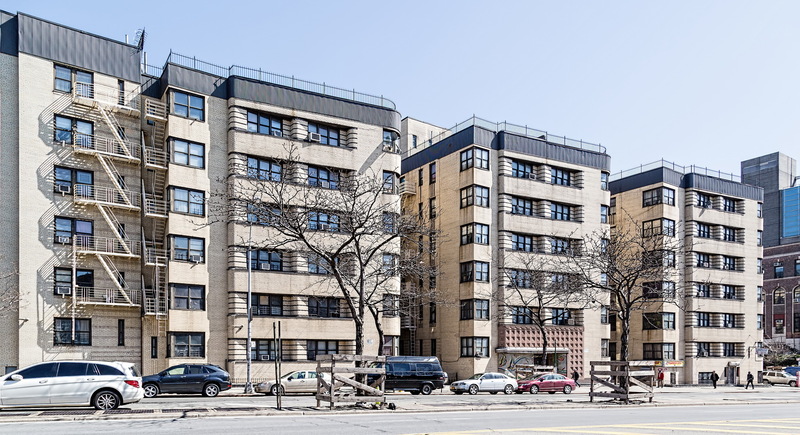 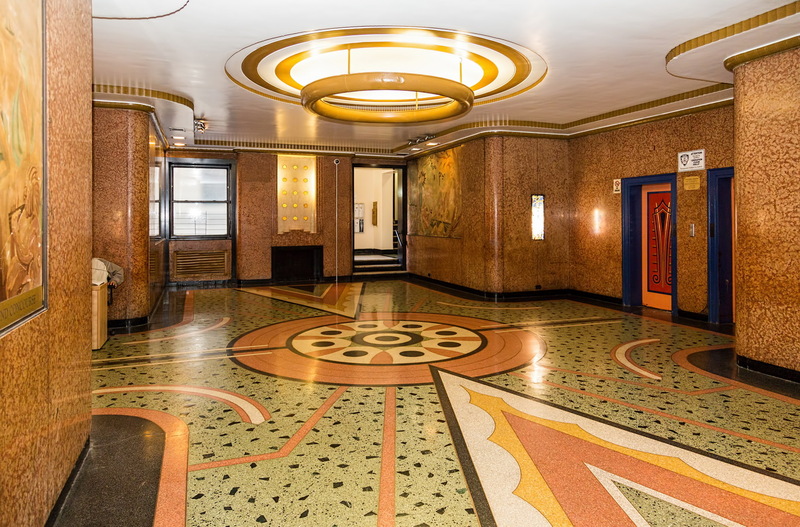 It was designed by the prolific team of Horace Ginsberg and Marvin Fine, who built dozens of buildings on and around the Grand Concourse, including the Fish Building and Noonan Plaza Apartments. 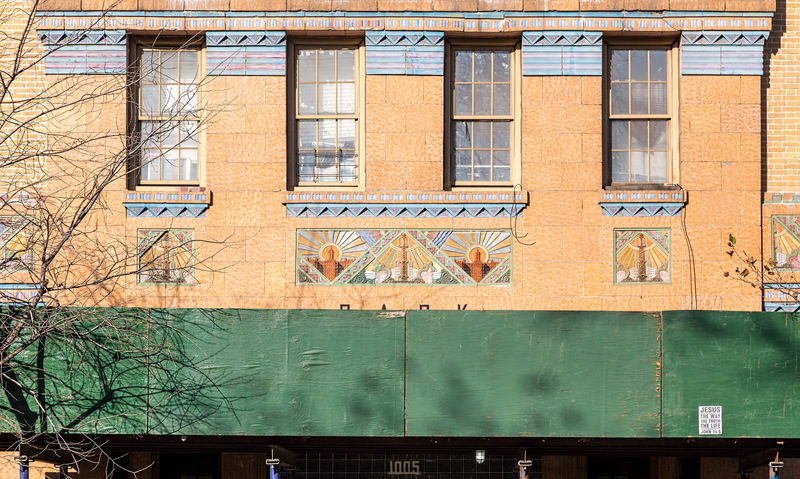 Bold, colorful glazed terra cotta enlivens the 365-foot-wide facade. 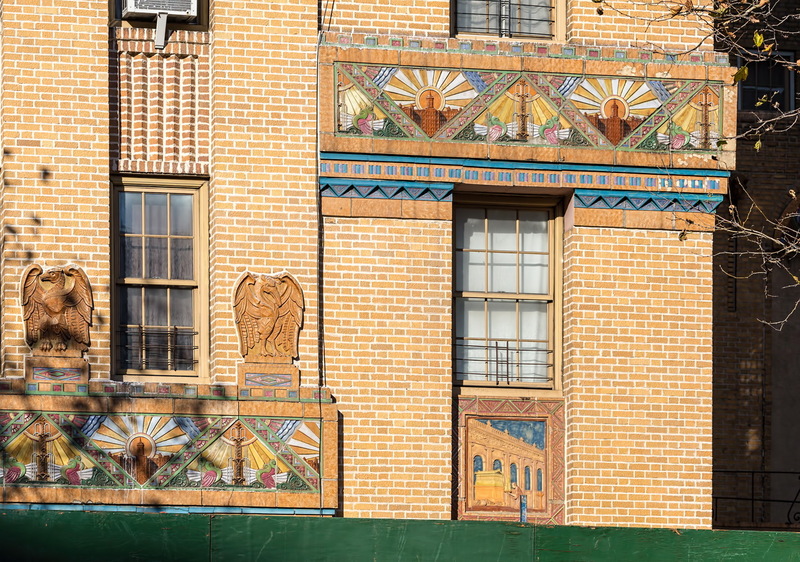 Ginsberg (who later changed his name to Ginsbern) specialized in the design and layout of apartments, while Fine specialized in the elevations – the facades. 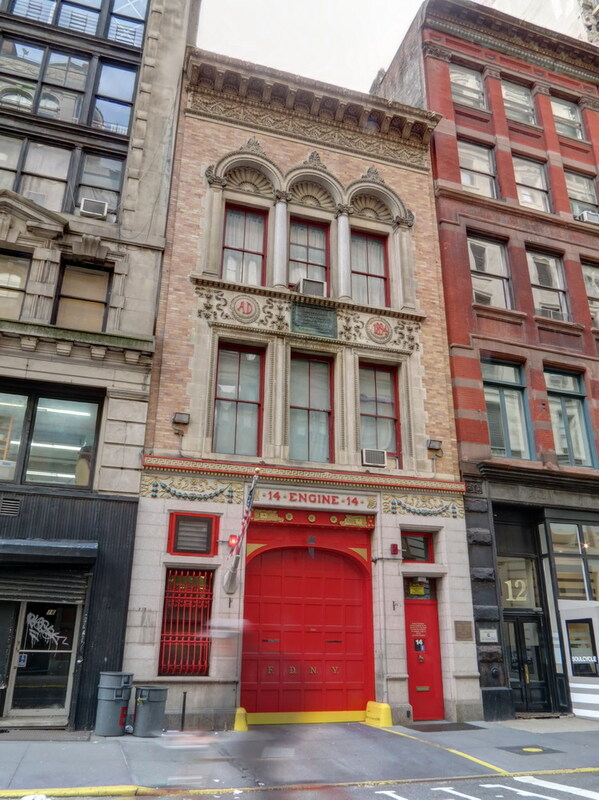 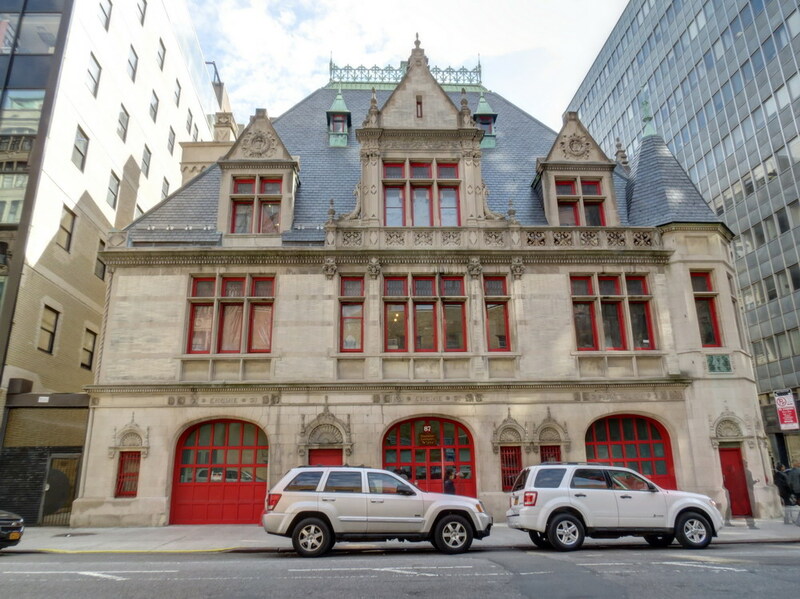 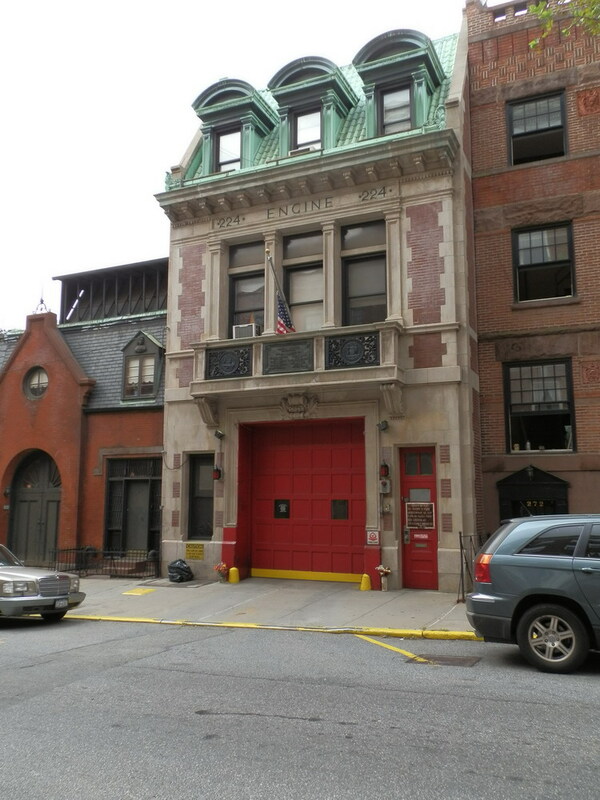 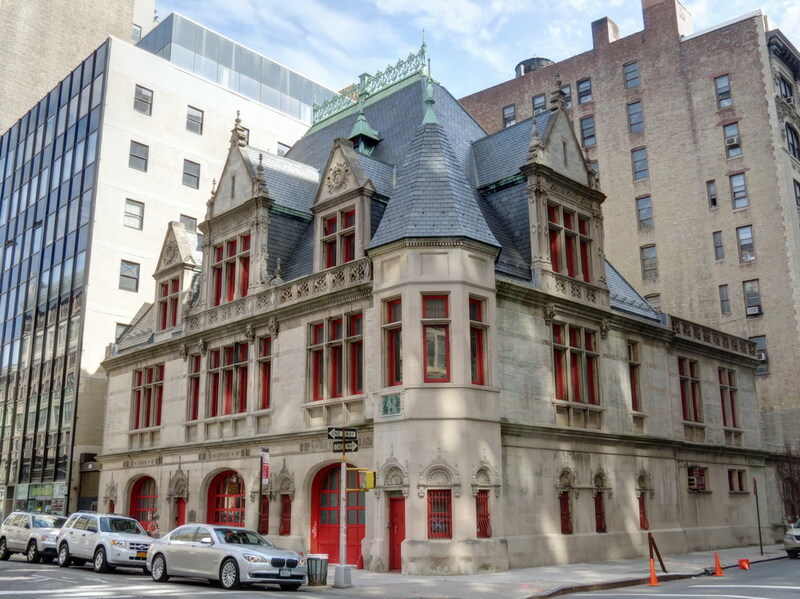 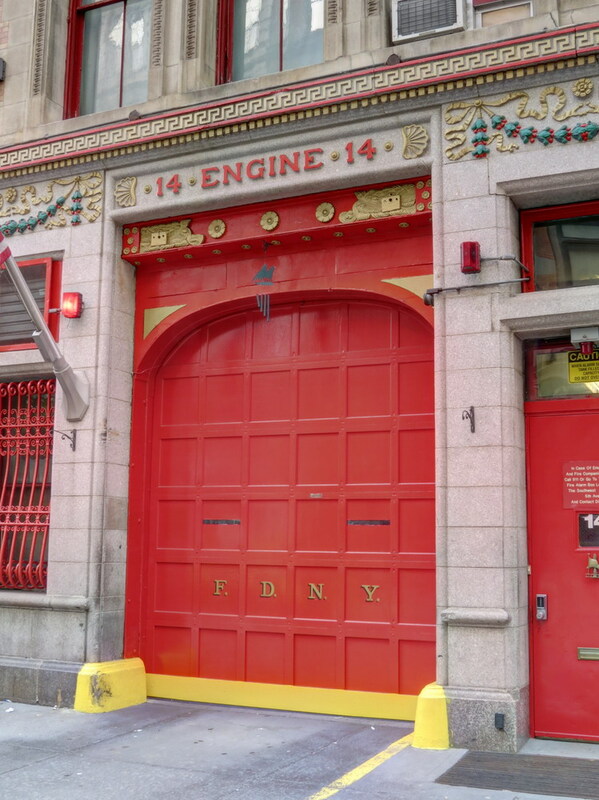 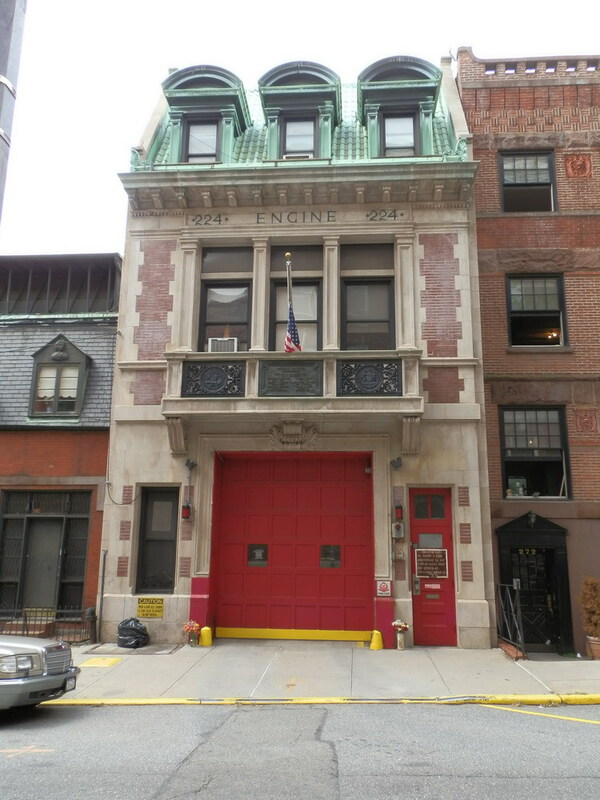 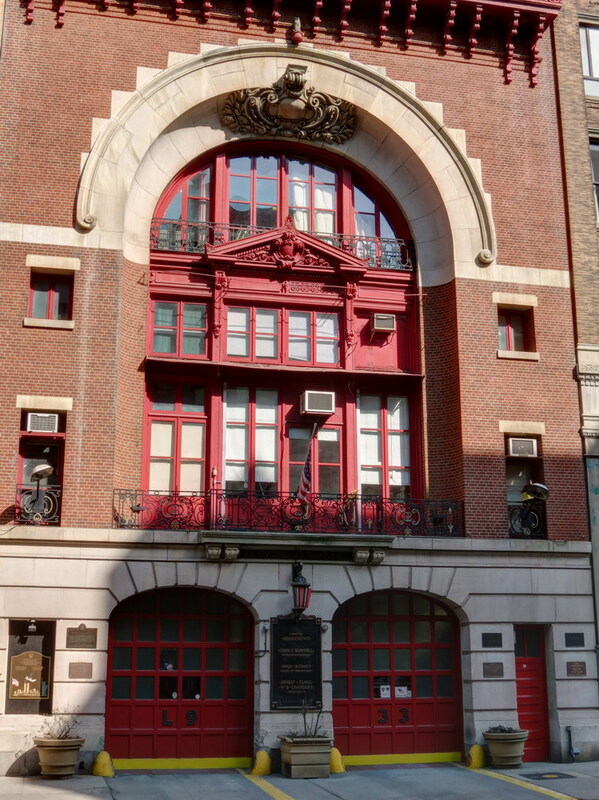 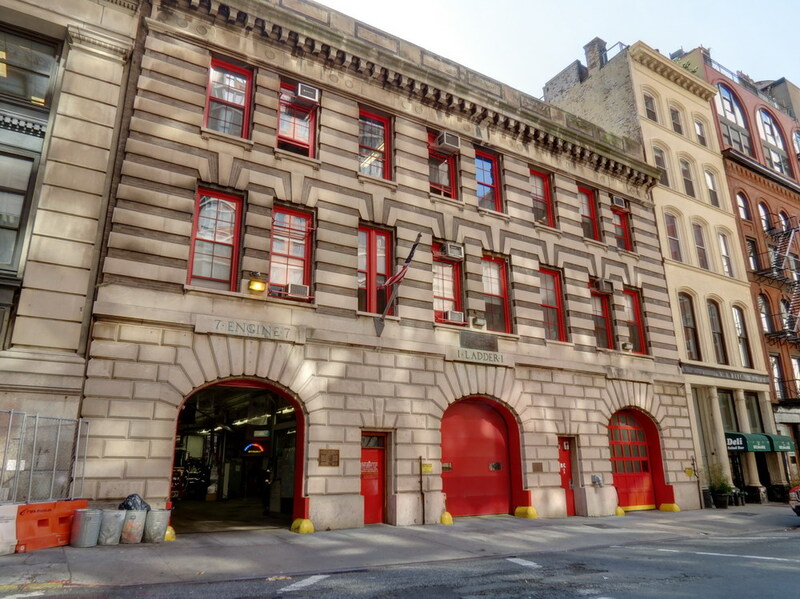 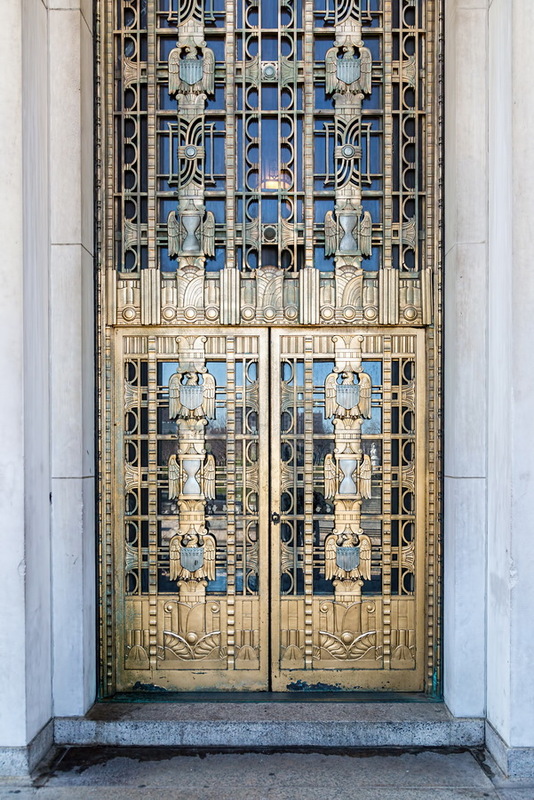 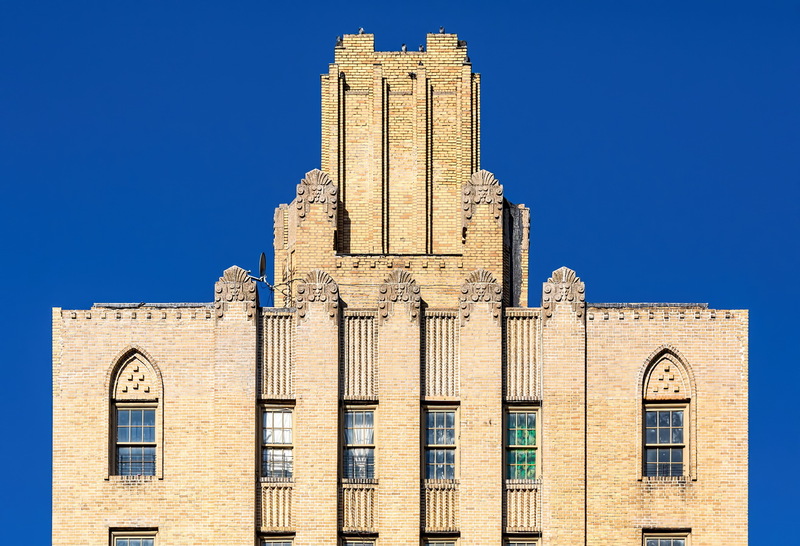 Fine began his career working for Cass Gilbert, the architect of the Woolworth Building, among other landmarks. 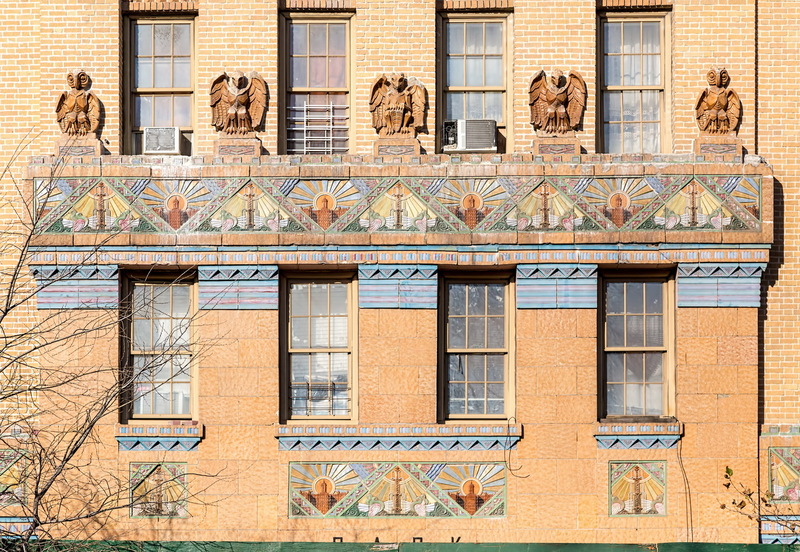 But while working for Ginsberg – in the midst of the Park Plaza project – Fine broke with his classical training and experience to embrace “modernistic” design. 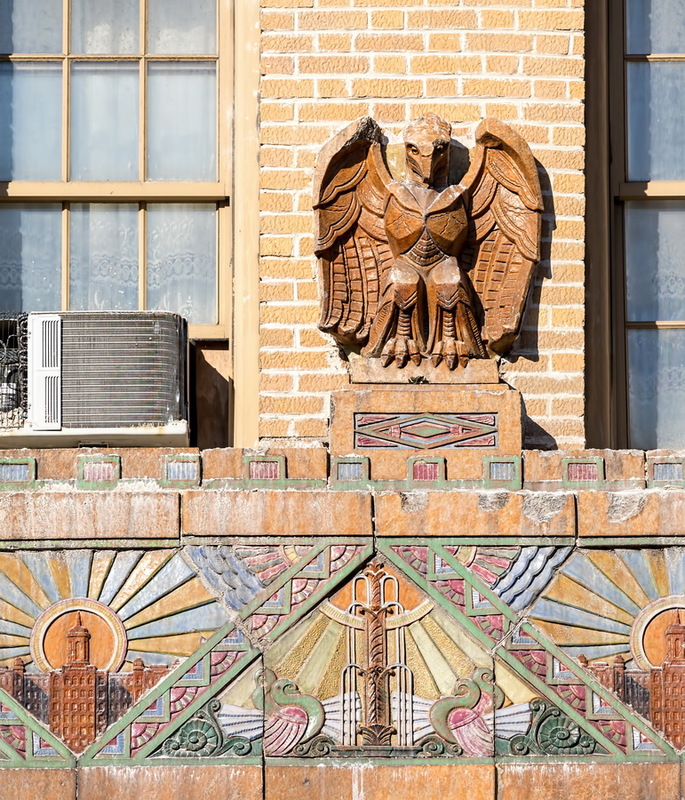 Fine credited the work of William Van Alen (Chrysler Building) and Raymond Hood (American Radiator Building) as his inspiration. 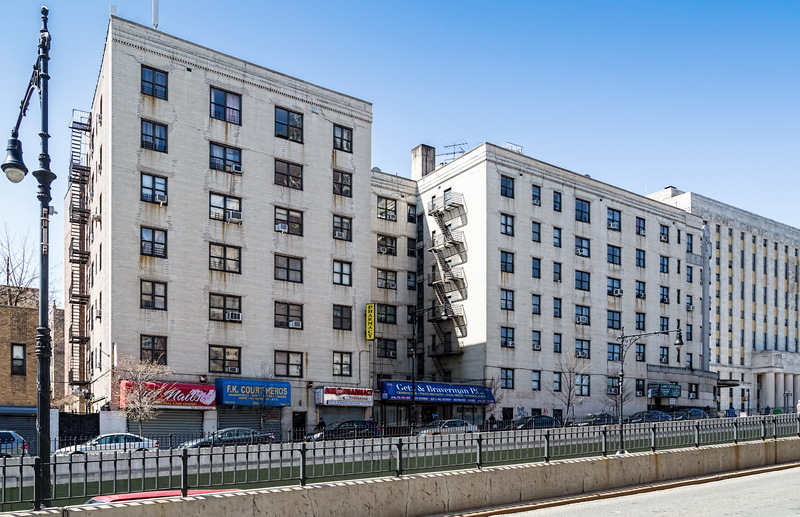 The Park Plaza Apartments is on an L-shaped site with its long side on Jerome Avenue; the base pokes through the block to Anderson Avenue. 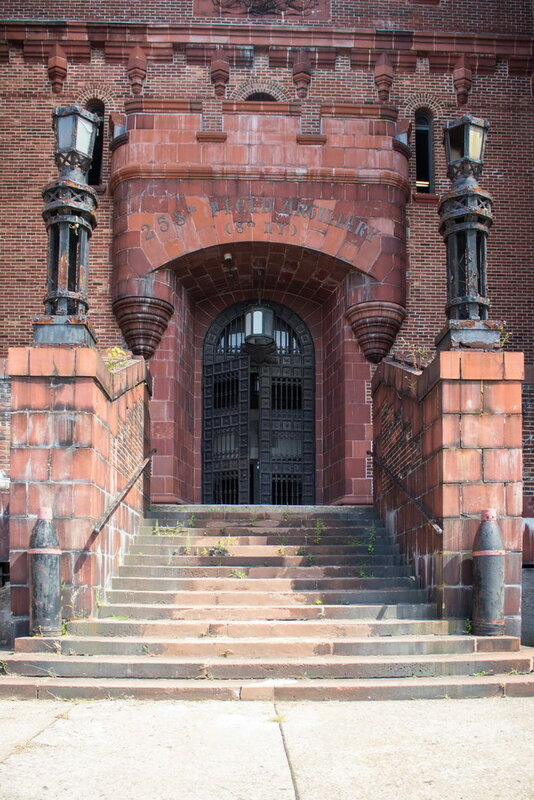 The eight-story building, viewed from the front, has five blocks or wings separated by courtyards. 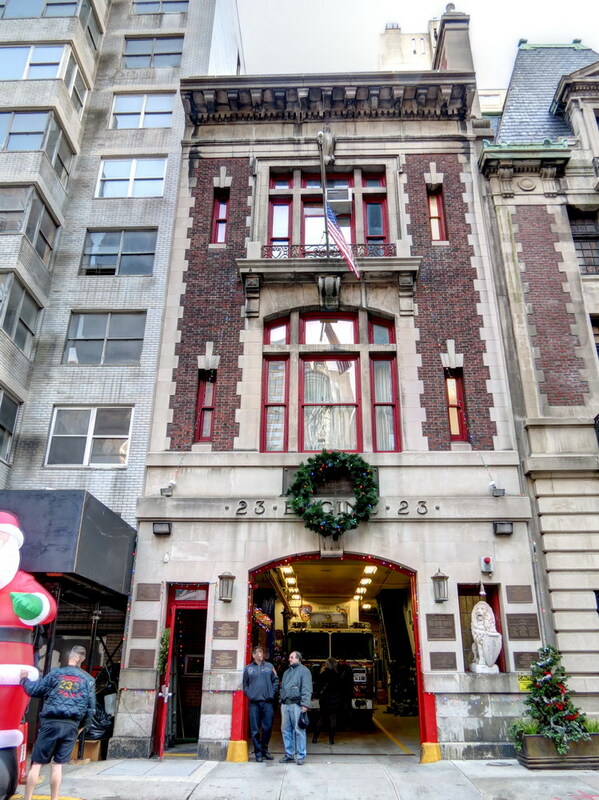 Initially, the building was to have 10 floors. 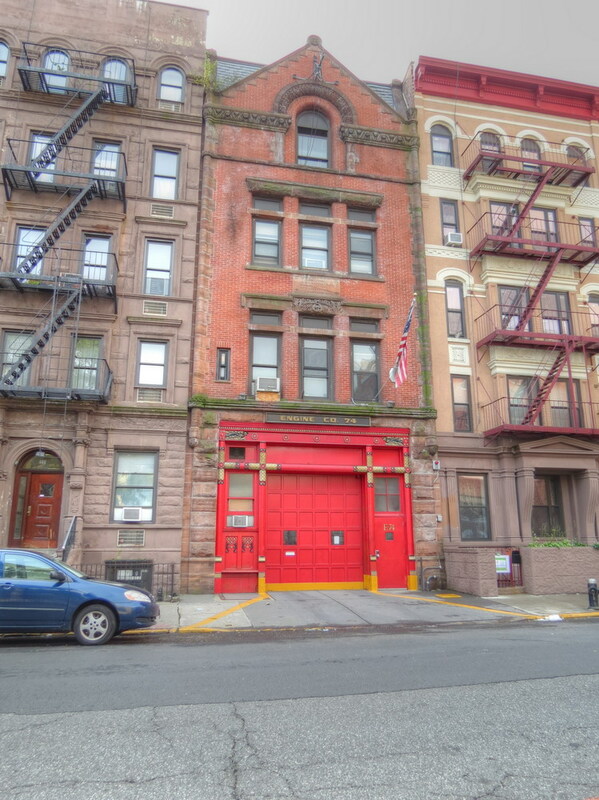 During construction, fire destroyed the building, and the Department of Buildings imposed a lower height for the rebuilt apartments. 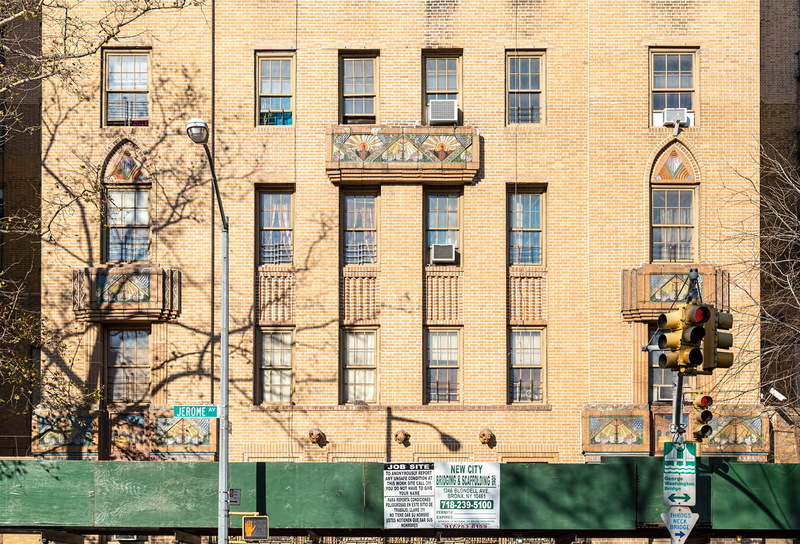 When built, Park Plaza Apartments promoted its quiet views of Jerome Park. 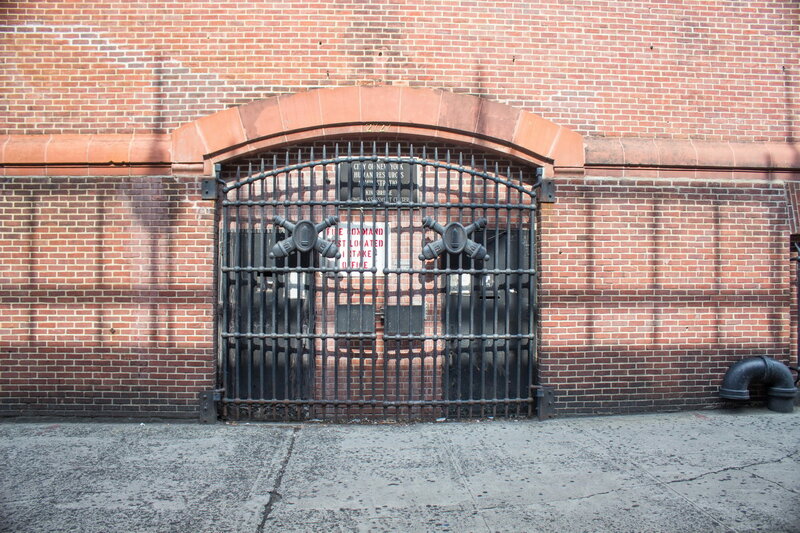 Part of the park remains (Mullaly Park), but the New Yankee Stadium occupies what was Macombs Dam Park, across the street. 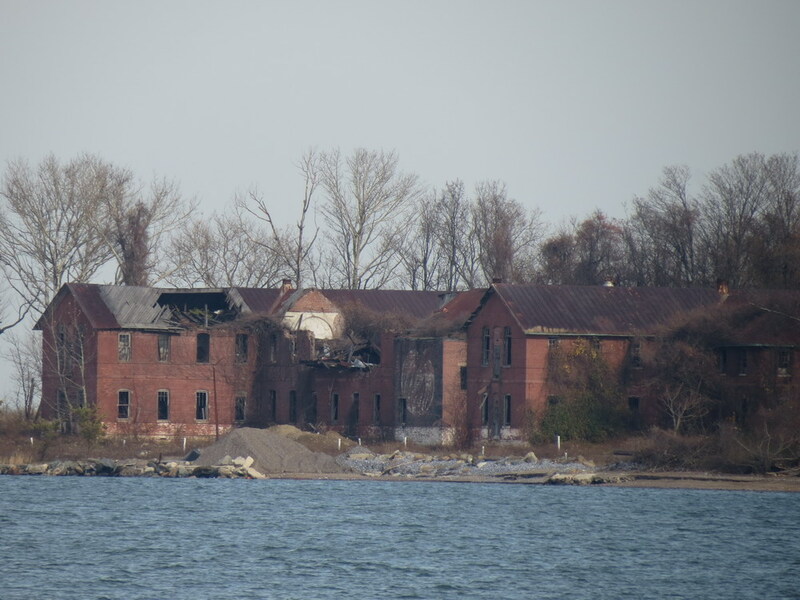 So much for quiet. 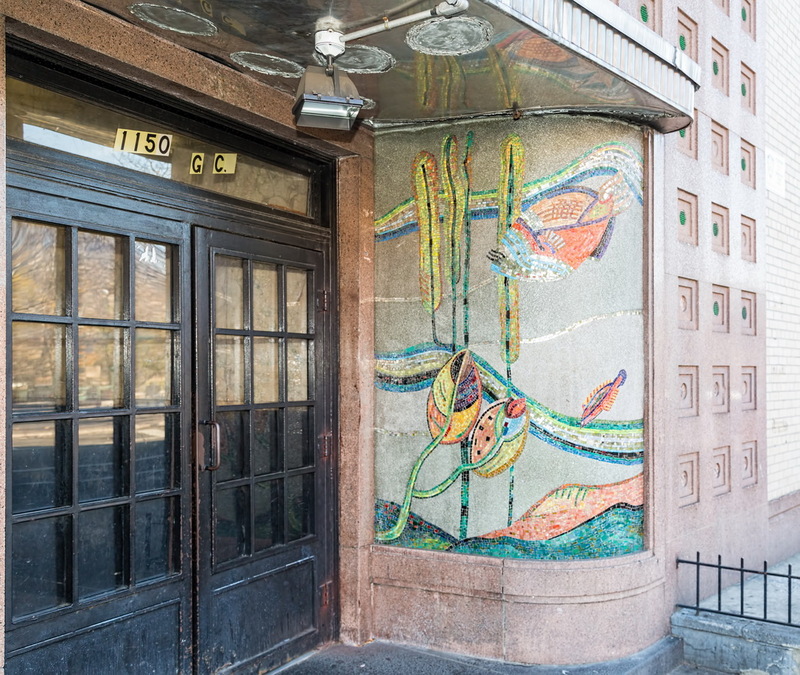 December 1, 2015 Bronx1150 Grand Concourse, 1937, architecture, Art Deco, bronx, Fish Building, Grand Concourse, Horace Ginsbern, landmark, Marvin Fine, New York City, NYC, residential. 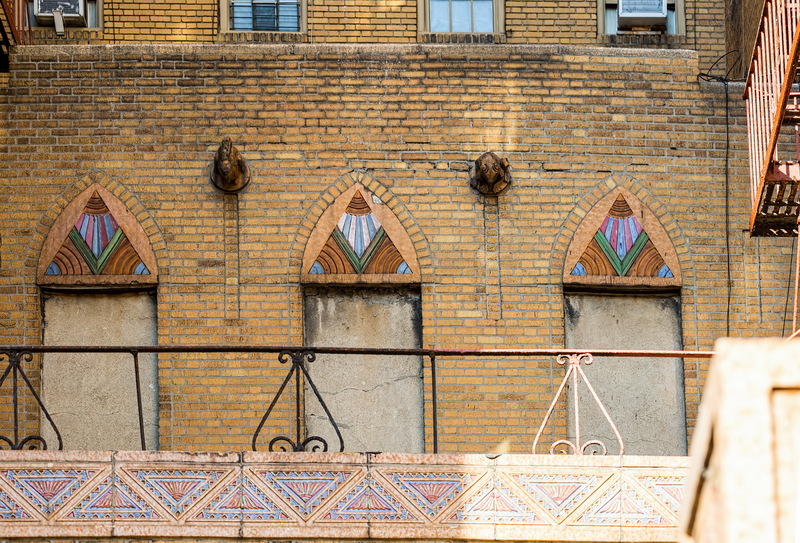 Fish Building is “one of the most astonishing apartment houses in the Bronx, indeed in New York City,” wrote Christopher Gray in his July 15, 2007 New York Times Streetscapes column. 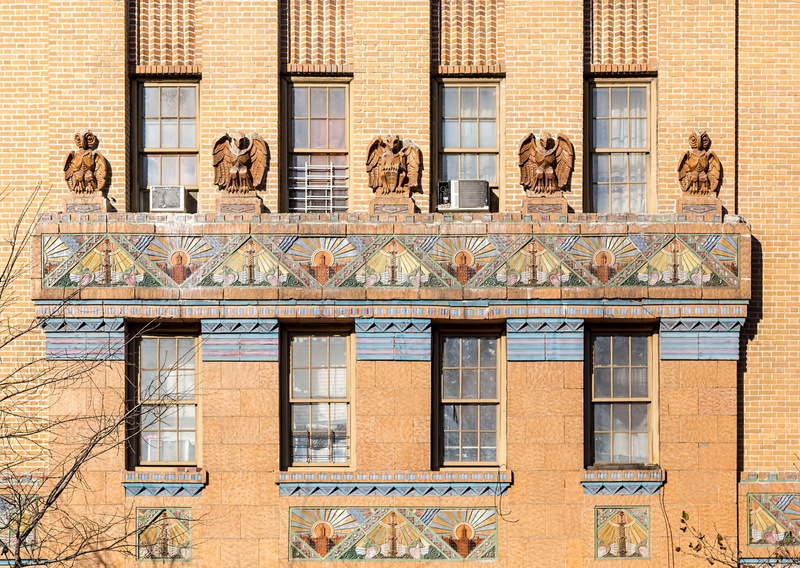 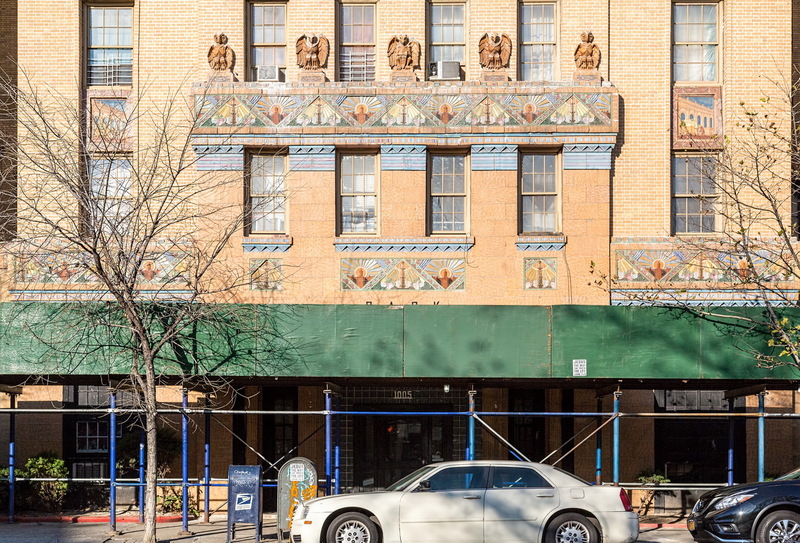 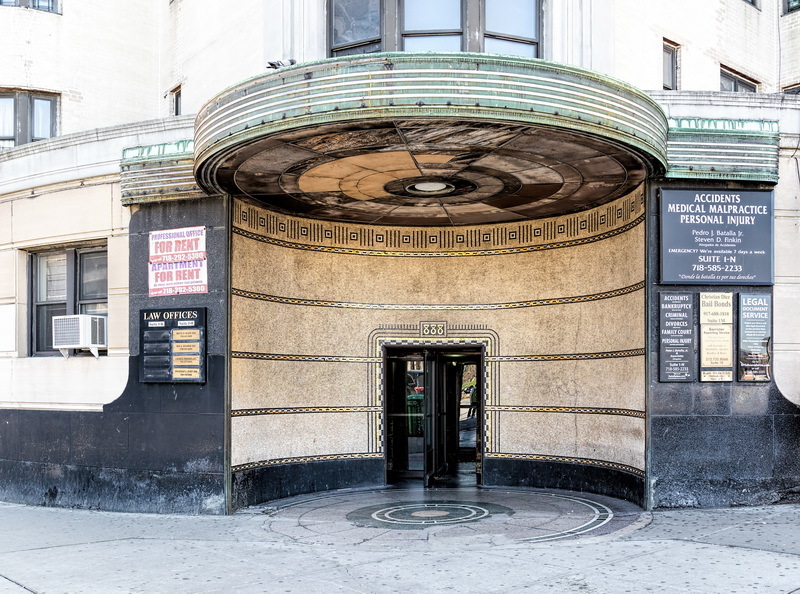 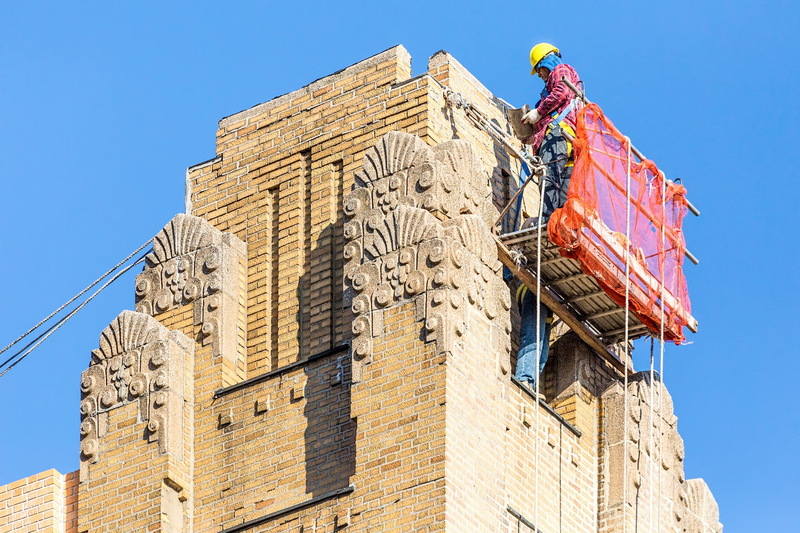 The six-story building, aka 1150 Grand Concourse, is an Art Deco delight designed by Horace Ginsbern and Marvin Fine. 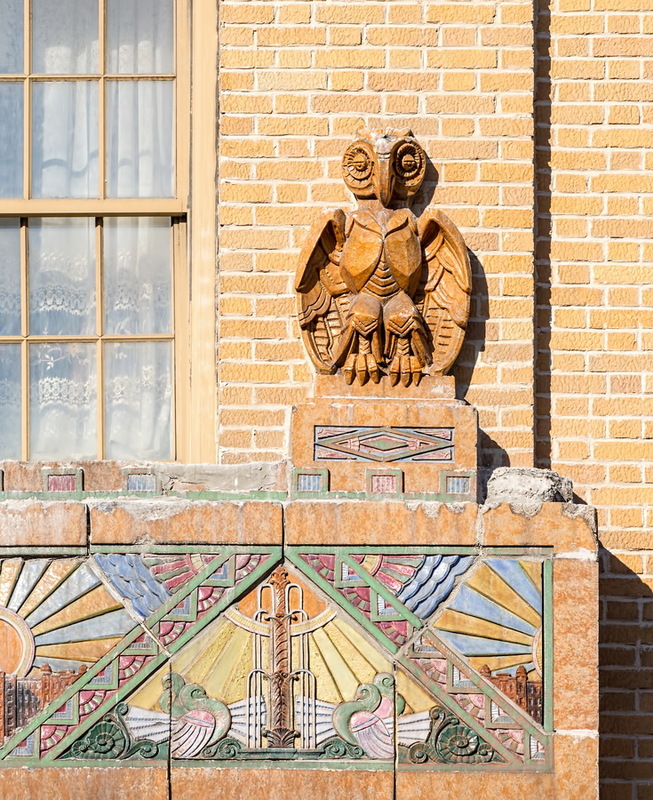 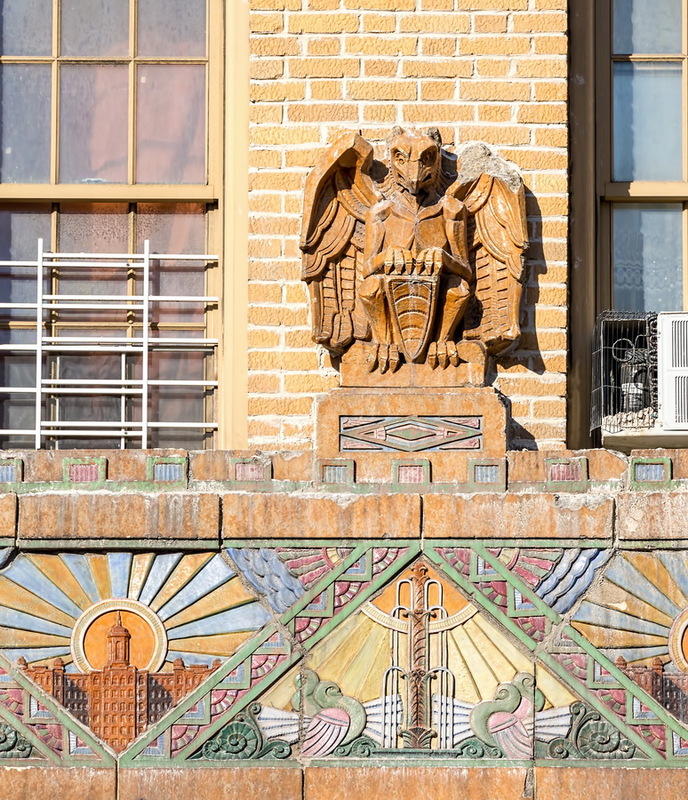 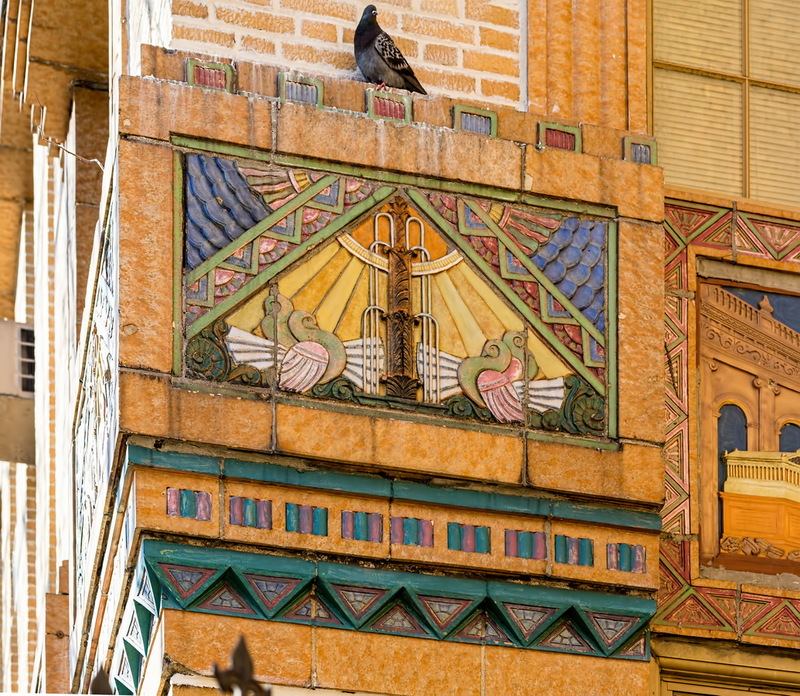 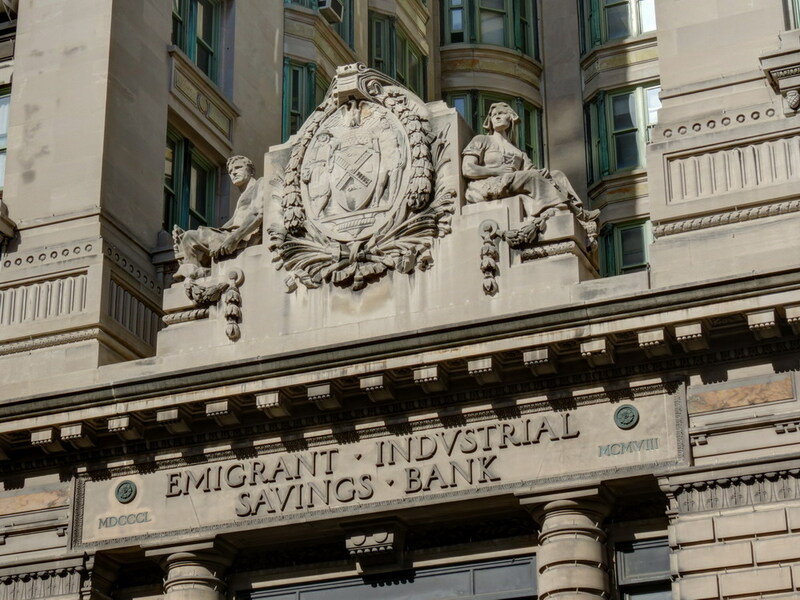 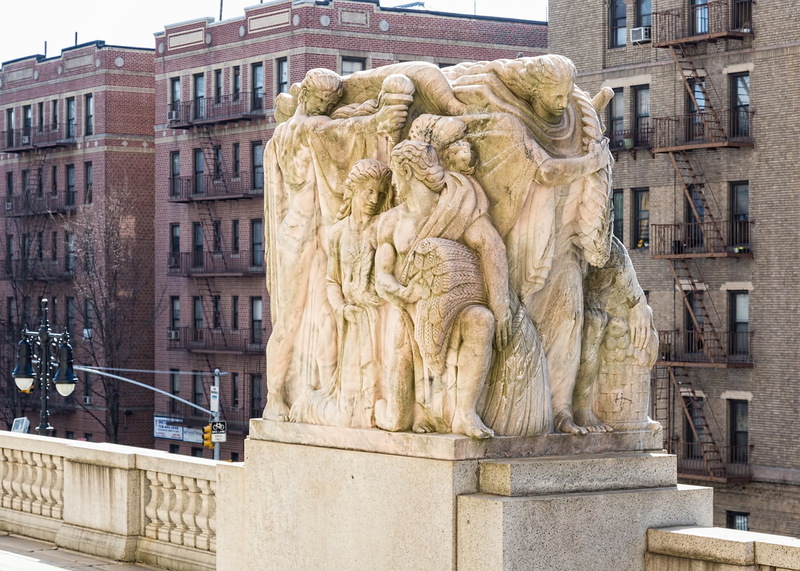 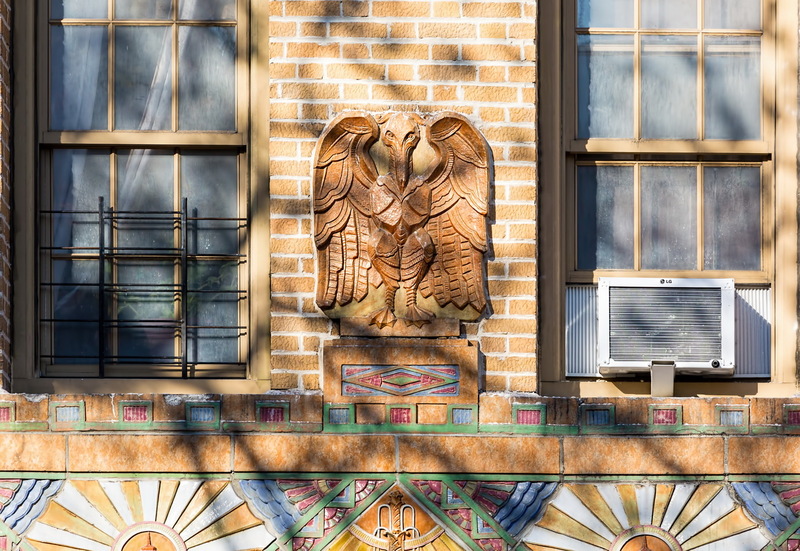 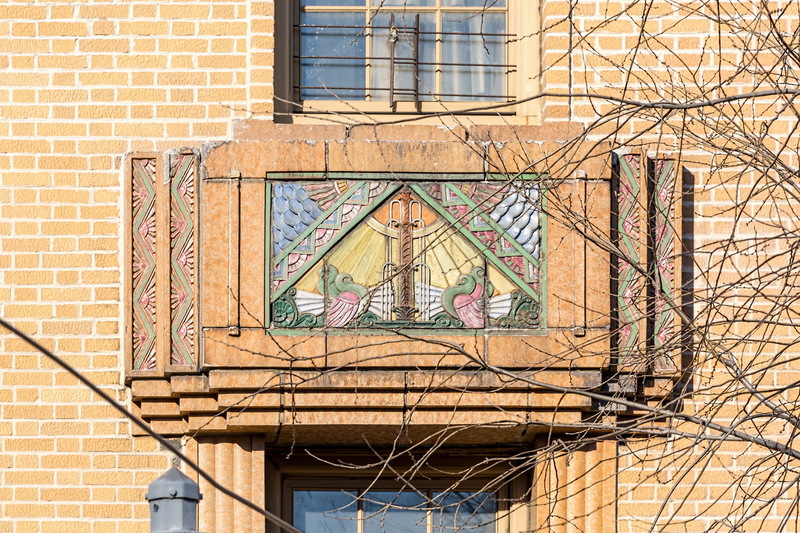 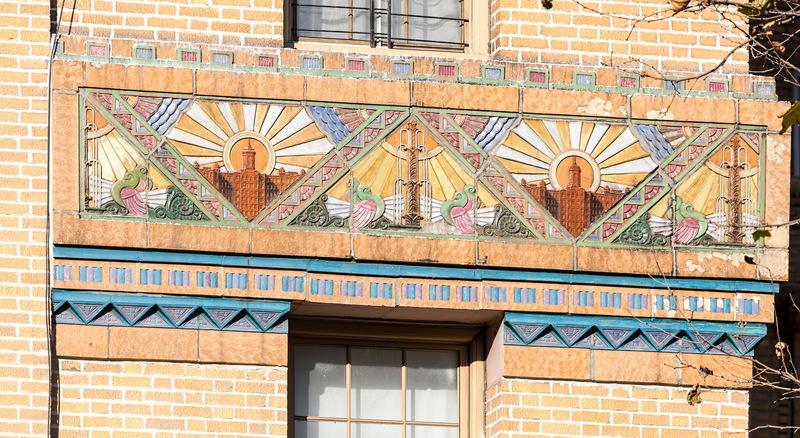 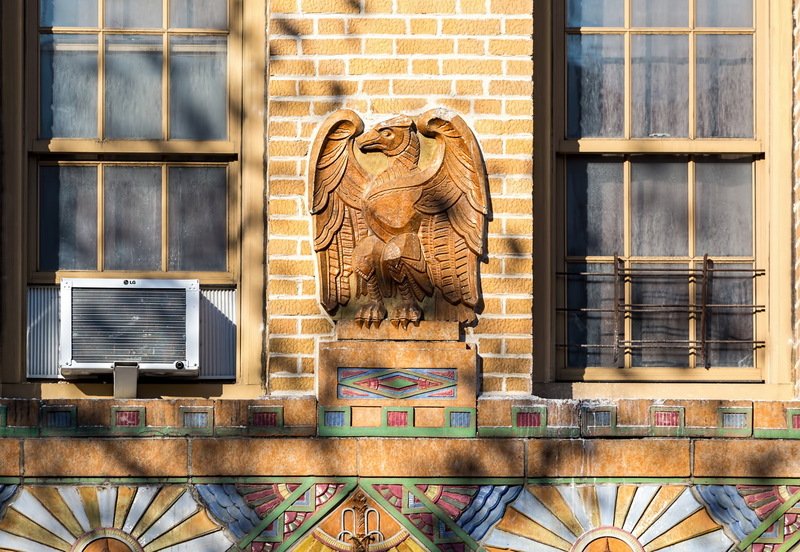 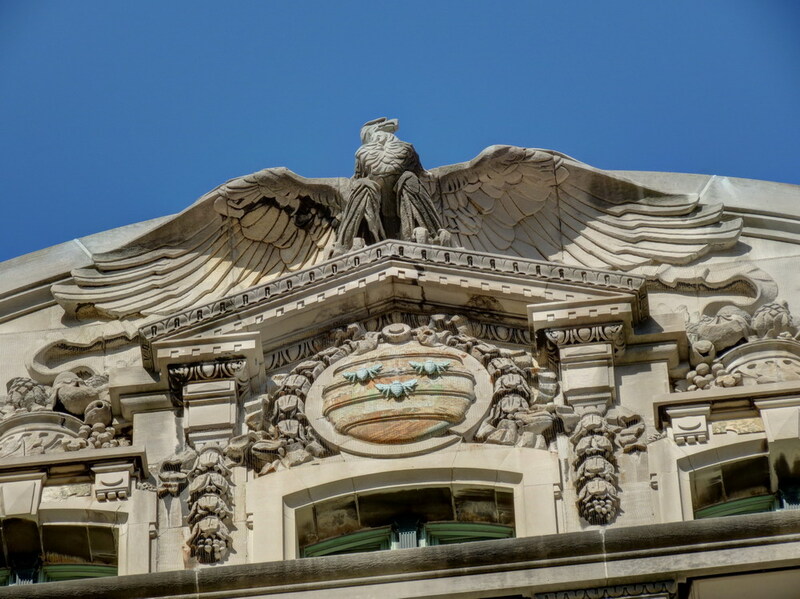 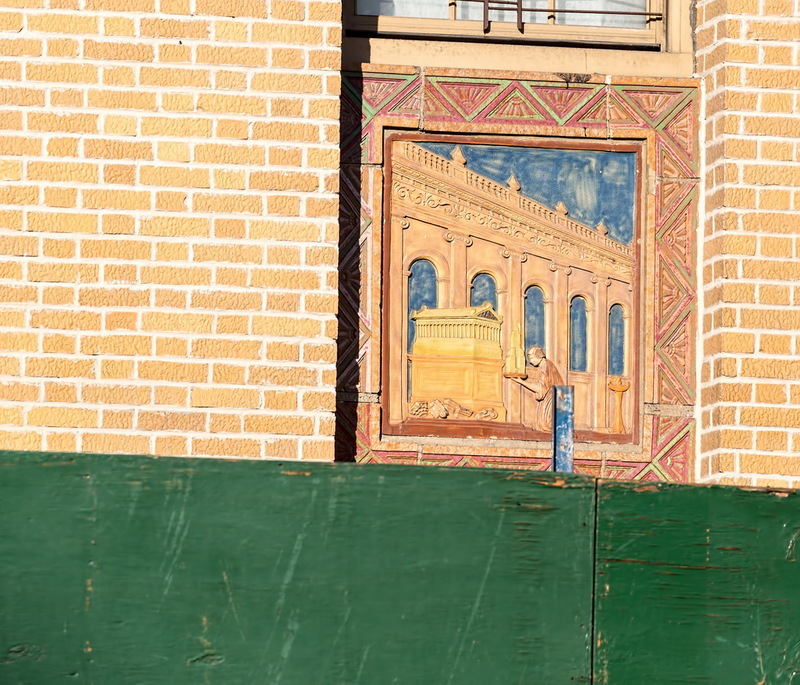 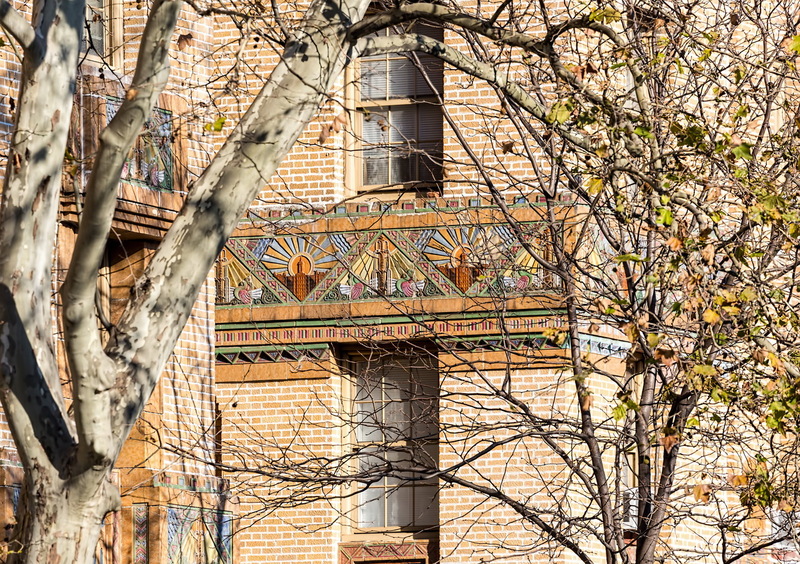 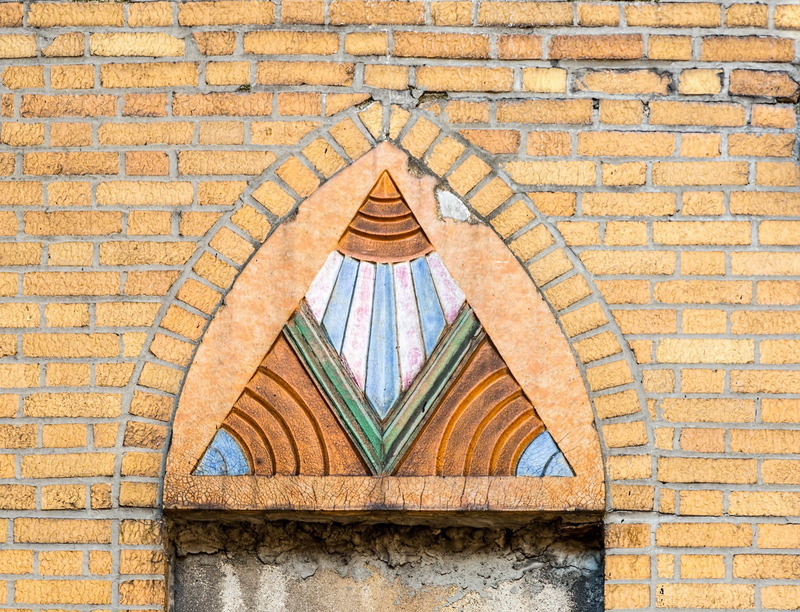 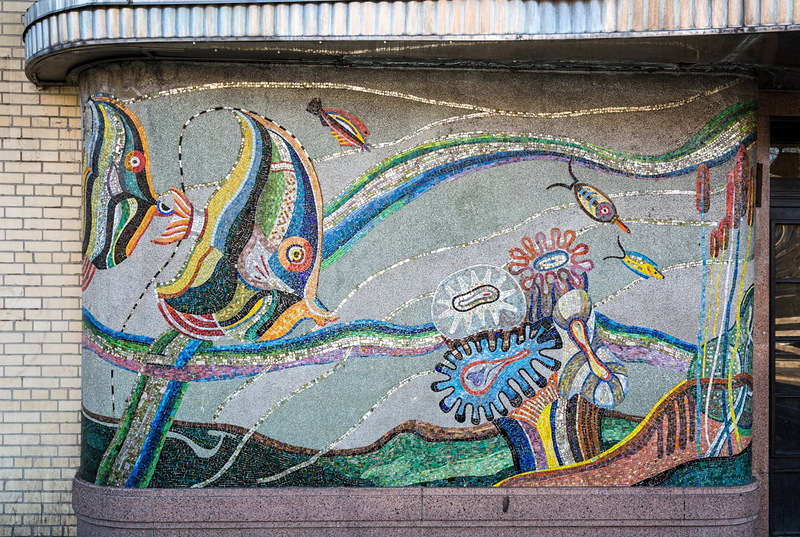 This Grand Concourse landmark gets its name from the aquarium motif mosaic at the main entry. 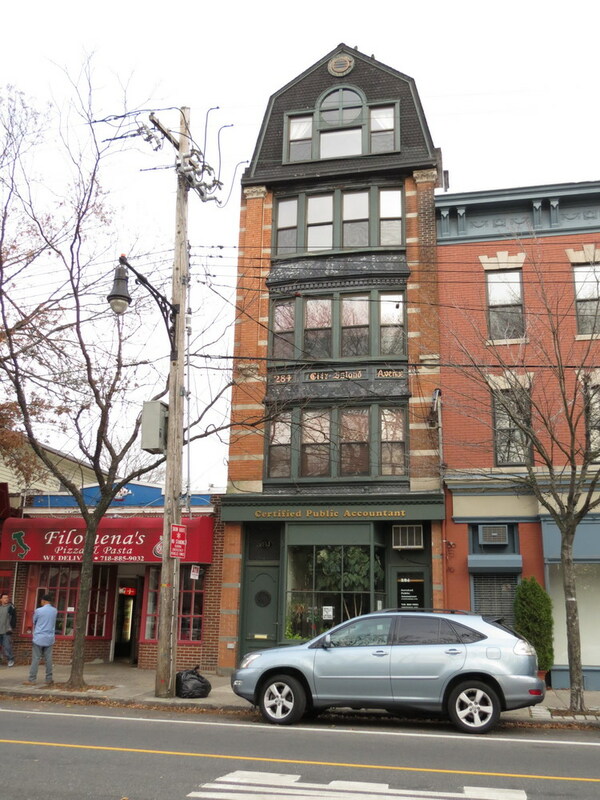 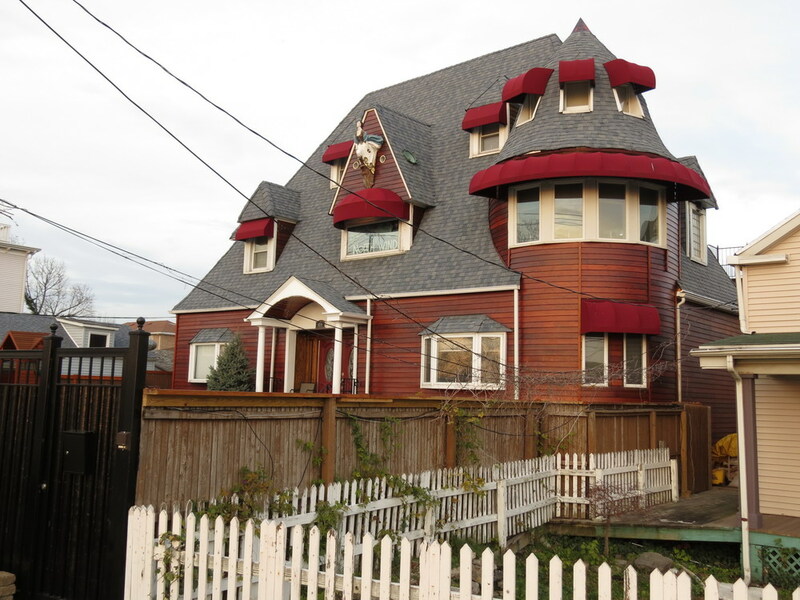 But Mr. Gray decries the structure’s decline. 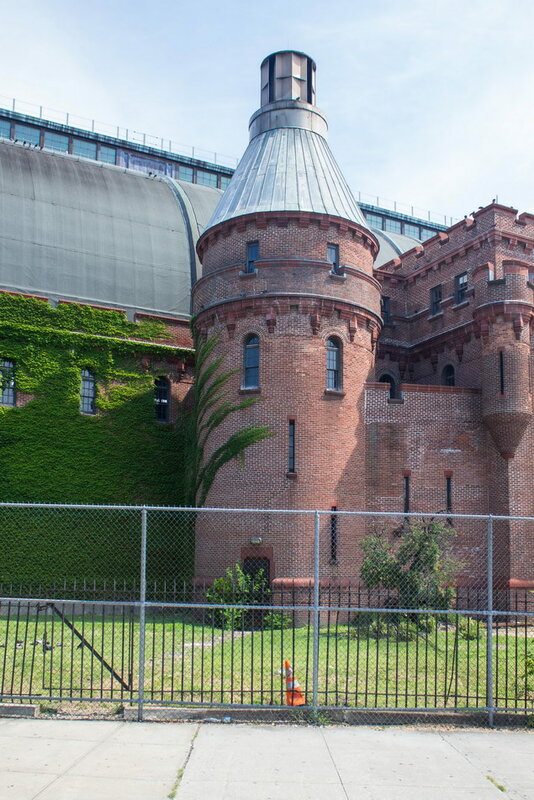 “HOW do old buildings disappear? 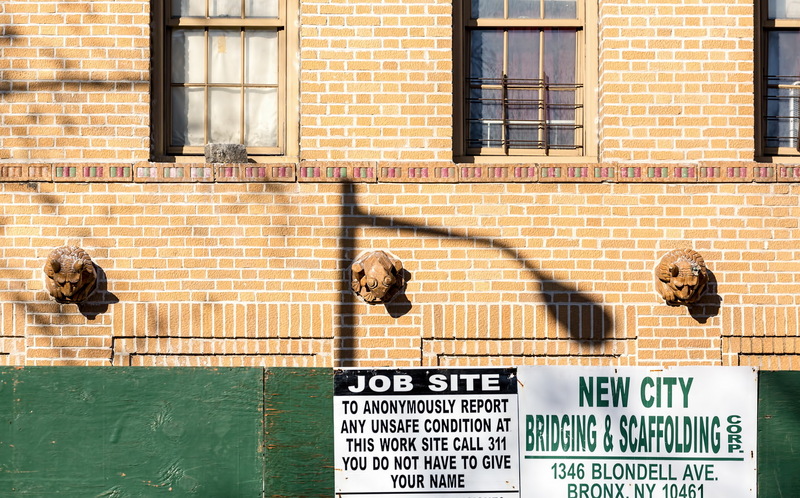 Sometimes all at once, under the wrecking ball. 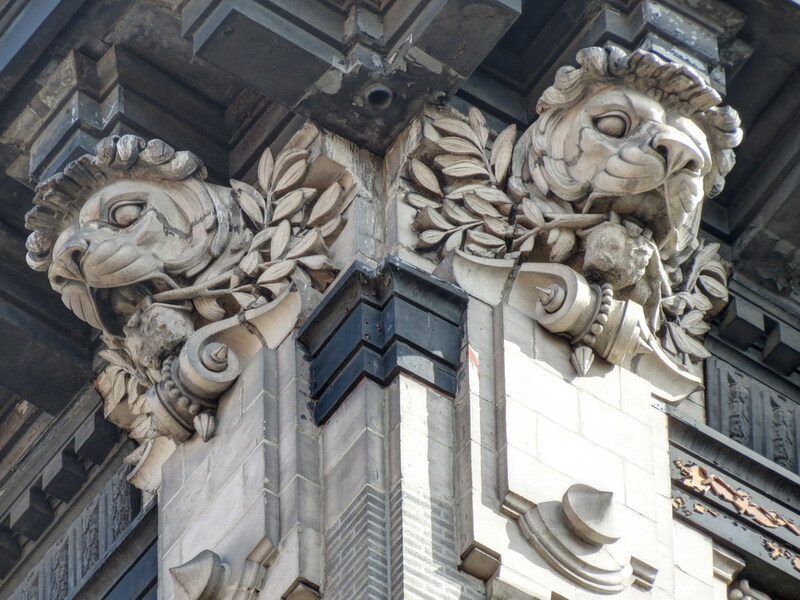 But more often they fade away on little cat’s feet, first the cornice, then a doorway, then the windows, then a balcony … leaving behind nothing but an architectural zombie.” And indeed, historical photos that accompany the Streetscapes column show an even more fantastic Fish Building existed some 50-odd years ago. 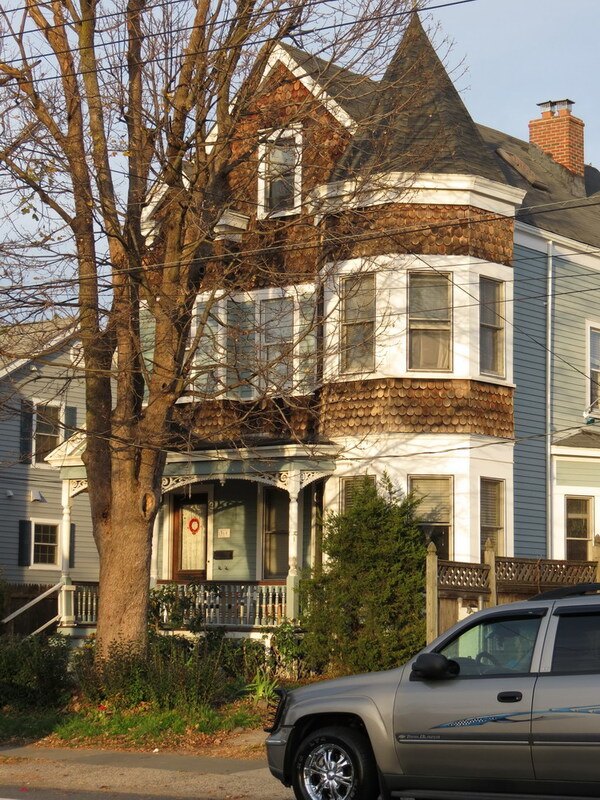 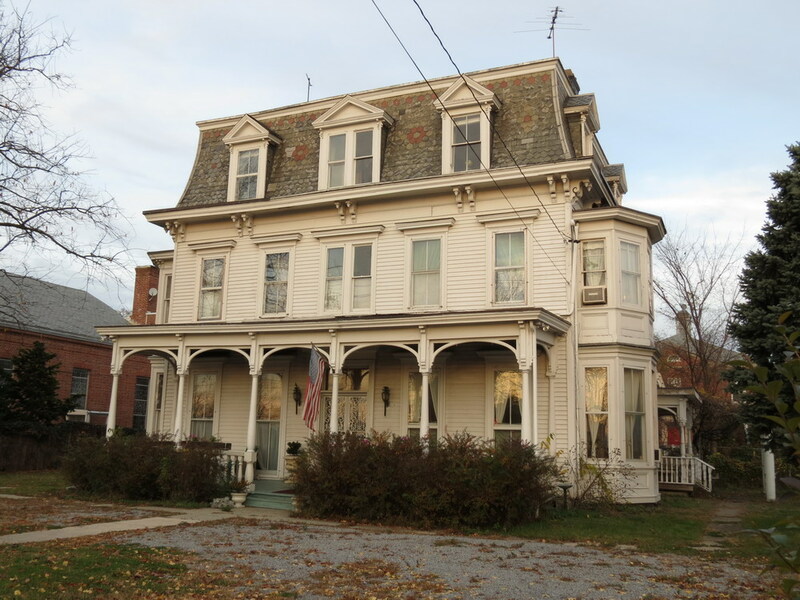 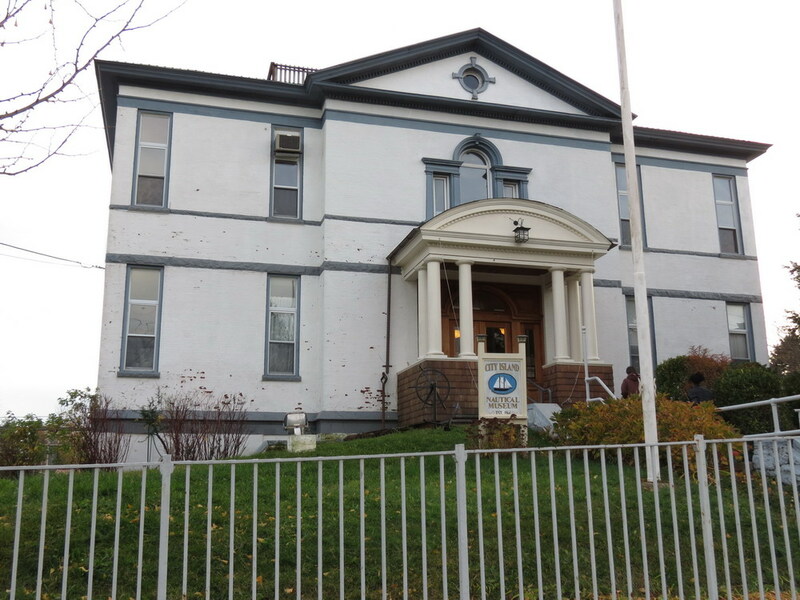 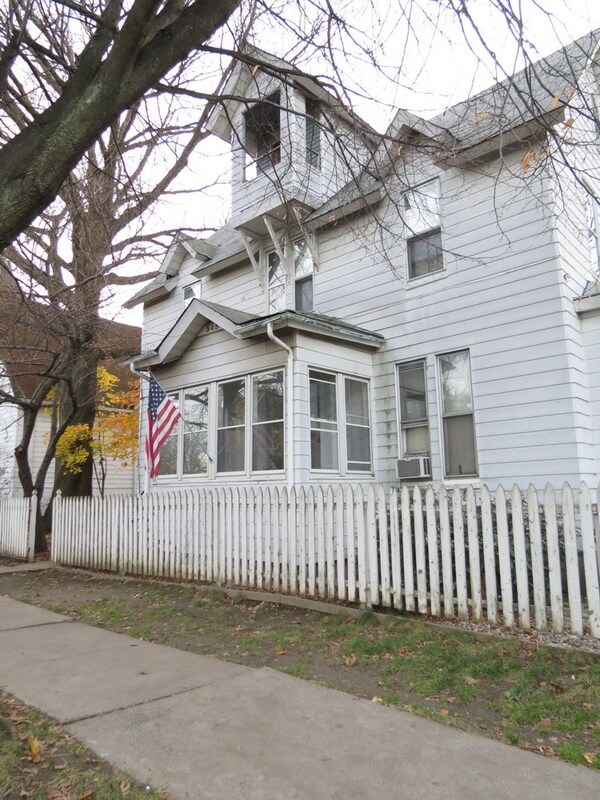 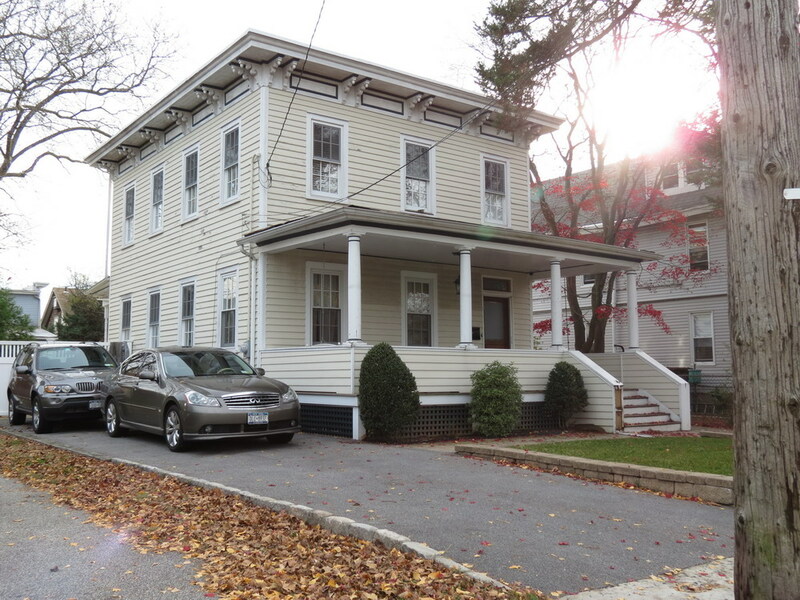 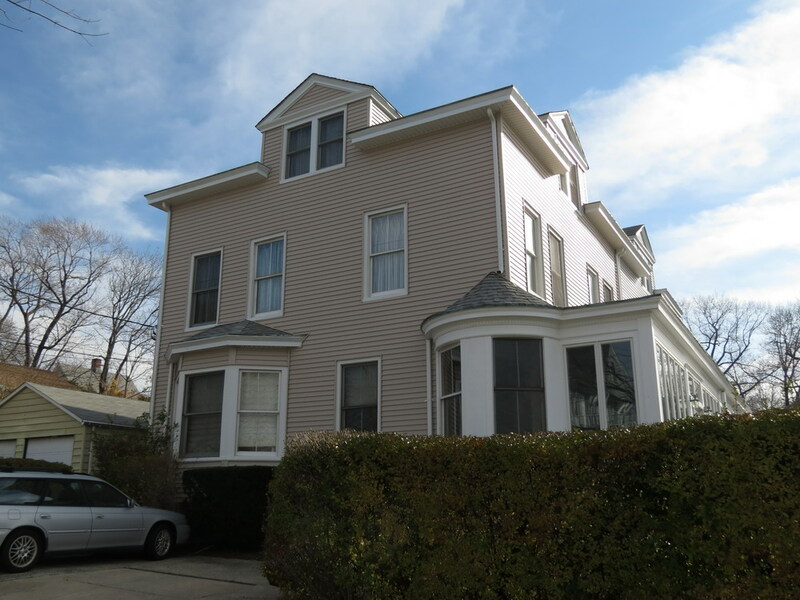 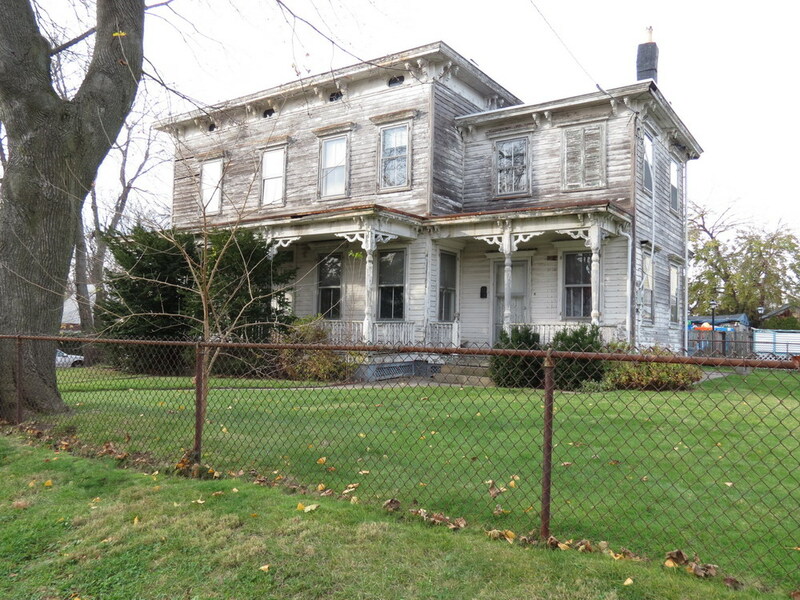 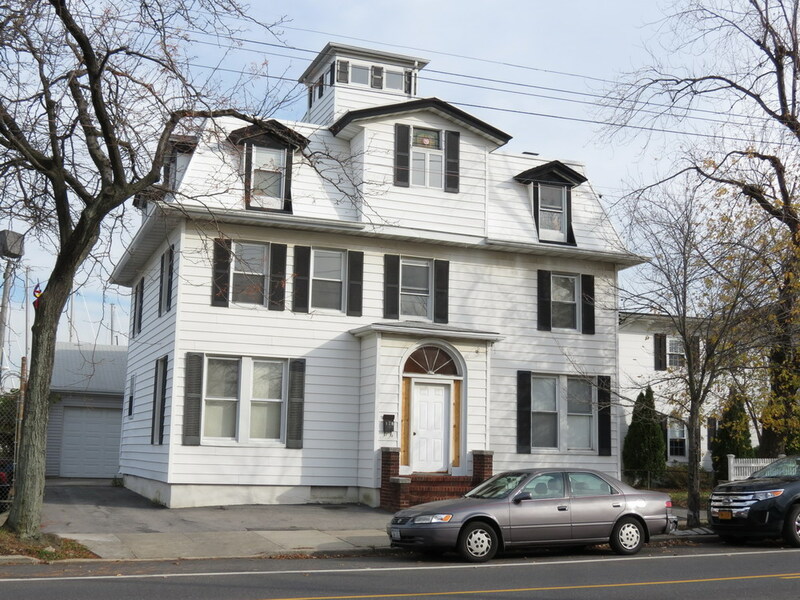 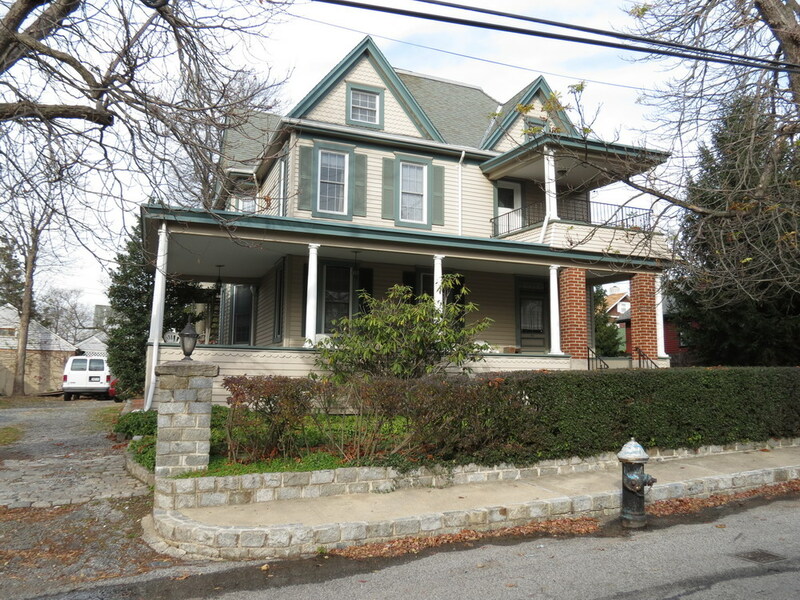 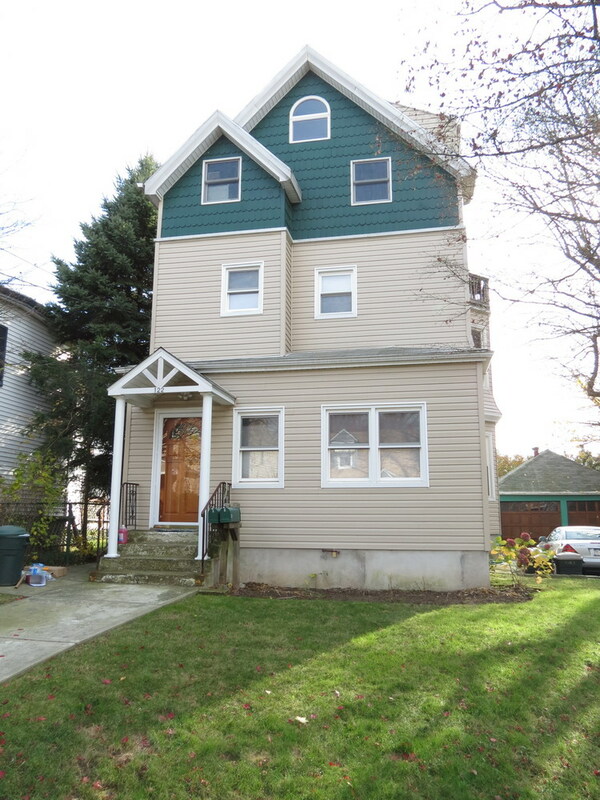 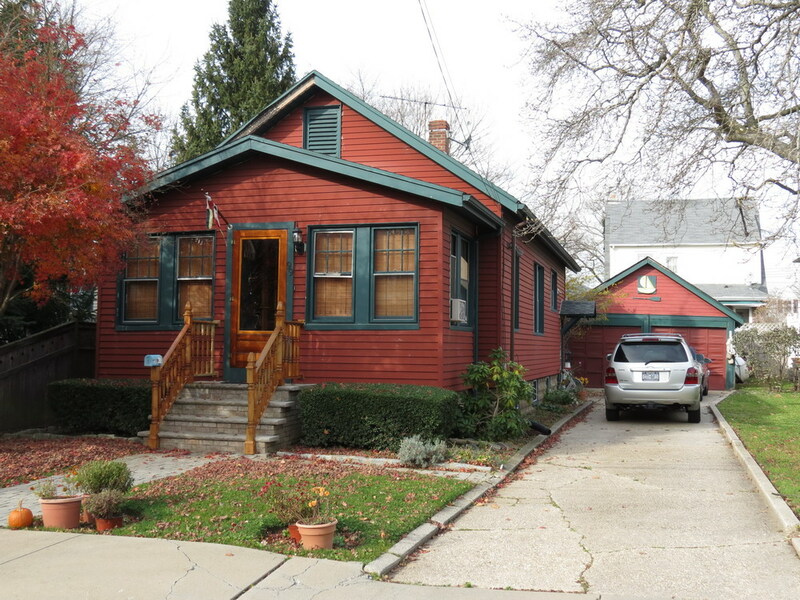 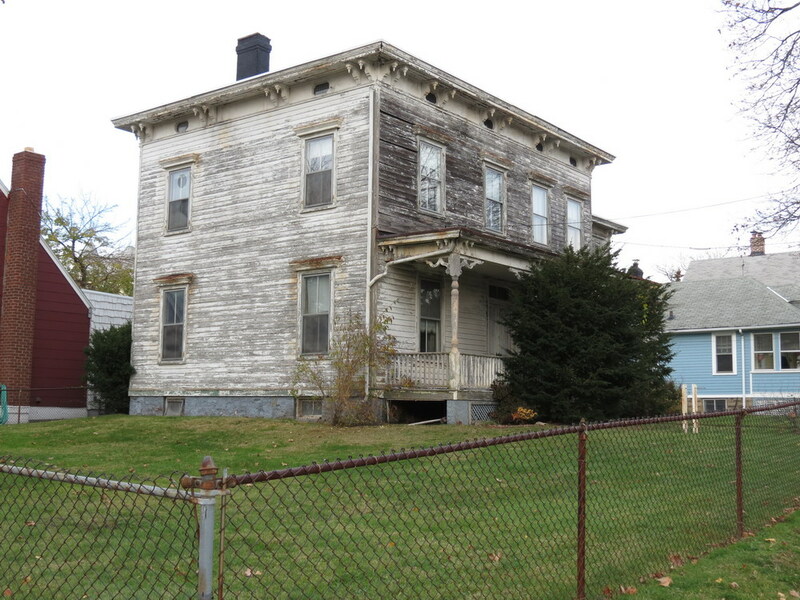 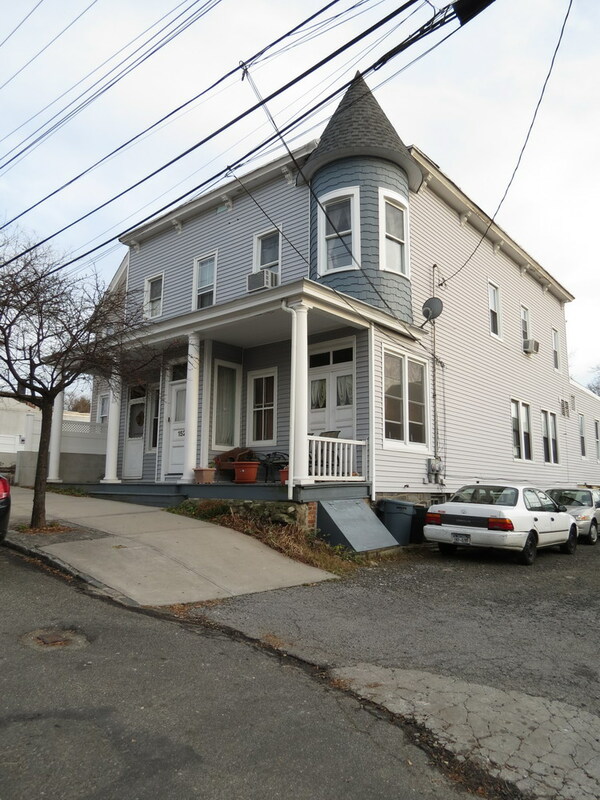 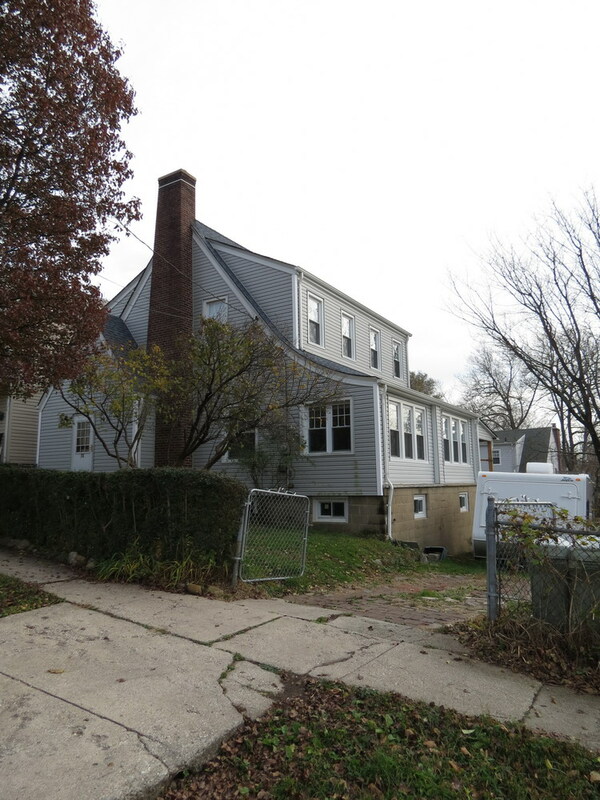 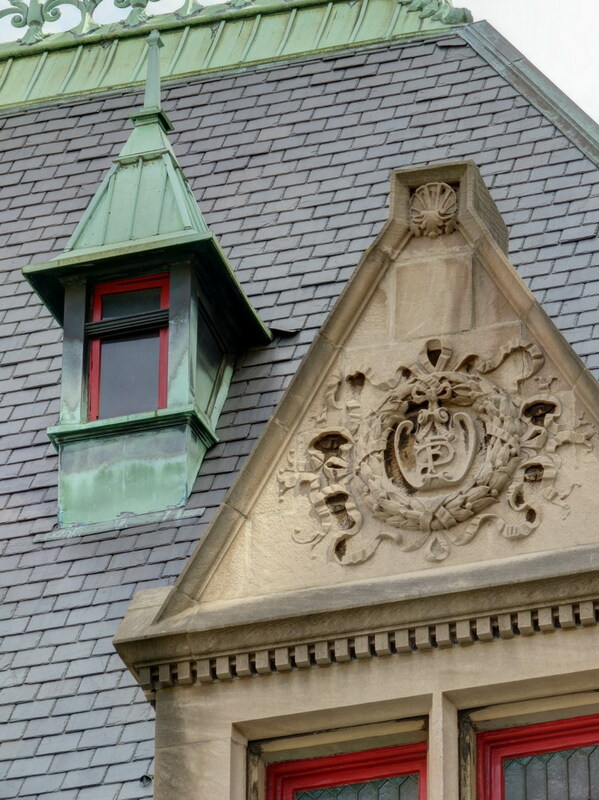 The original cornice, roof railing, windows and door have been replaced with unimaginative substitutes. 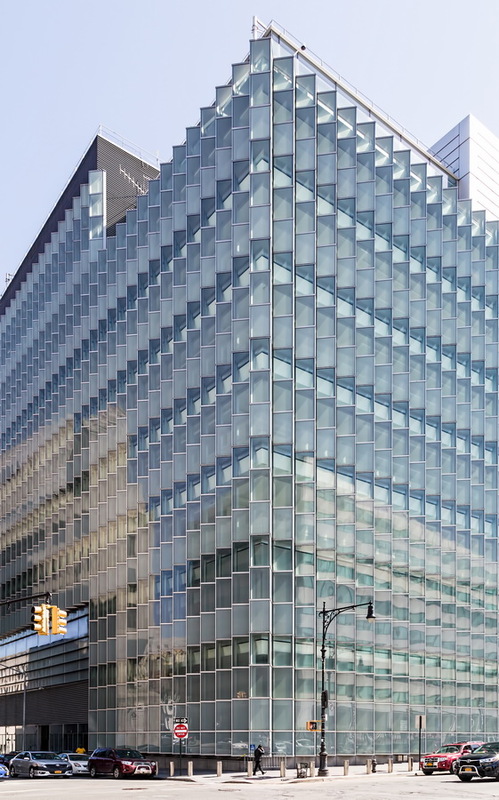 At least one aspect of the building’s design is permanent: Its adaptation to the irregular street grid. 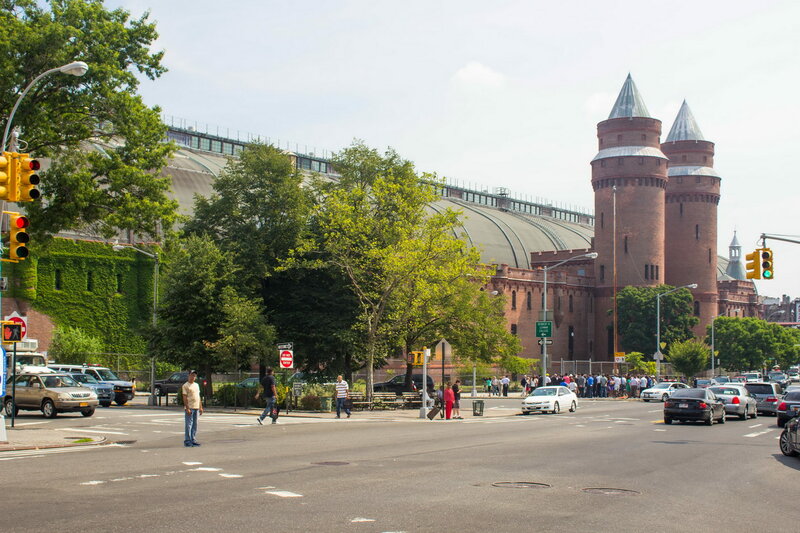 The Grand Concourse was designed as a scenic boulevard, and as such it meanders to follow the terrain, often at an odd angle to the street grid. 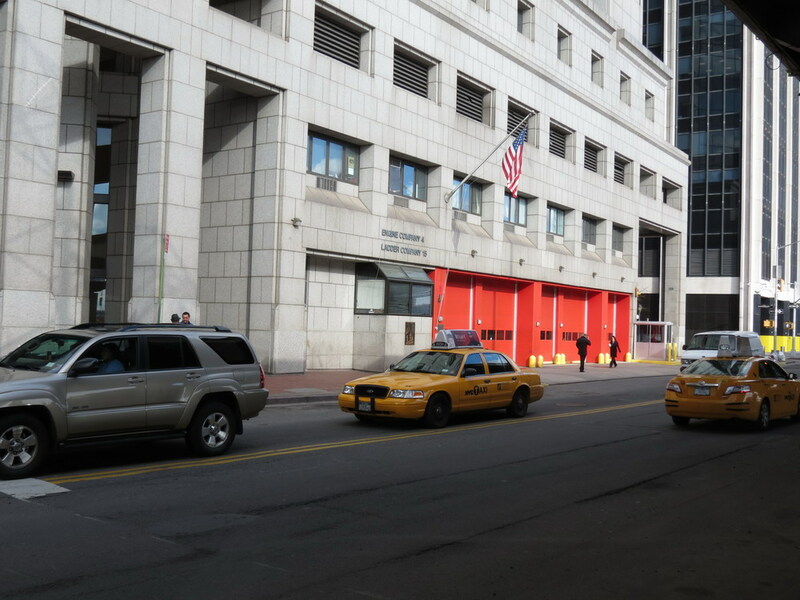 Such is the case at Mc Clellan Street. 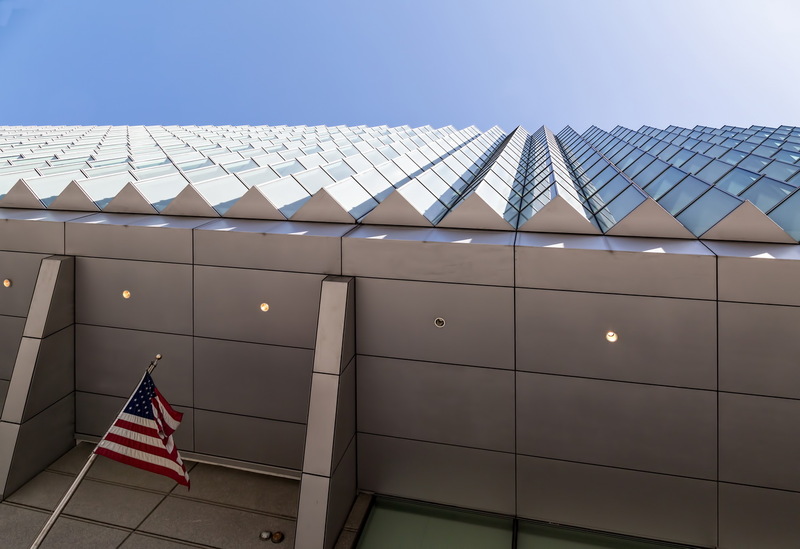 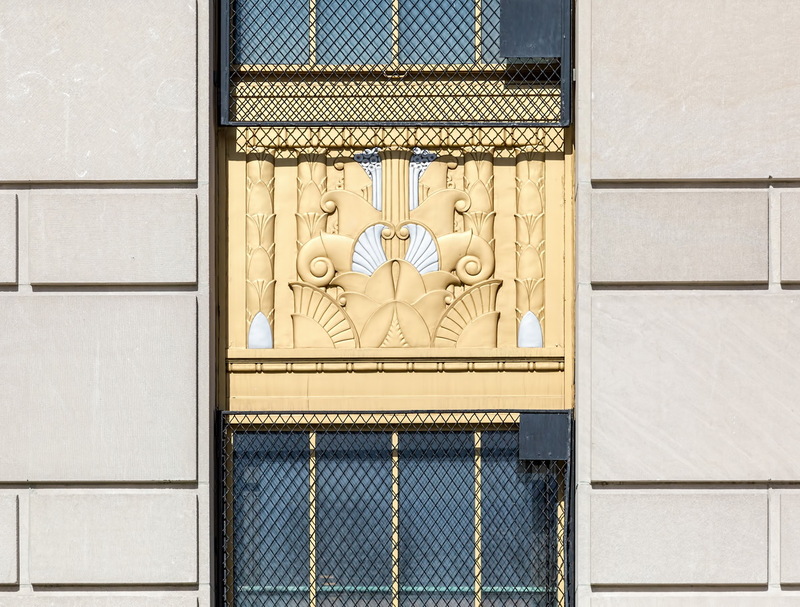 The Fish Building accommodates the boulevard’s zig with a stepped western facade that artfully hides the skewed grid, and keeps apartment walls rectangular. 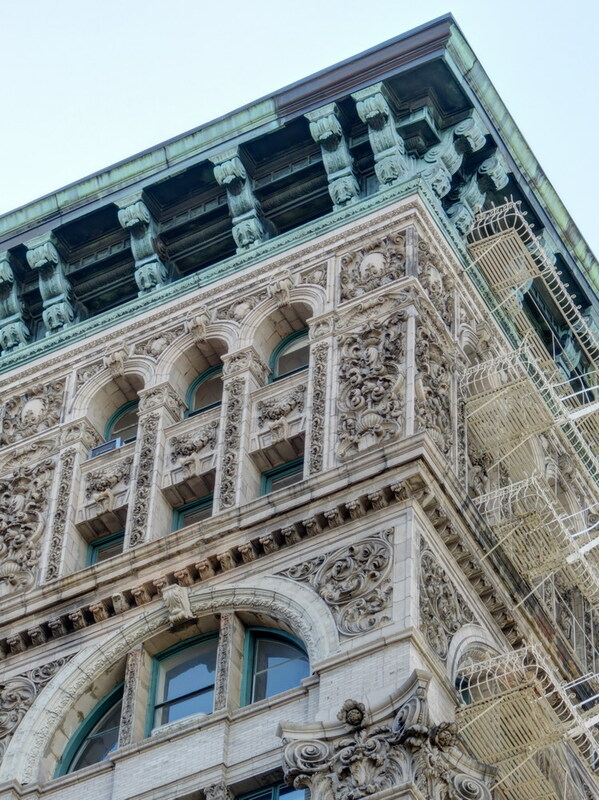 See the floor plans from Columbia University’s New York Real Estate Brochure Collection. 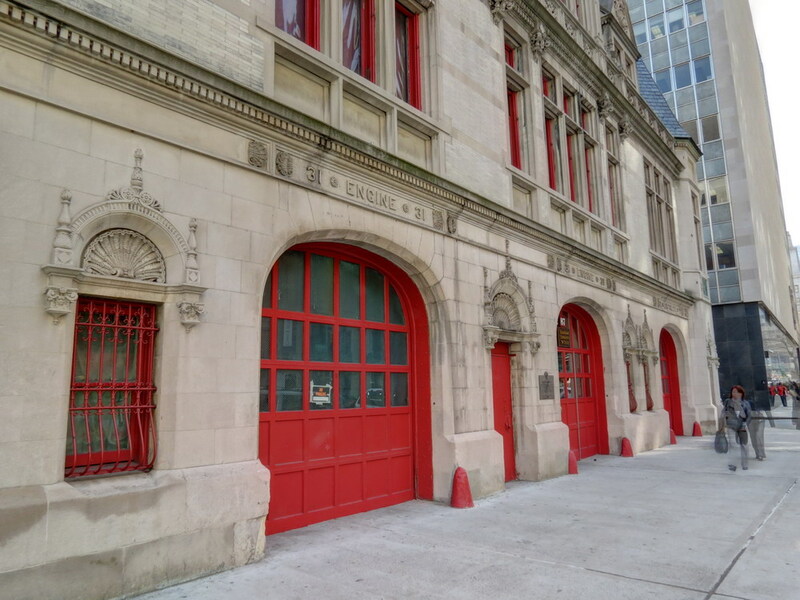 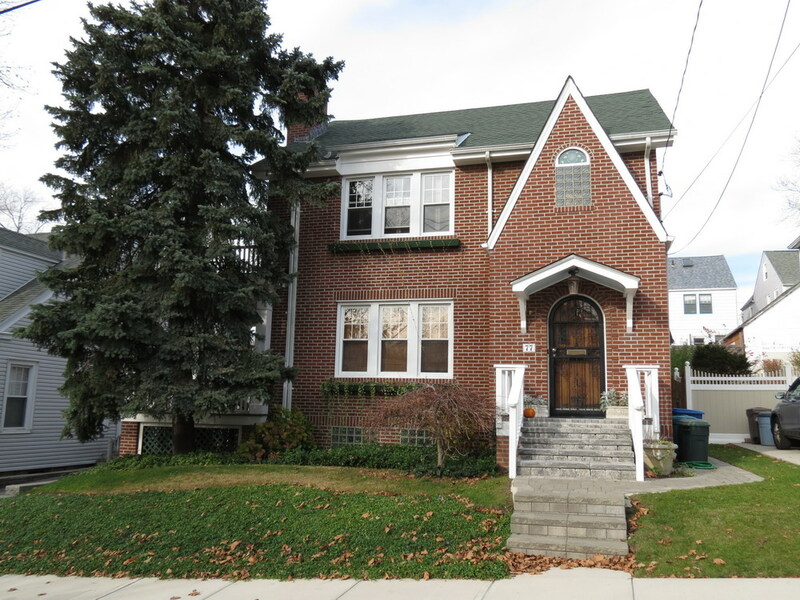 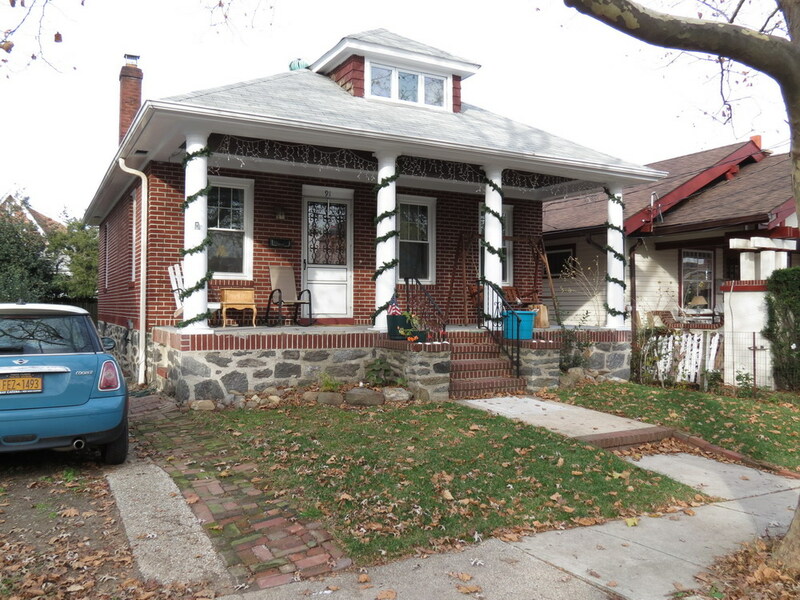 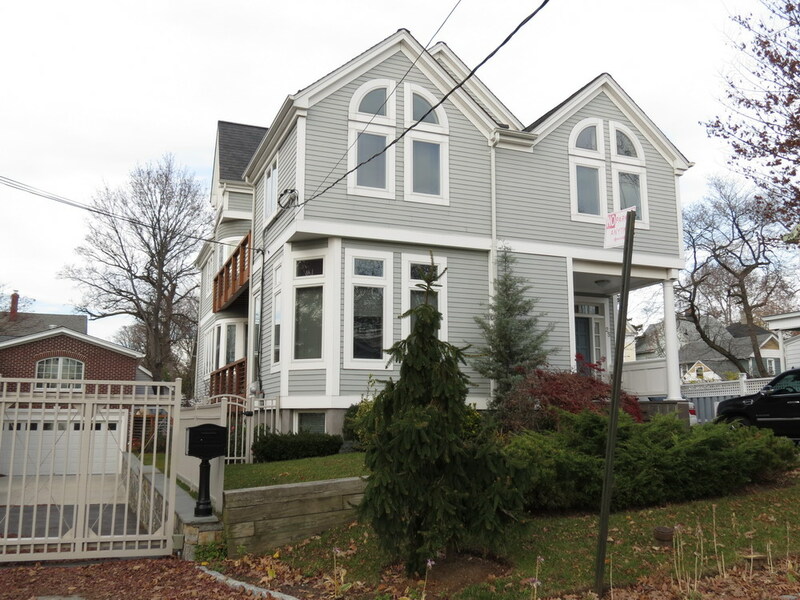 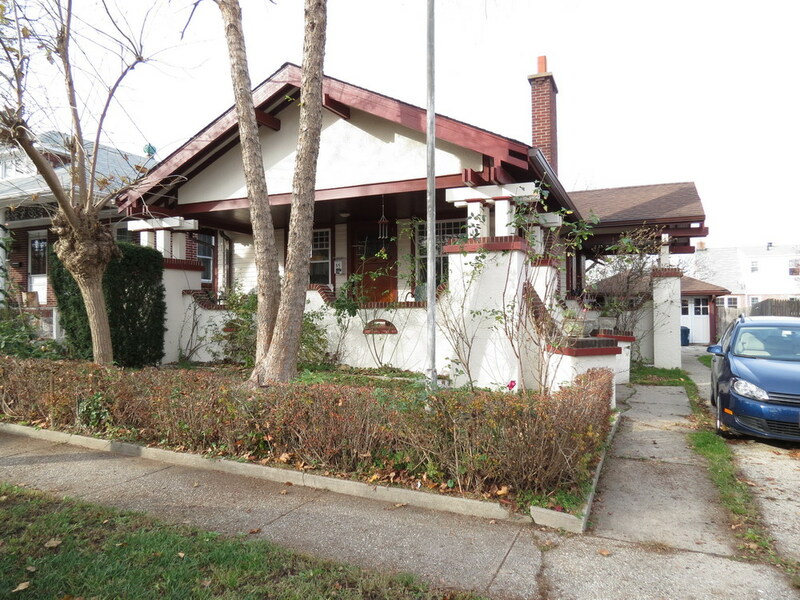 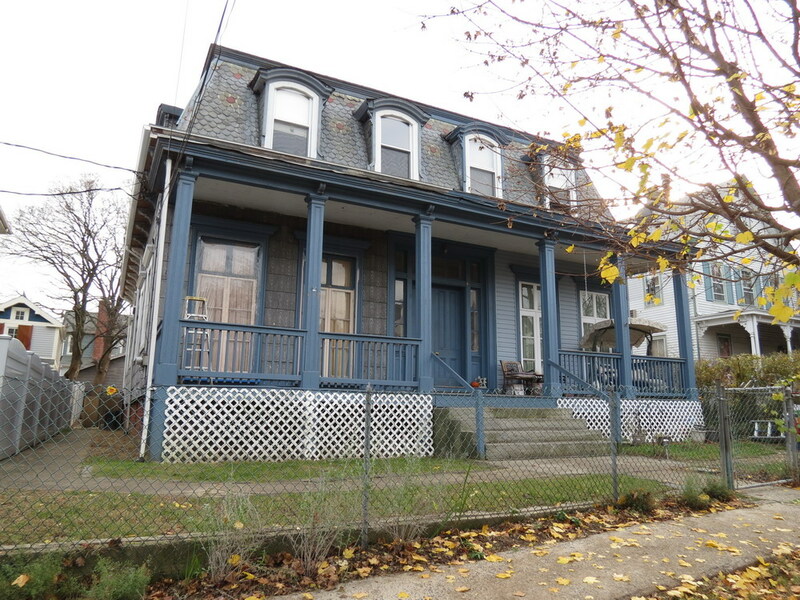 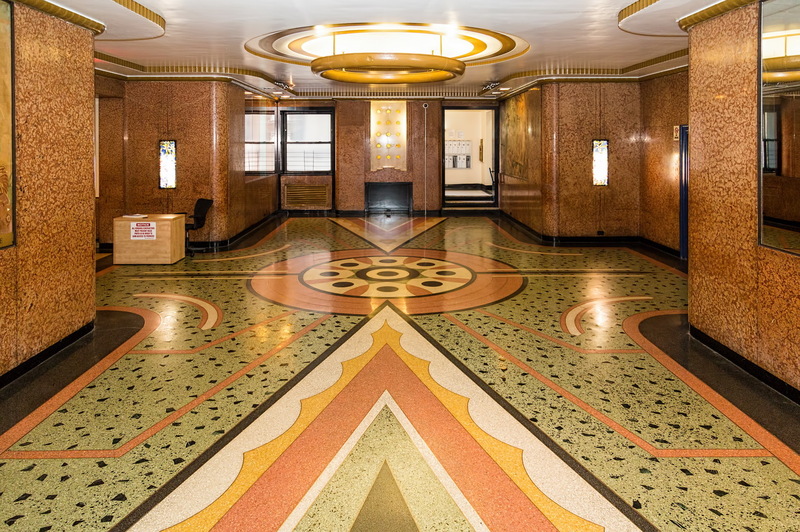 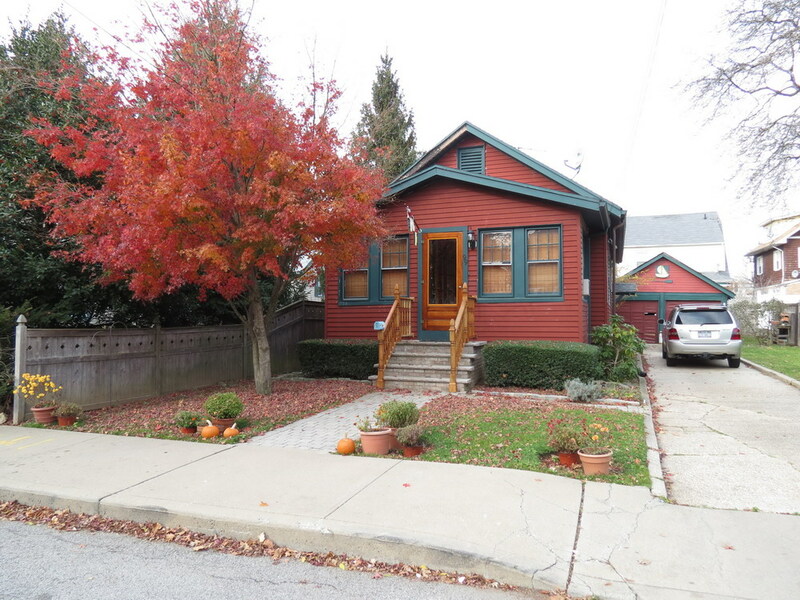 If the outside of 1150 Grand Concourse is exceptional, the inside is absolutely stunning. 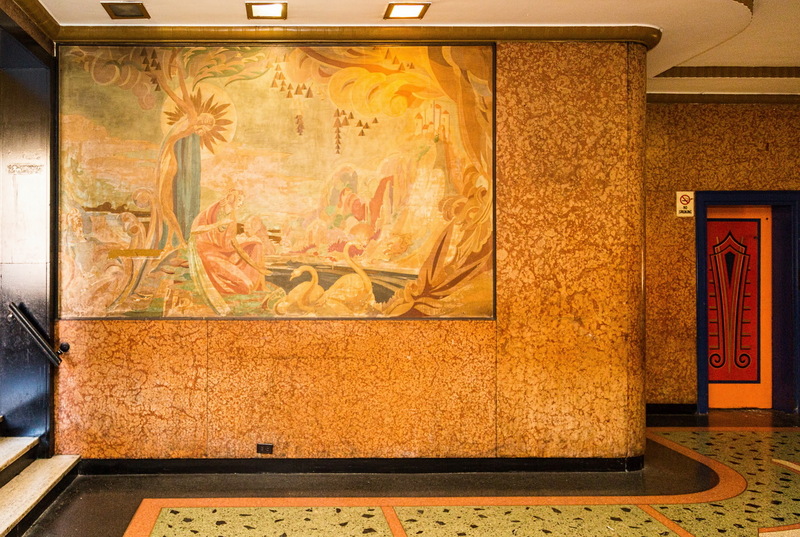 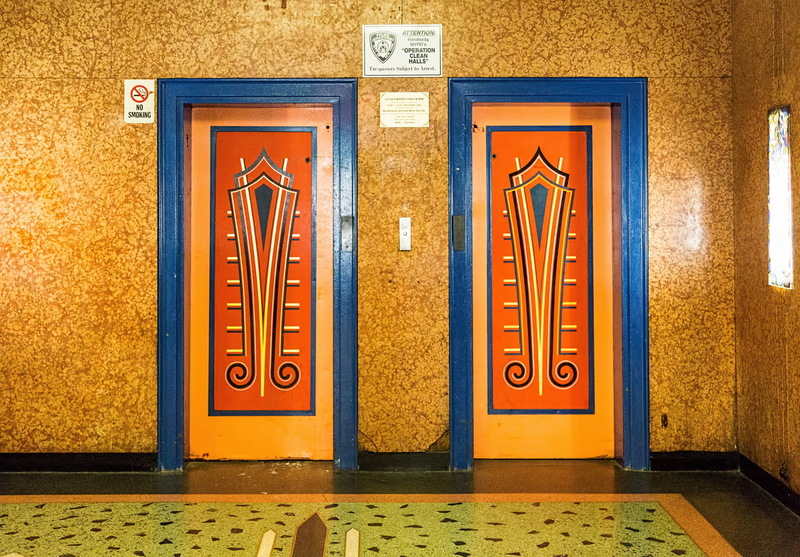 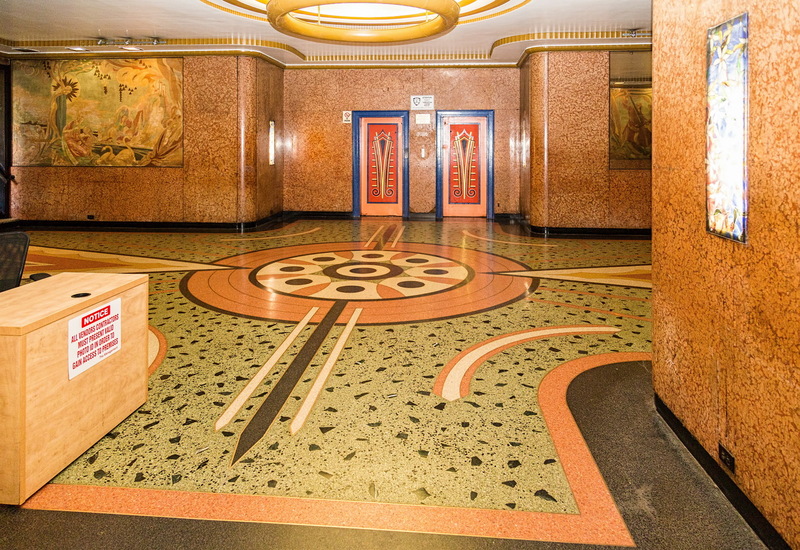 The terrazzo floor, murals, light fixtures and boldly decorated elevators are a joy to behold. 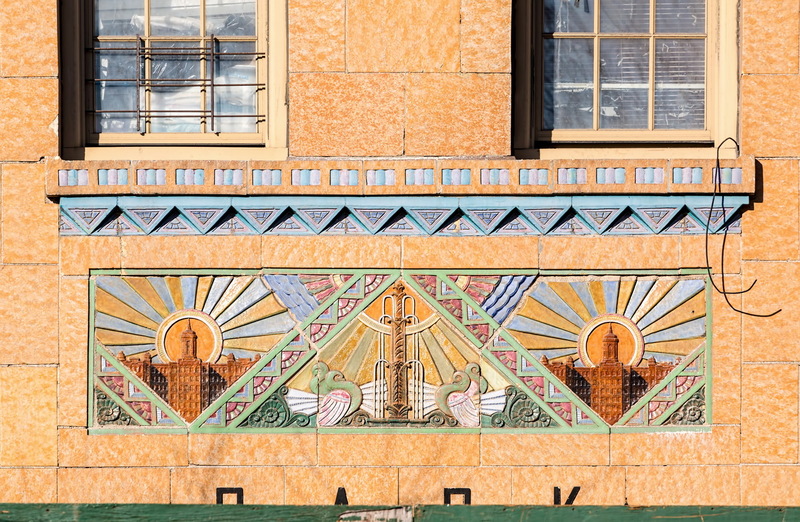 If the Fish Building leaves you wanting more, you can visit nearby Park Plaza Apartments. 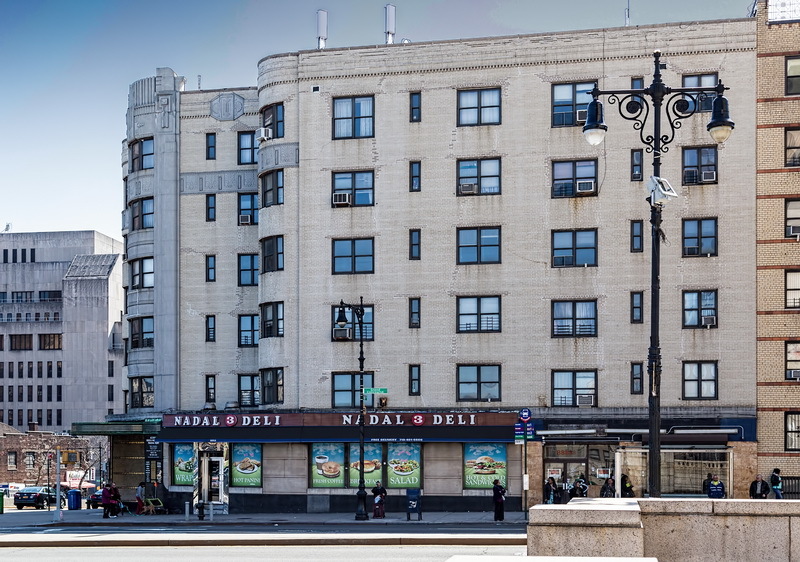 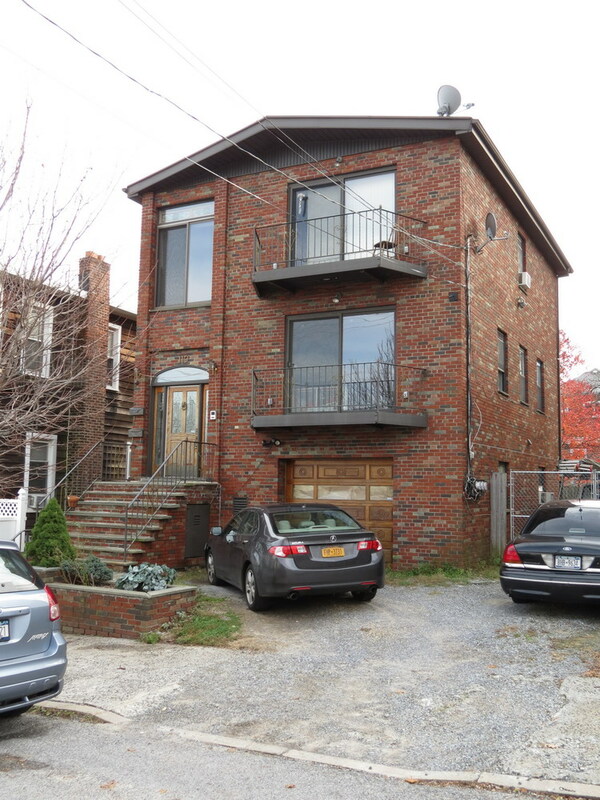 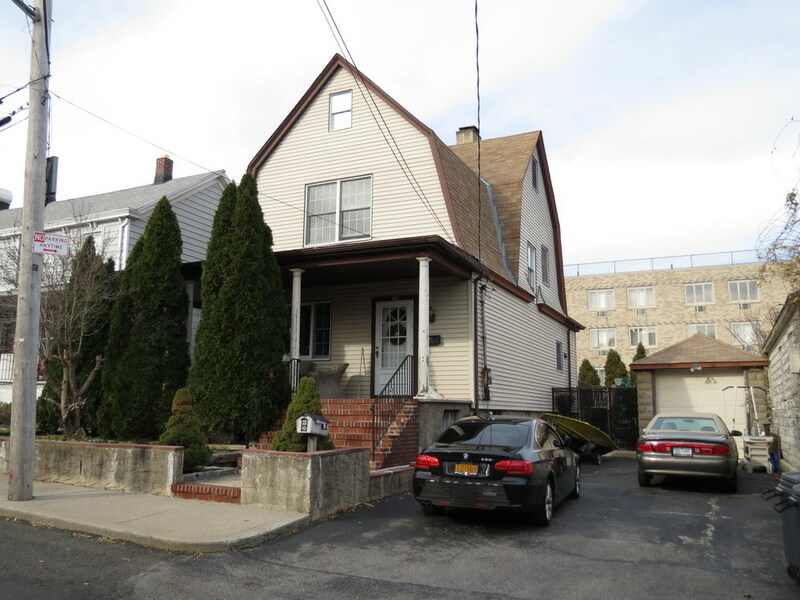 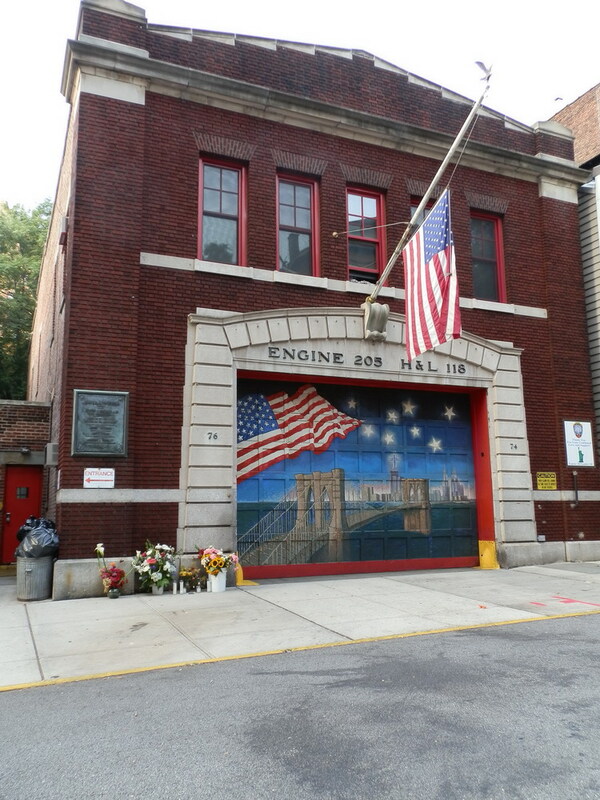 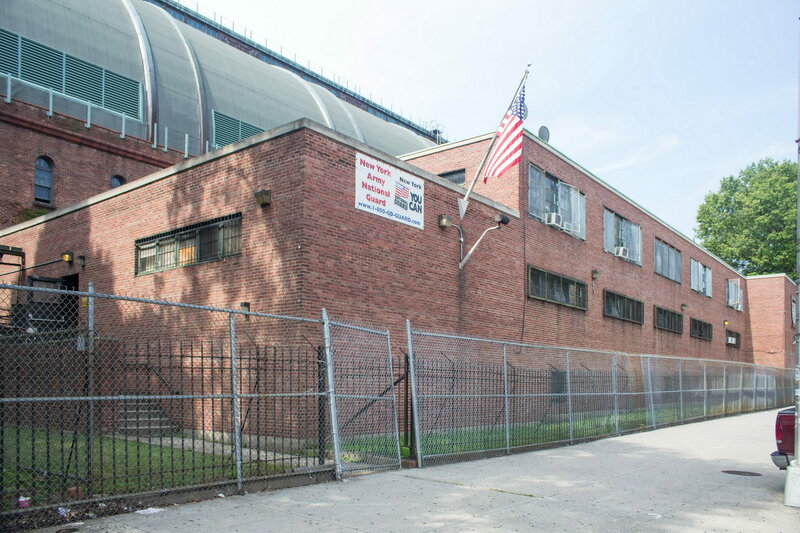 It’s located at 1005 Jerome Avenue, across the street from Yankee Stadium. 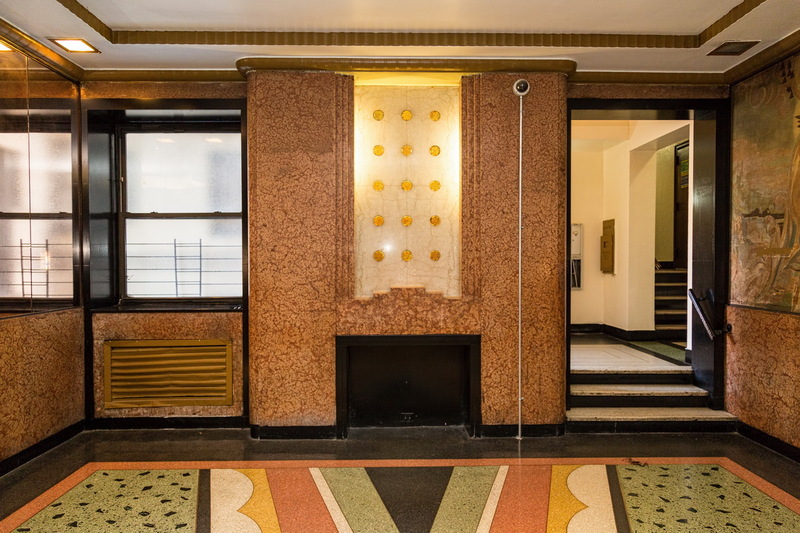 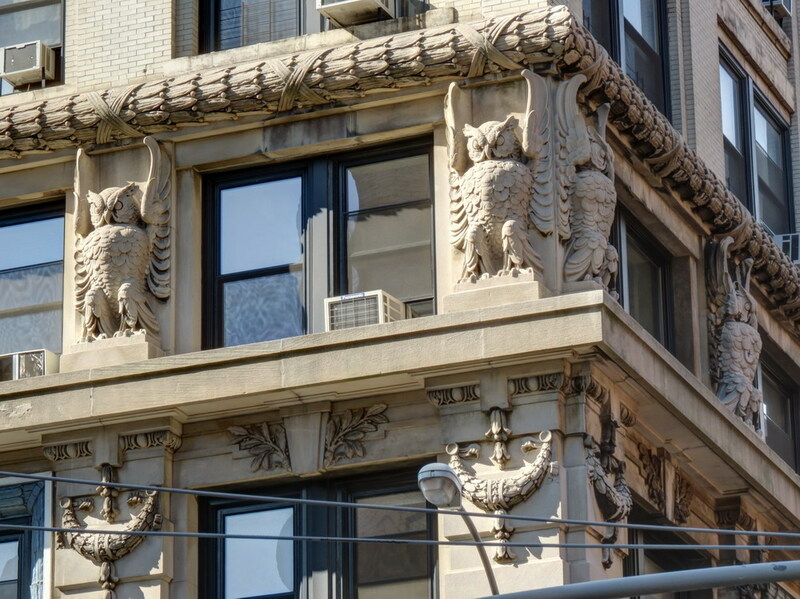 This grander-scaled apartment building was also designed in Art Deco style by Ginsbern and Fine. 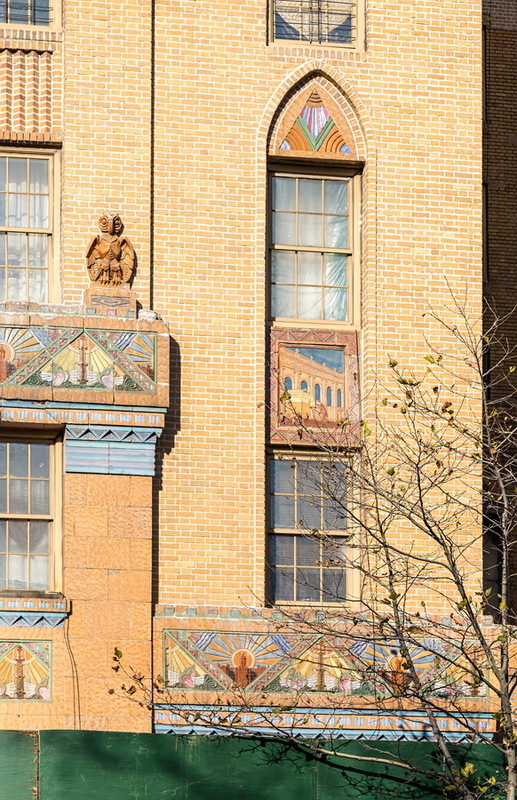 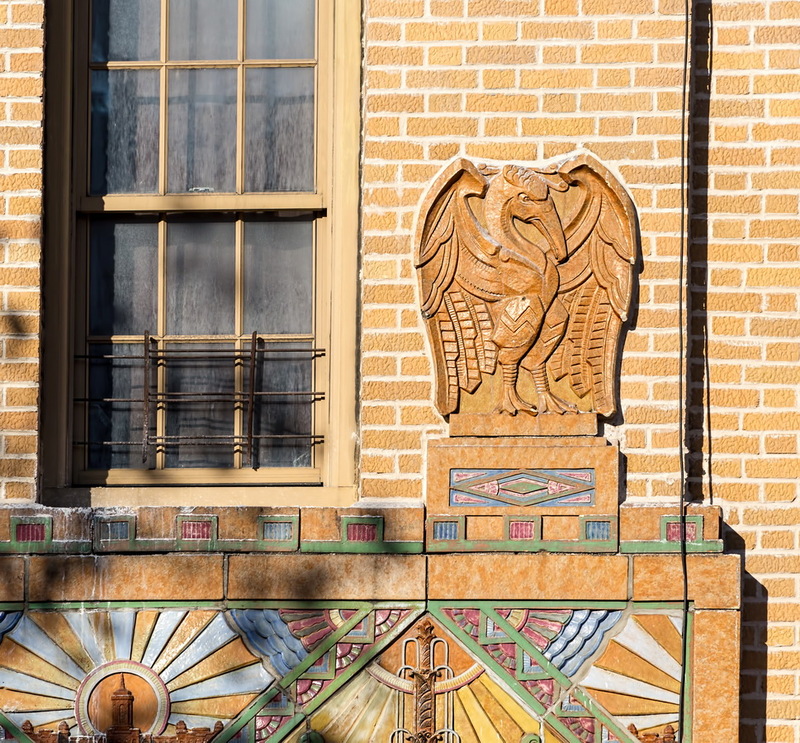 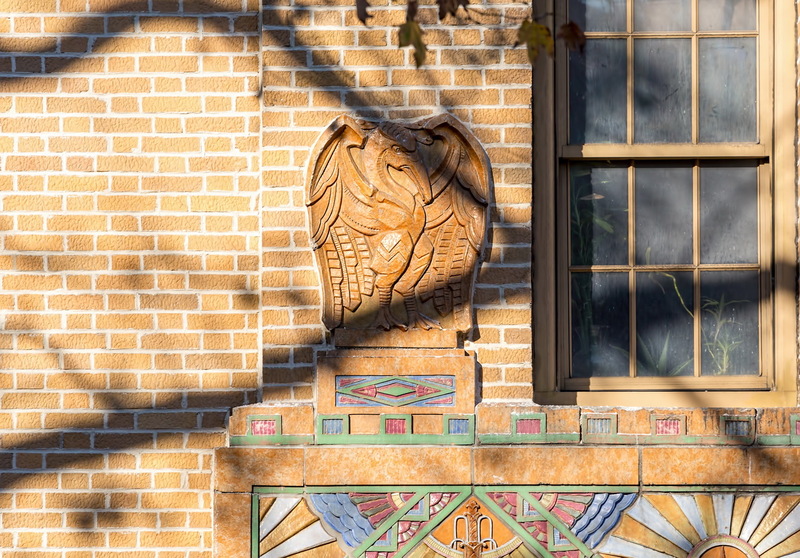 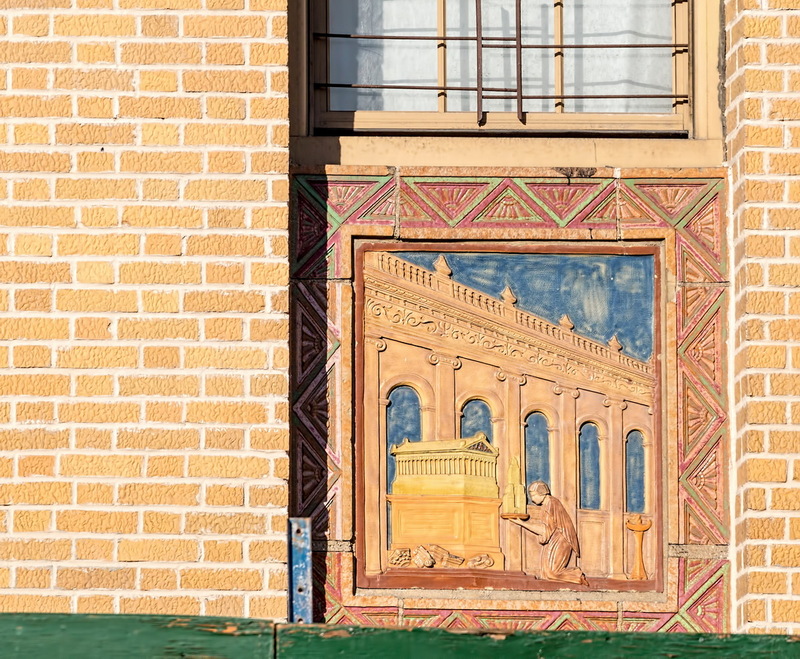 It features bold, colorful terra cotta details definitely worth the trip. 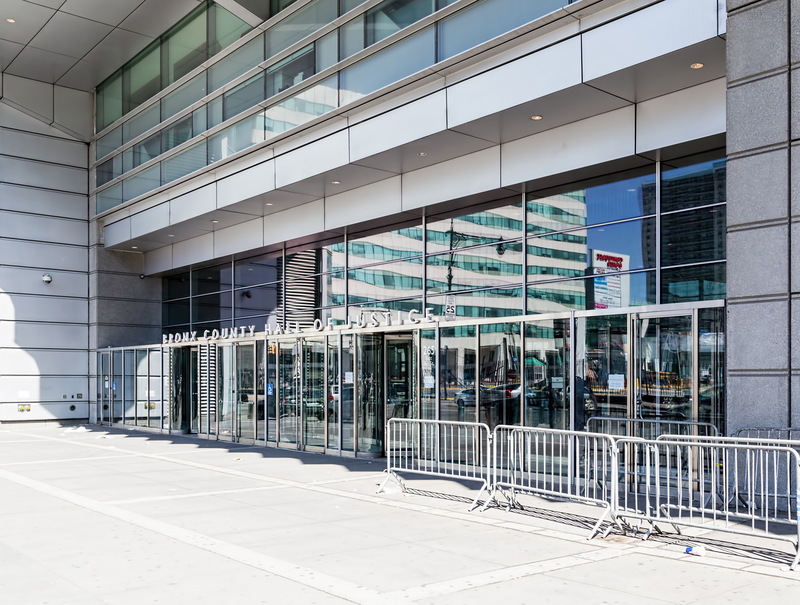 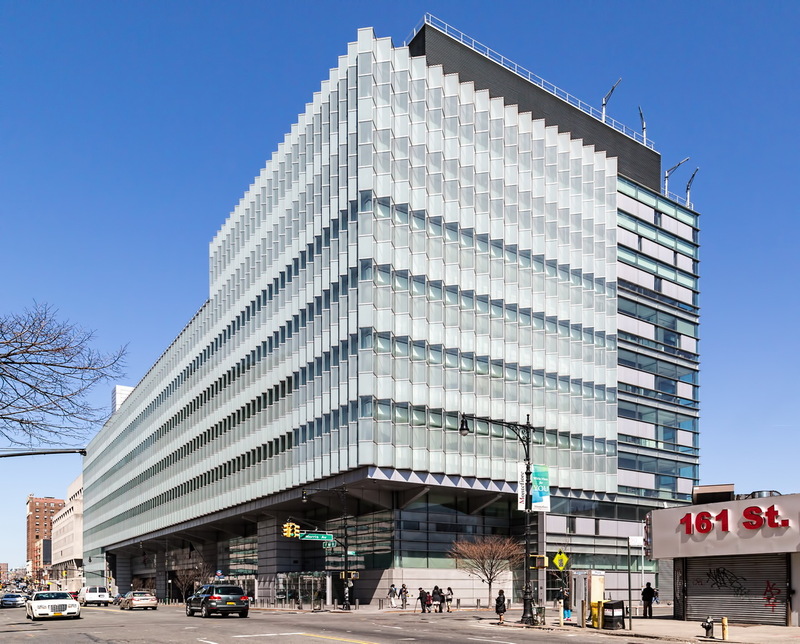 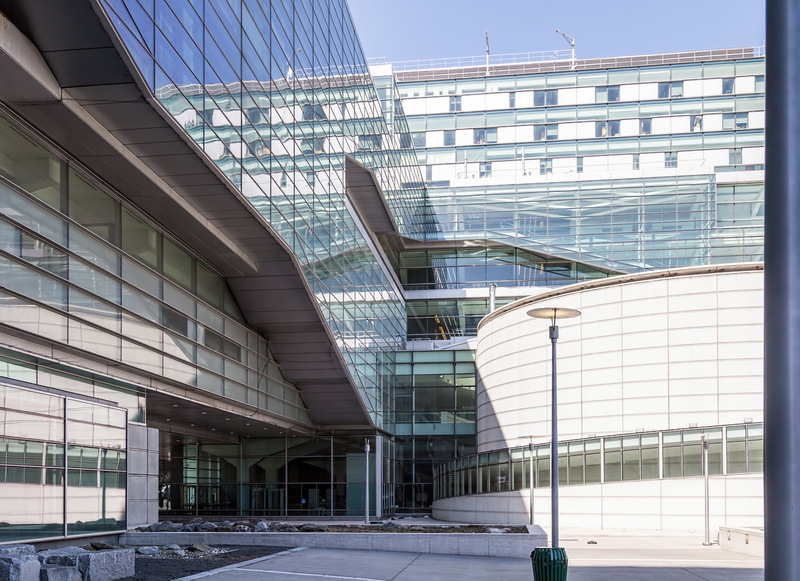 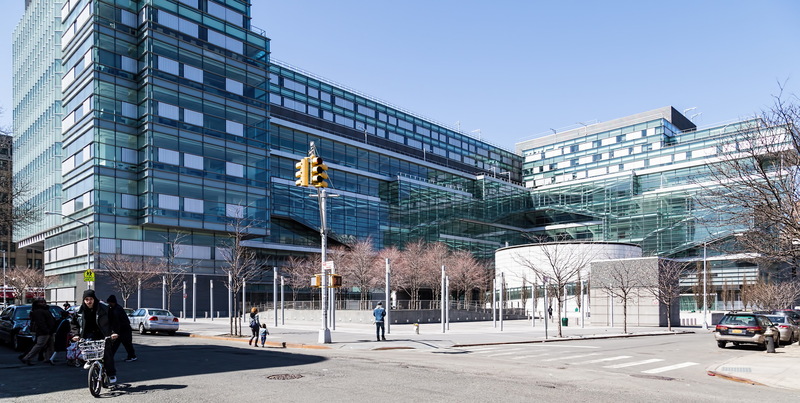 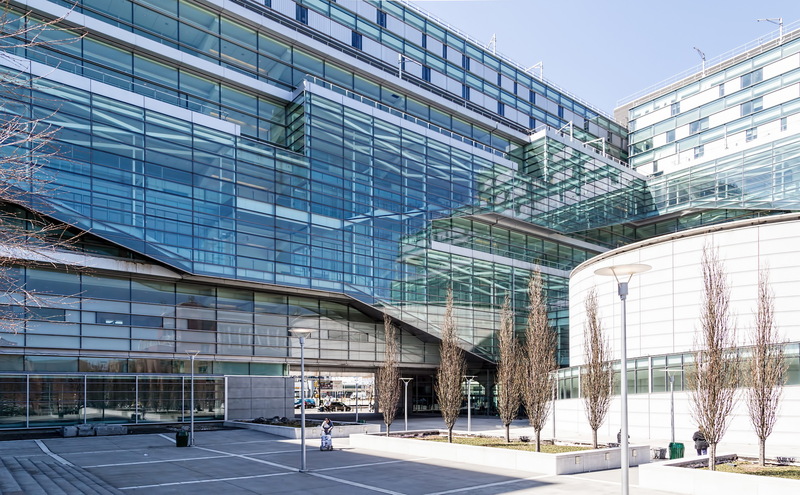 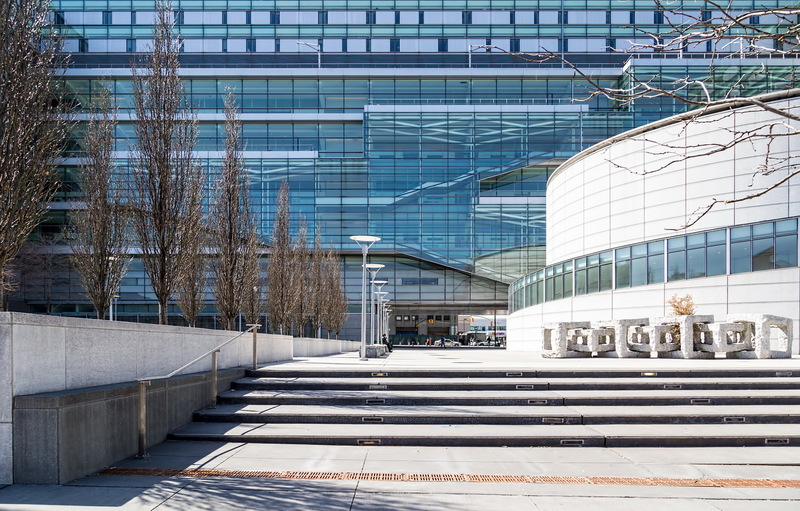 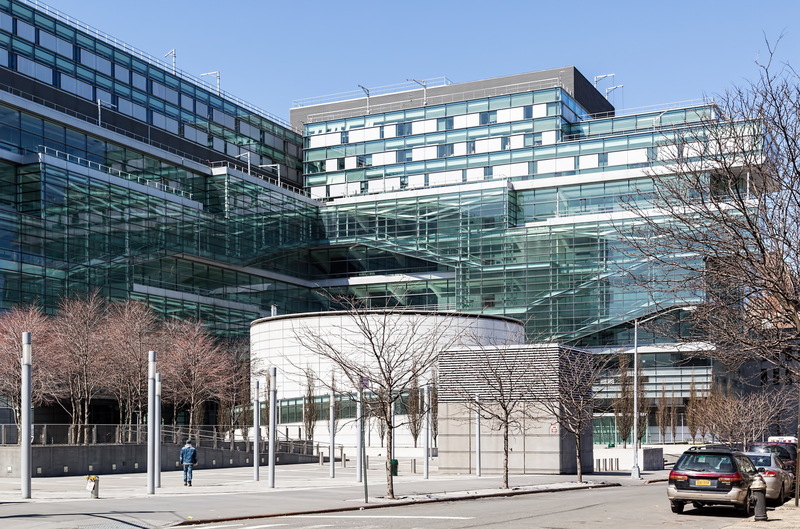 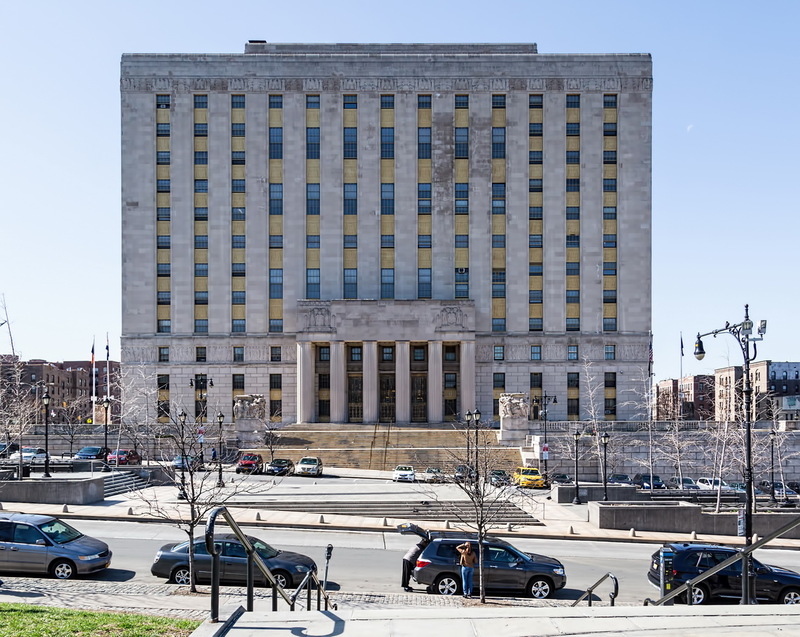 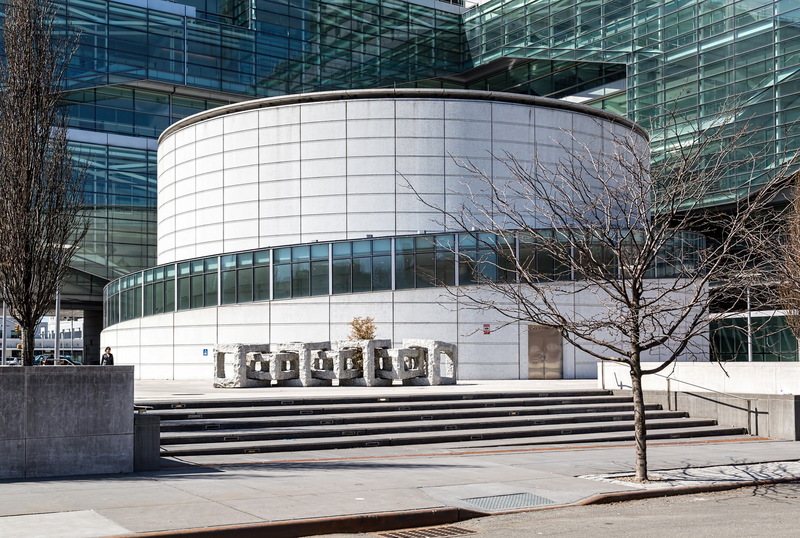 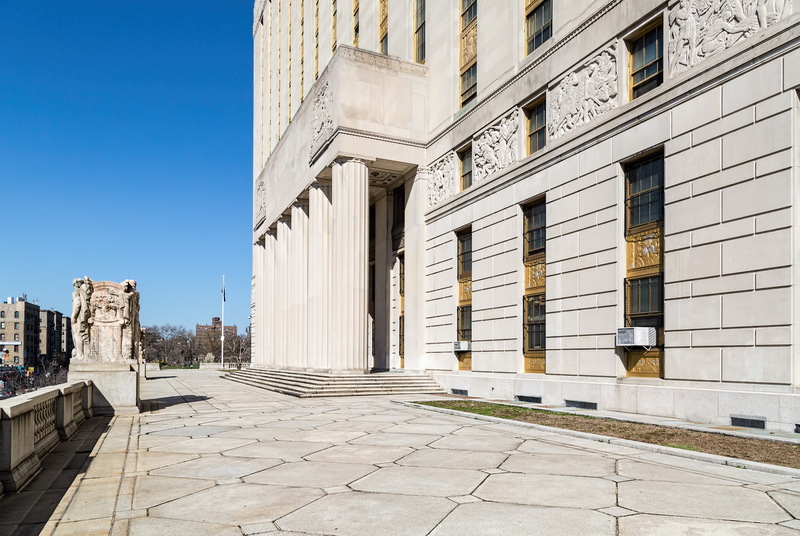 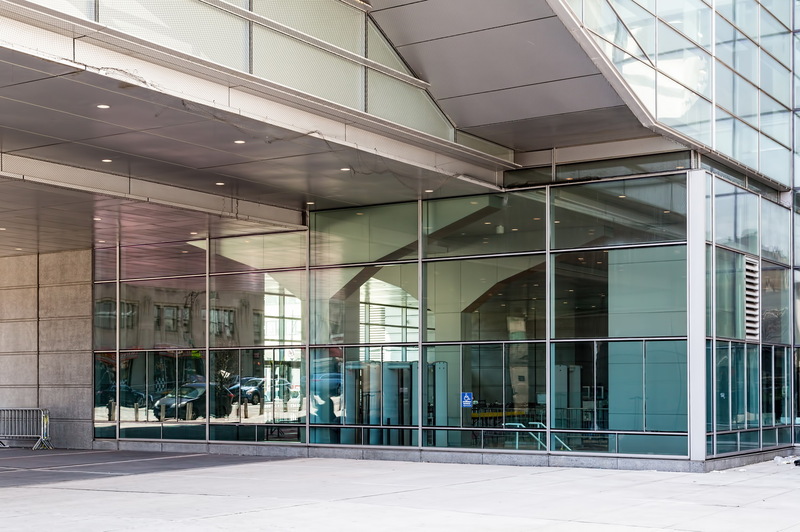 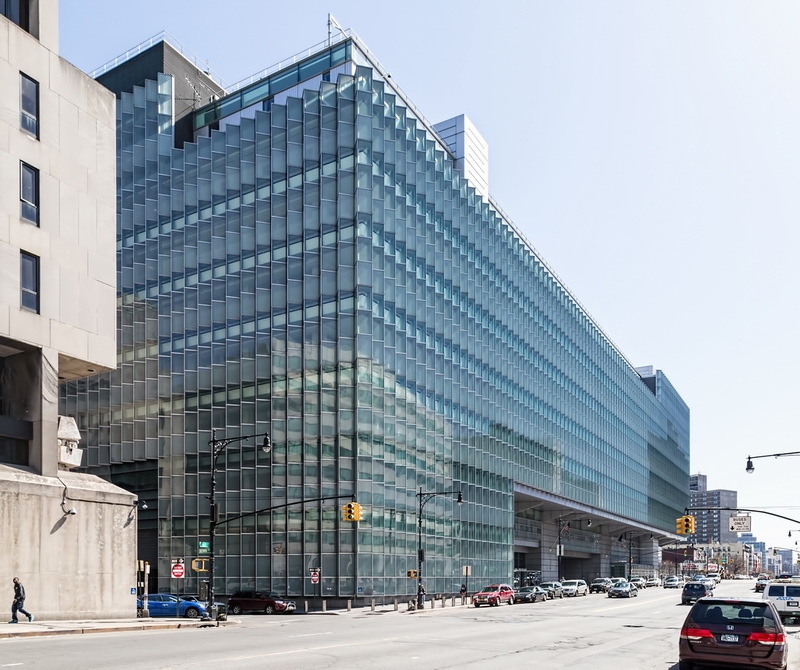 May 12, 2015 Bronx2008, 265 East 161 Street, bronx, Bronx County Hall of Justice, civic, Concourse Village, New York City, postmodern, Rafael Viñoly Architects. 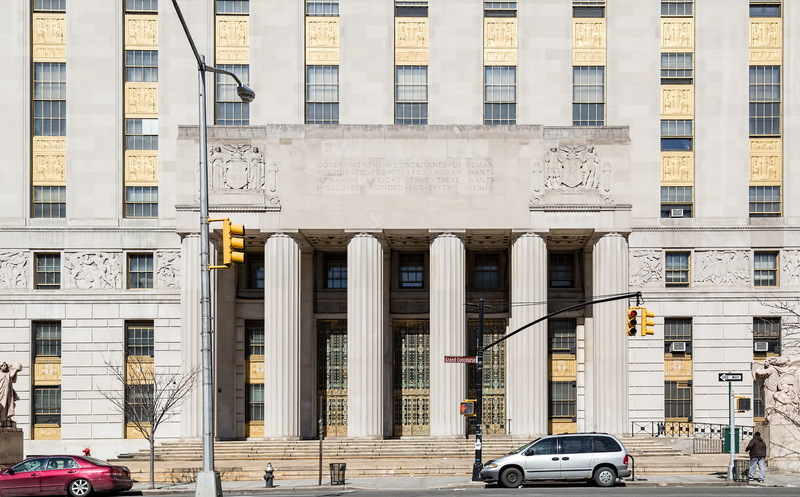 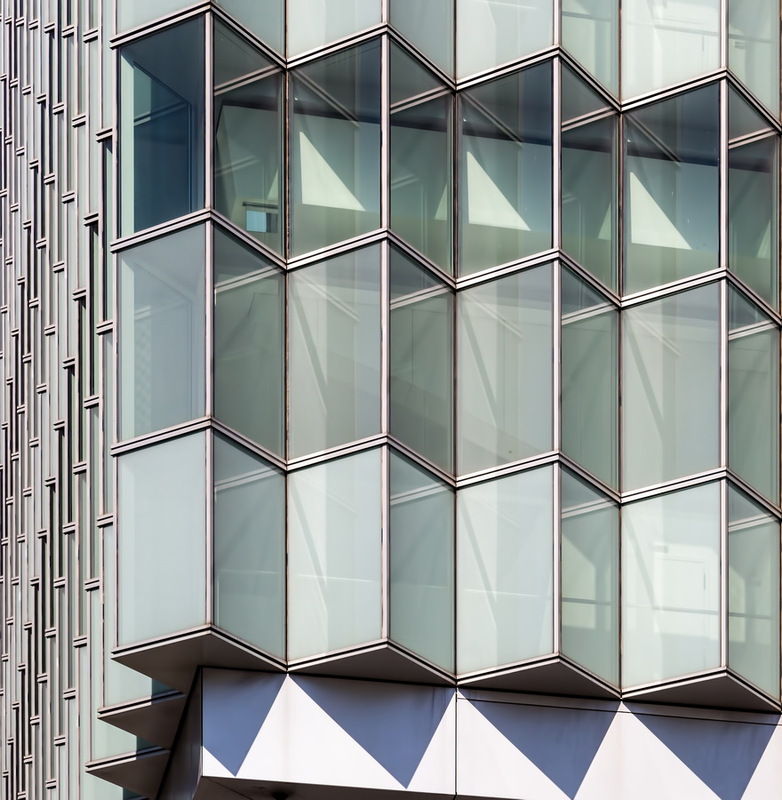 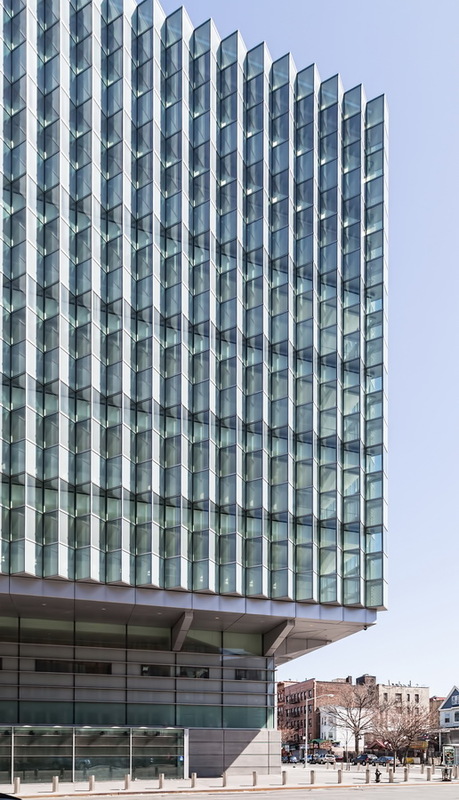 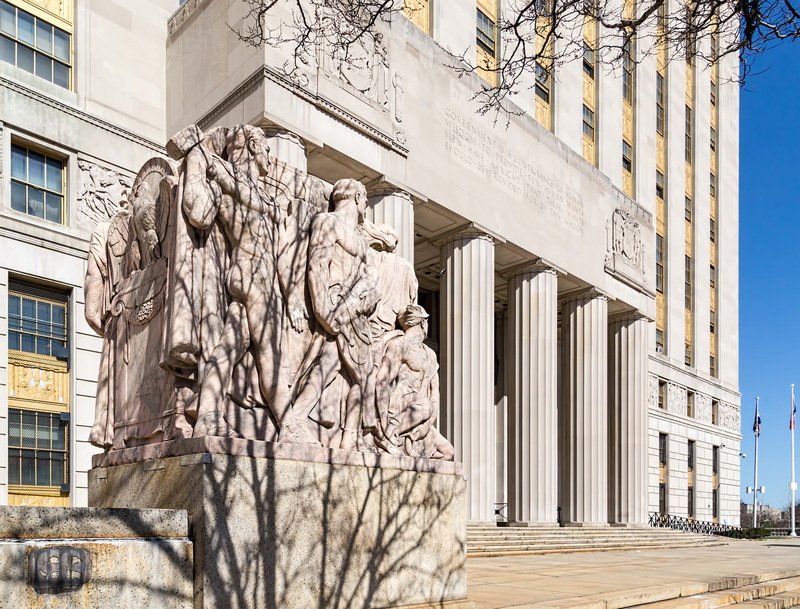 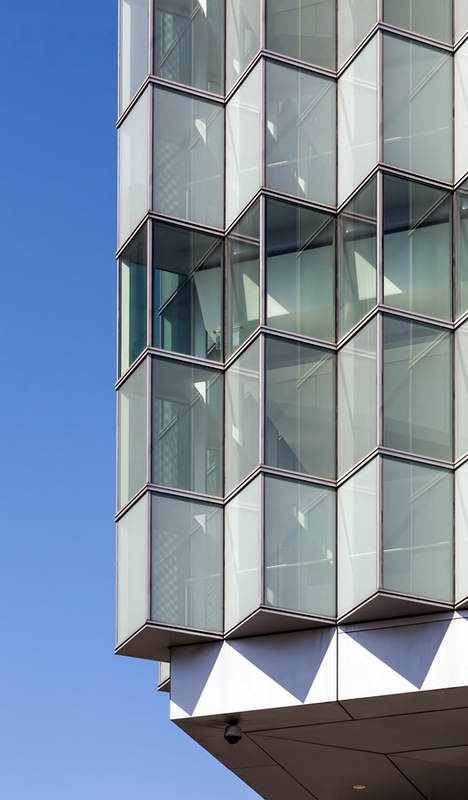 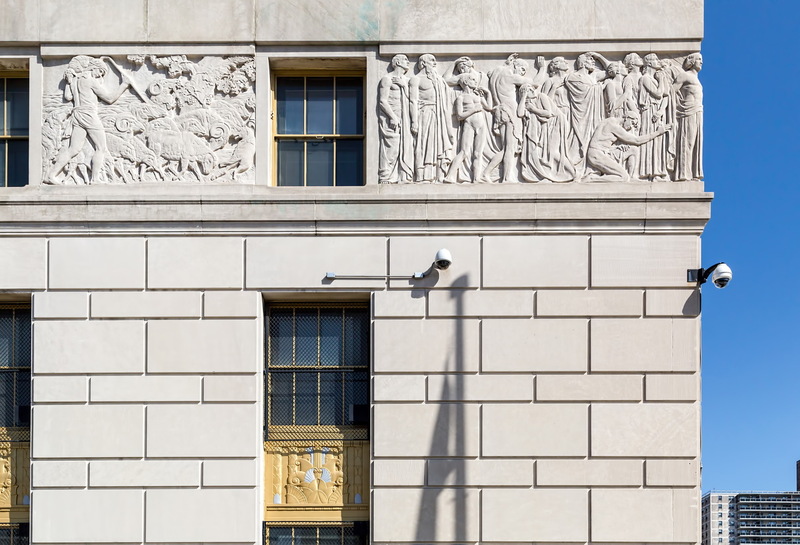 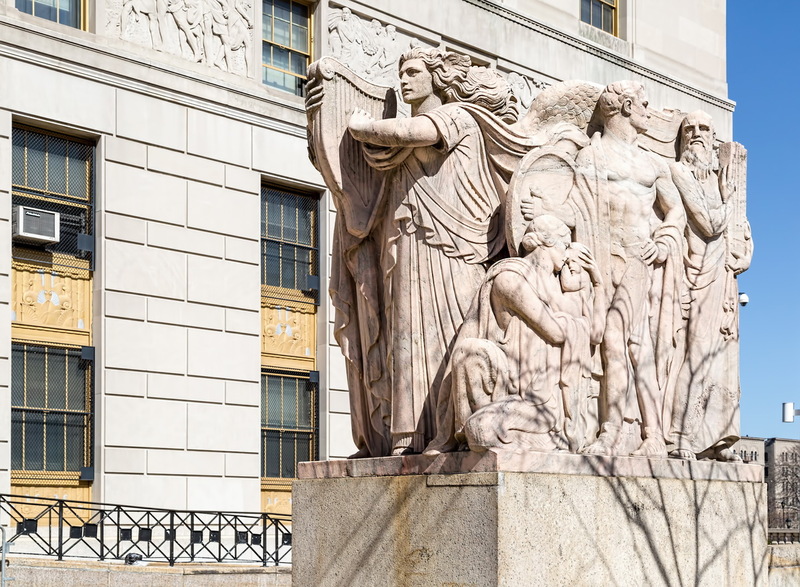 Bronx County Hall of Justice reverses centuries of tradition: The aluminum and glass facades are designed for openness and transparency instead of monumental intimidation. 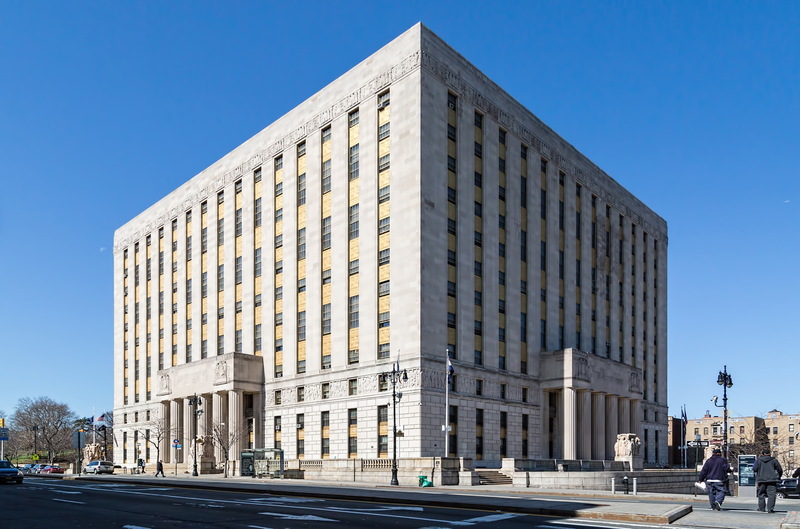 The building is a dazzling contrast to the Bronx Criminal Court, next door, and the Bronx County Building (originally Bronx County Courthouse) at Grand Concourse, just two blocks west. 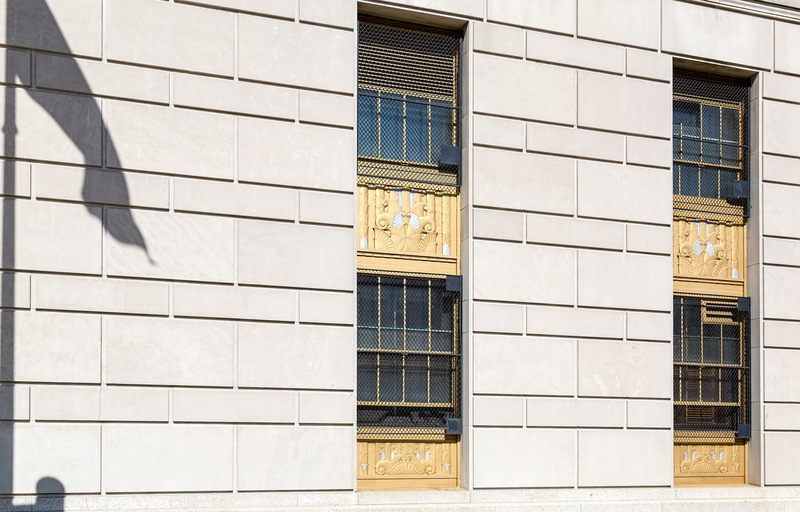 Despite its openness, the Hall of Justice was built with security in mind: The glass walls are bullet- and blast-resistant. 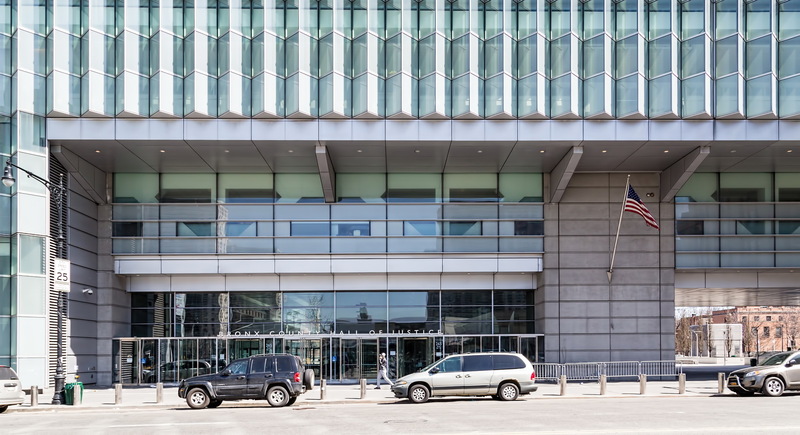 While the building’s design was exceptional, the construction was anything but. 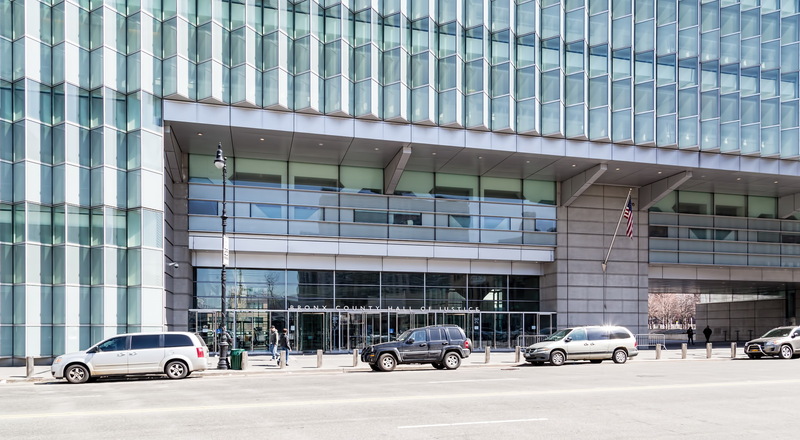 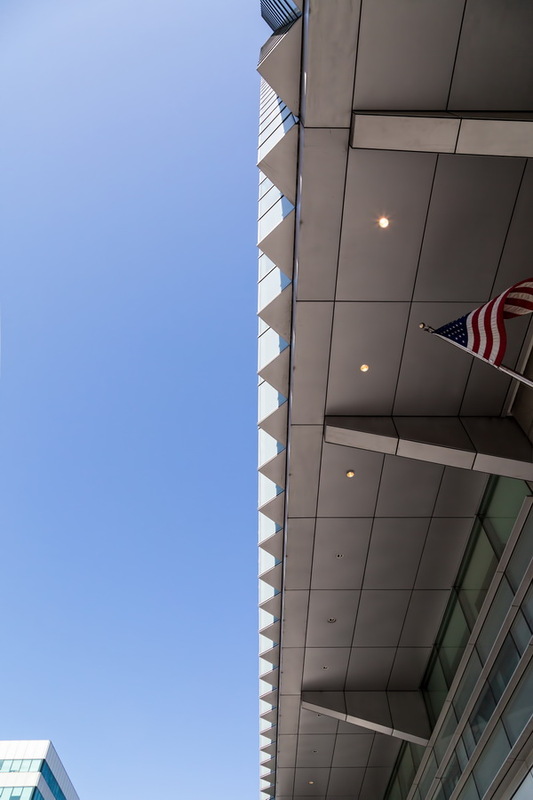 The construction site was contaminated, the low-bidding contractor was disqualified for suspected mob ties, the underground garage was deemed unsafe, and air conditioning for the court computers didn’t work. 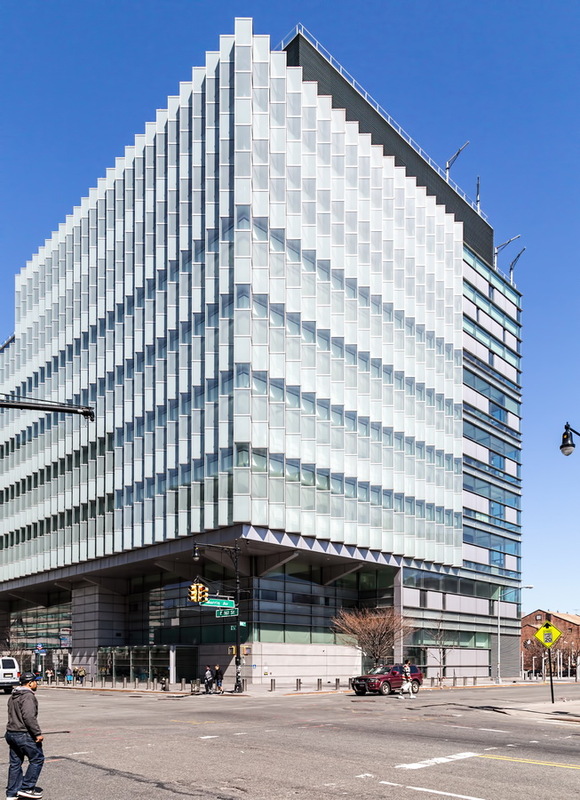 The four-year, $325 million project stretched accordion-like to six years and $421 million, opening in 2008. 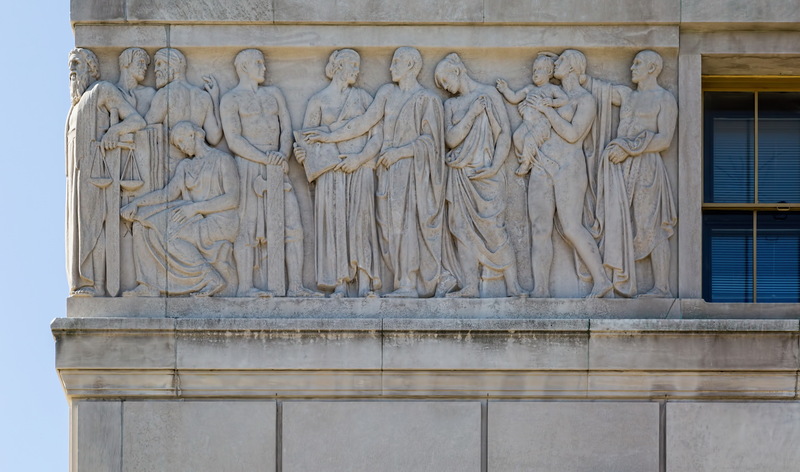 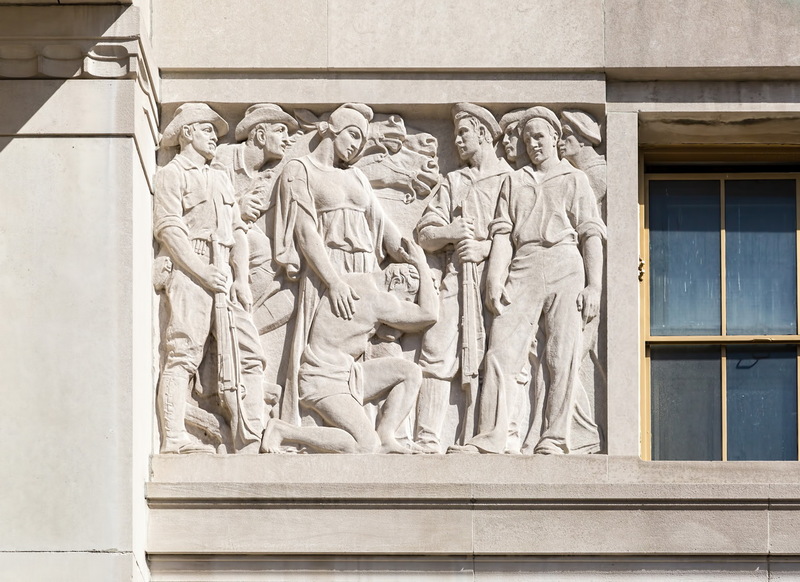 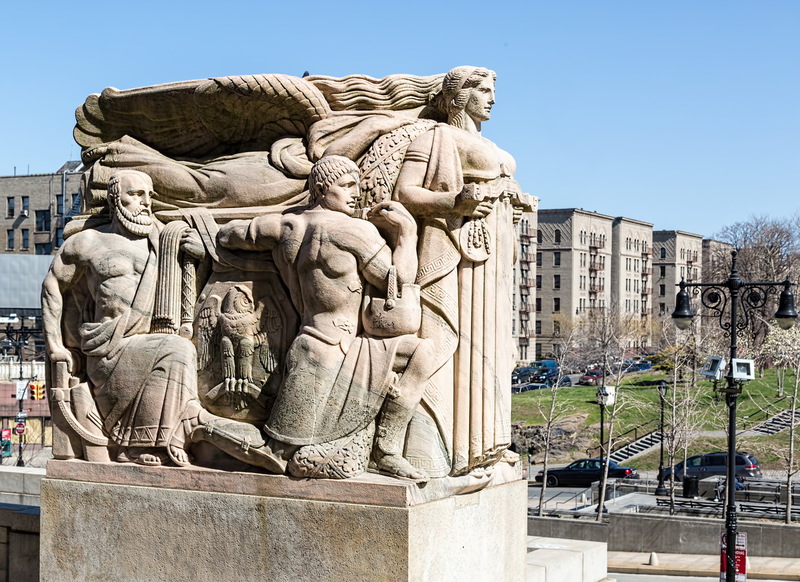 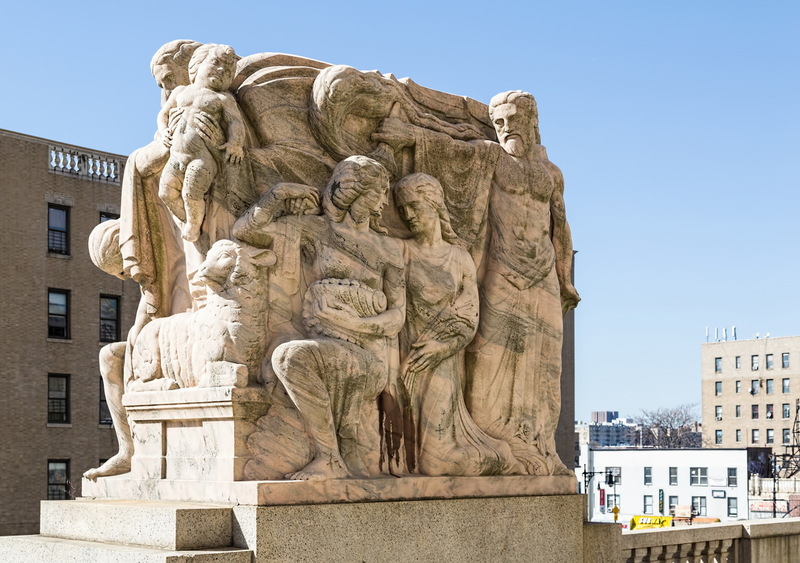 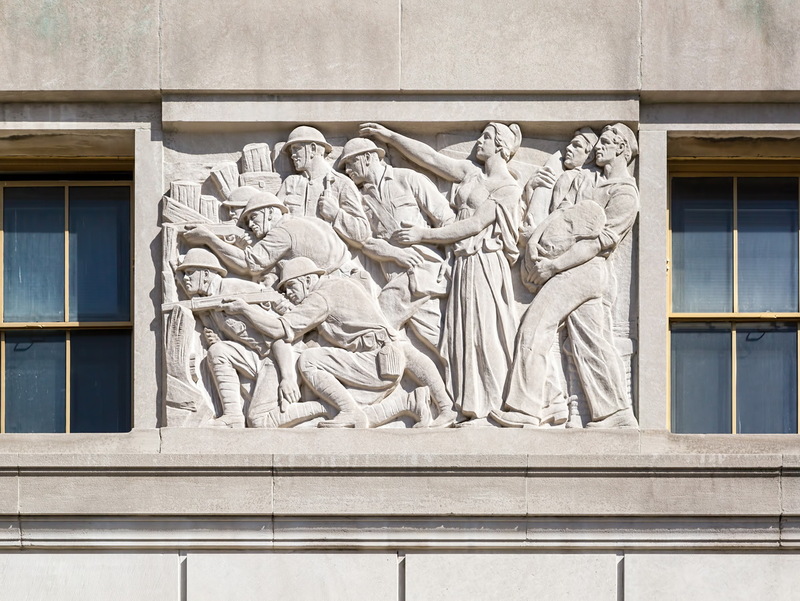 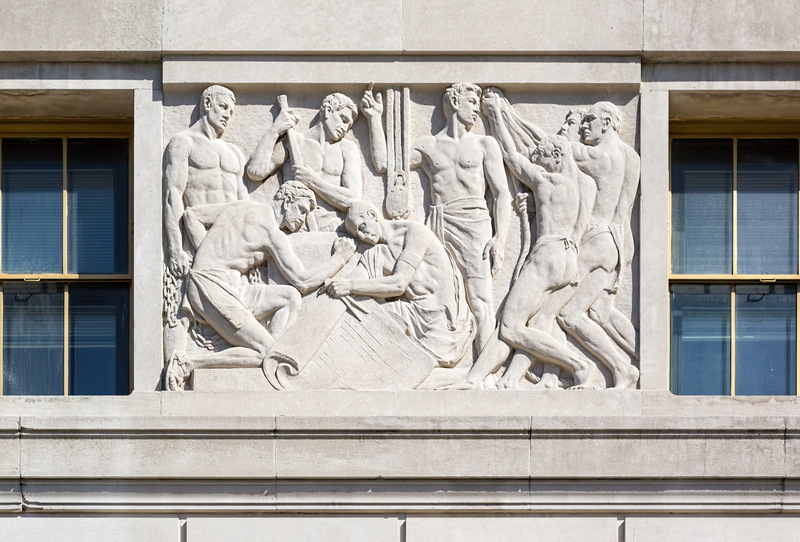 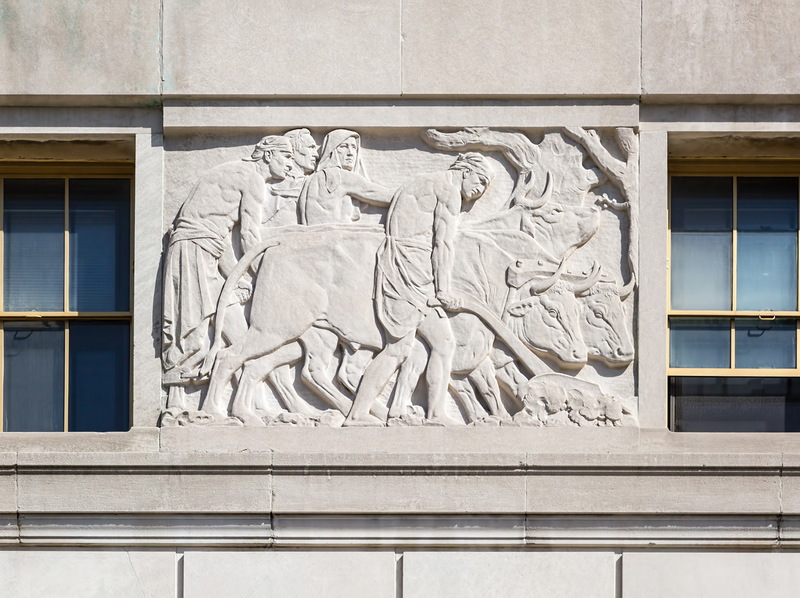 April 23, 2015 Bronx1935, 851 Grand Concourse, bronx, Bronx County Courthouse, civic, Grand Concourse, Joseph H. Freedlander, Max L. Hausle, Moderne, neo-Classical, New York City. 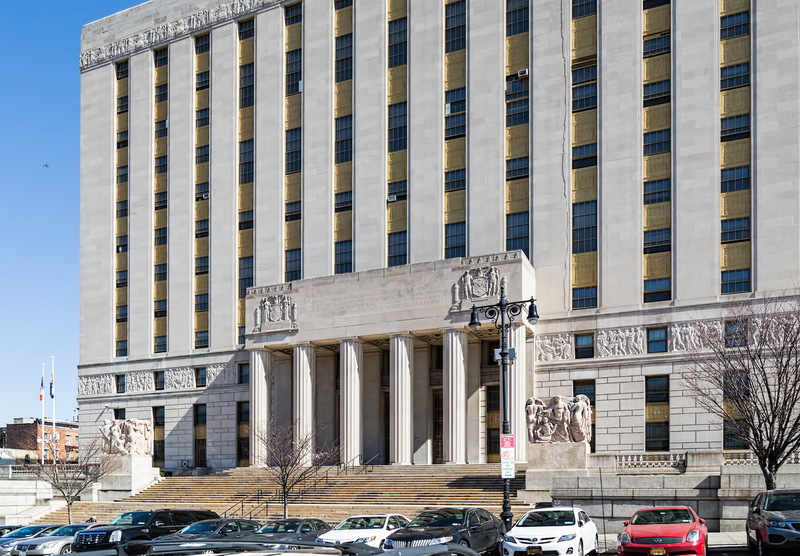 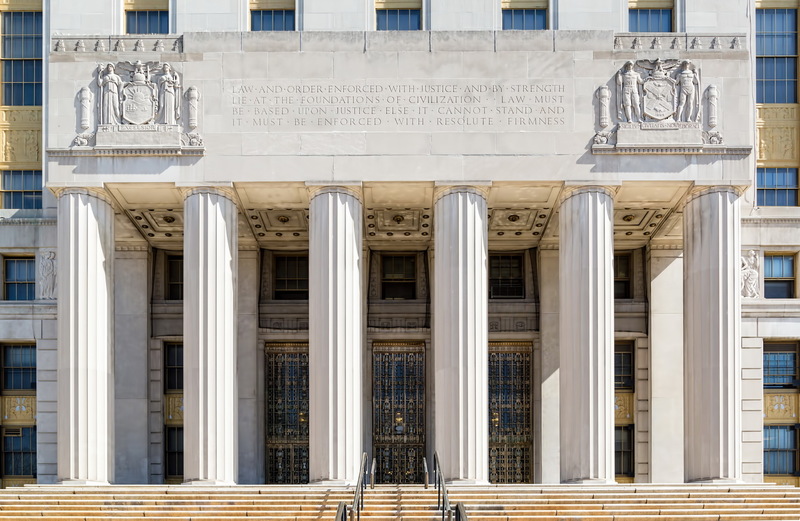 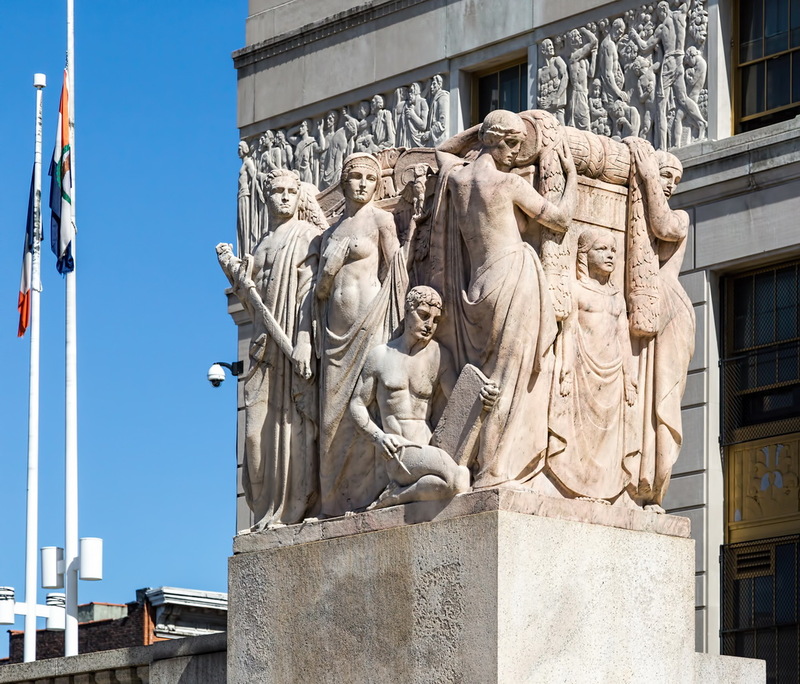 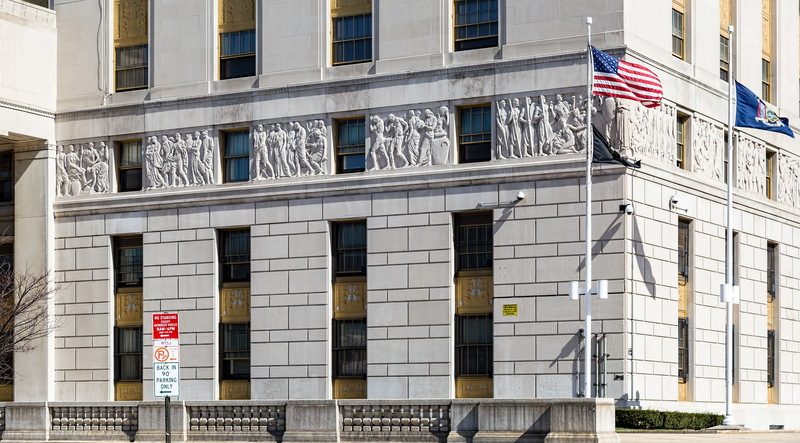 Bronx County Building (originally Bronx County Courthouse) is a monumental landmark of limestone and marble that blends modern and classical forms. 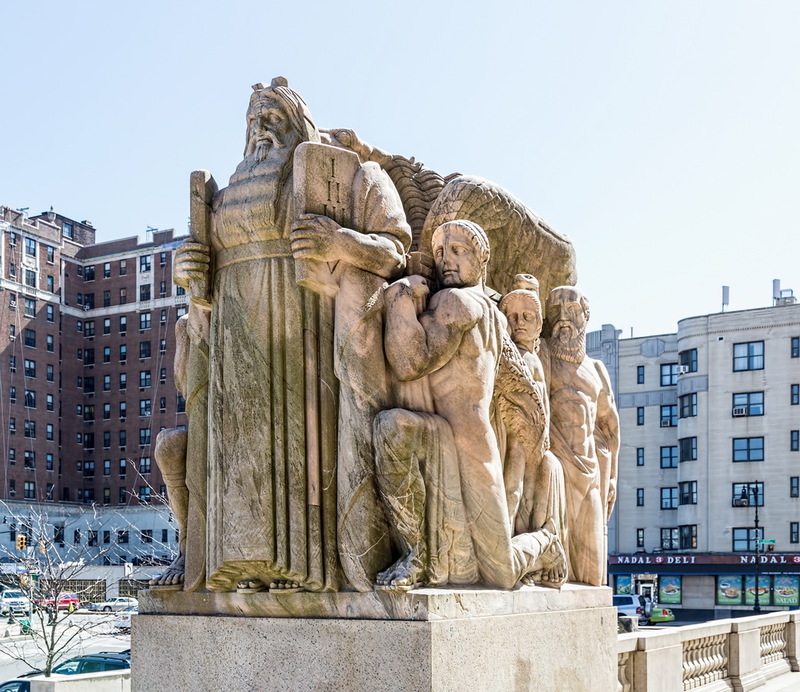 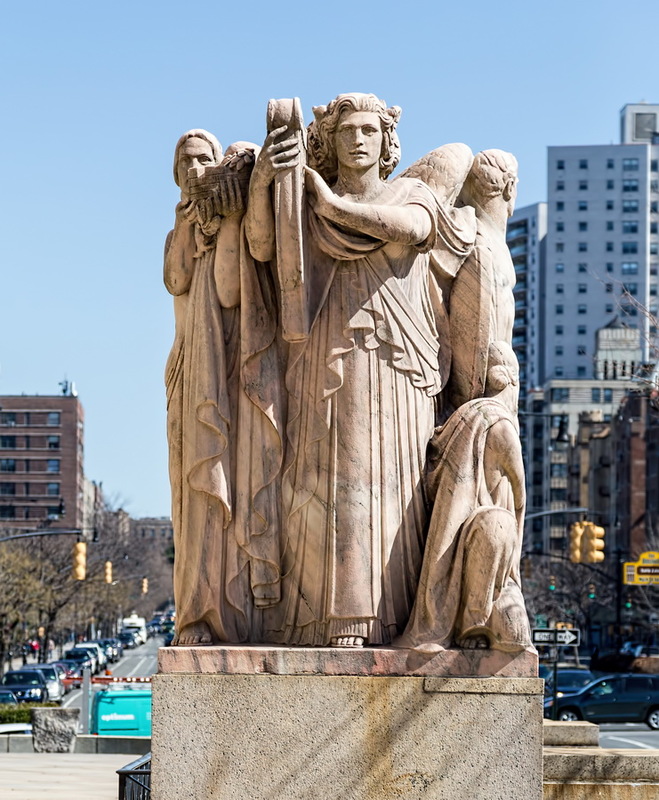 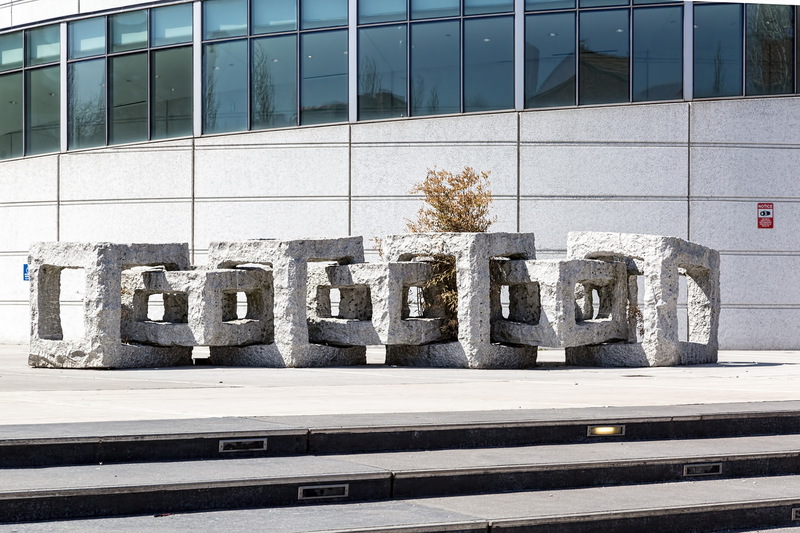 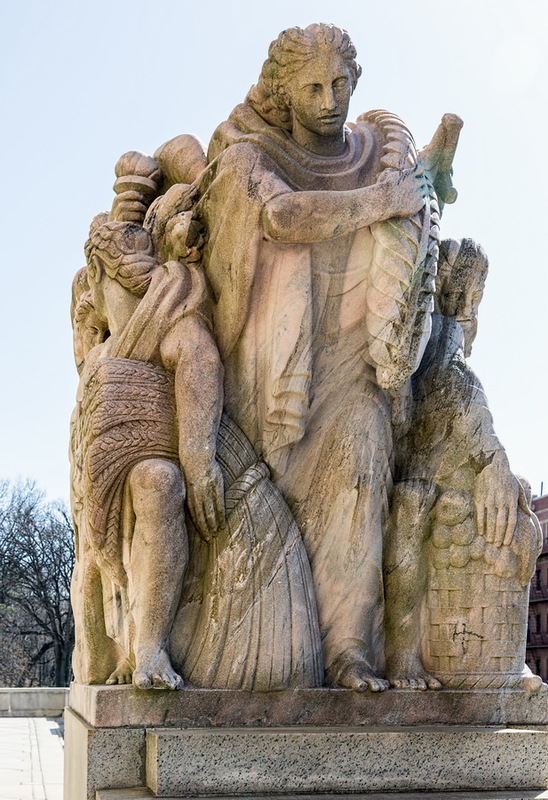 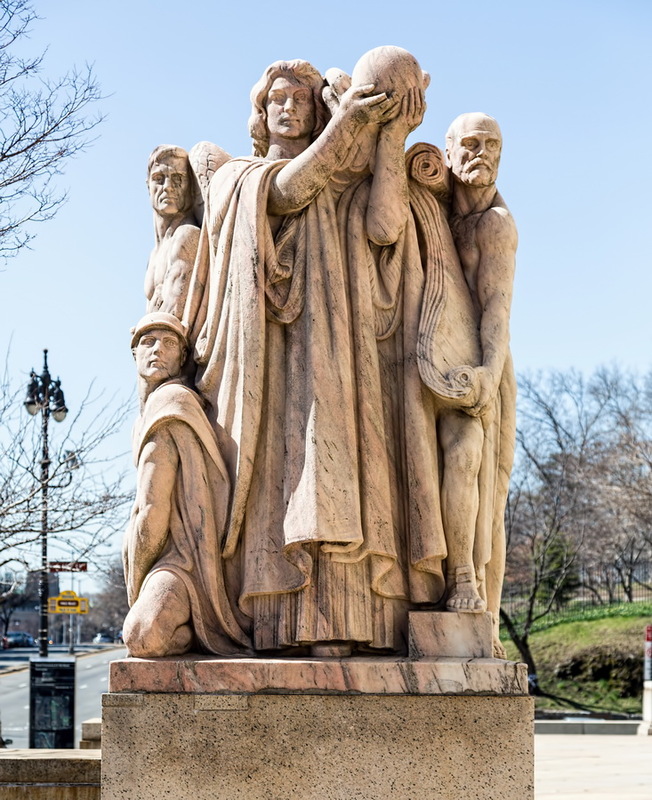 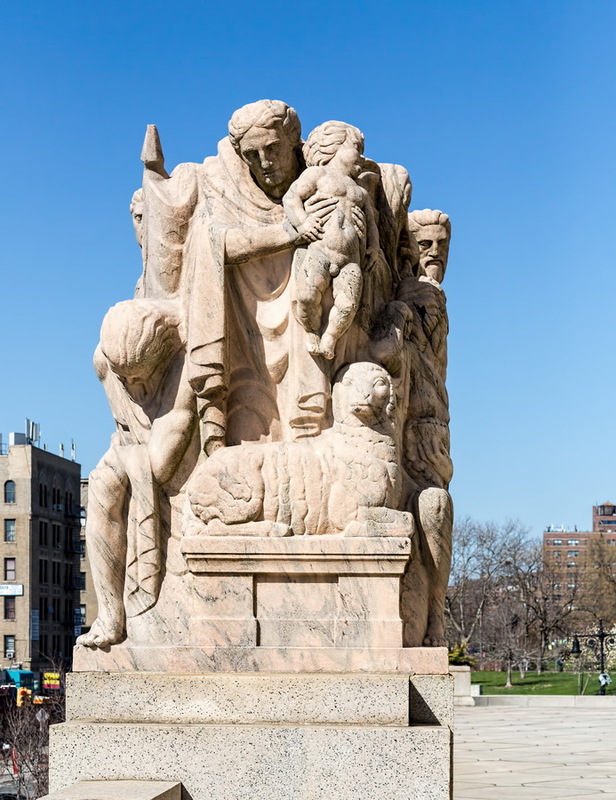 It is made more prominent by its siting, raised on a granite podium between two parks – Joyce Kilmer Park to the north, Franz Sigel Park to the south. 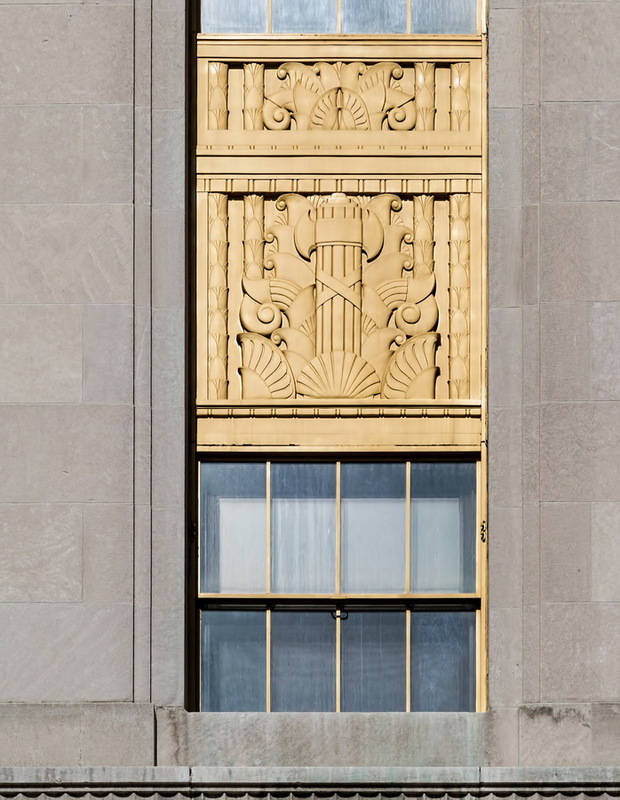 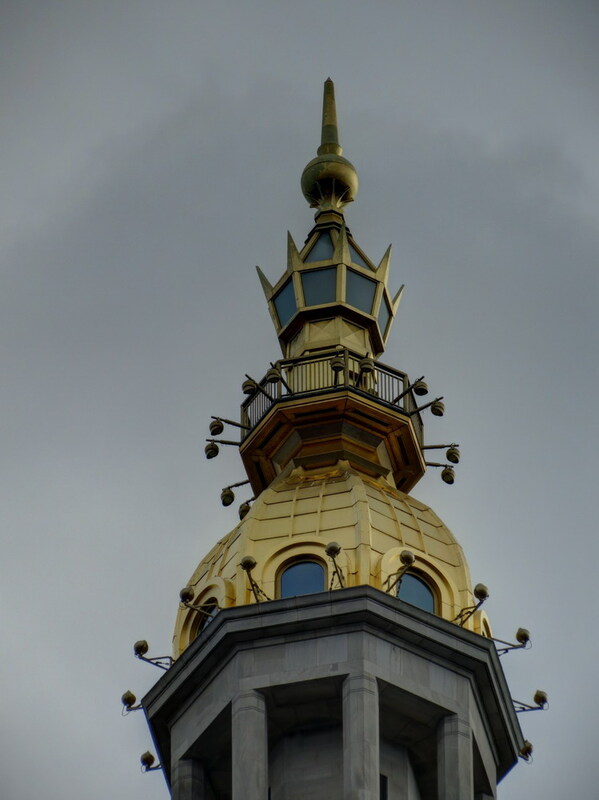 The podium, most visible on the west and north facades, is functional: It contains a garage, among other things. 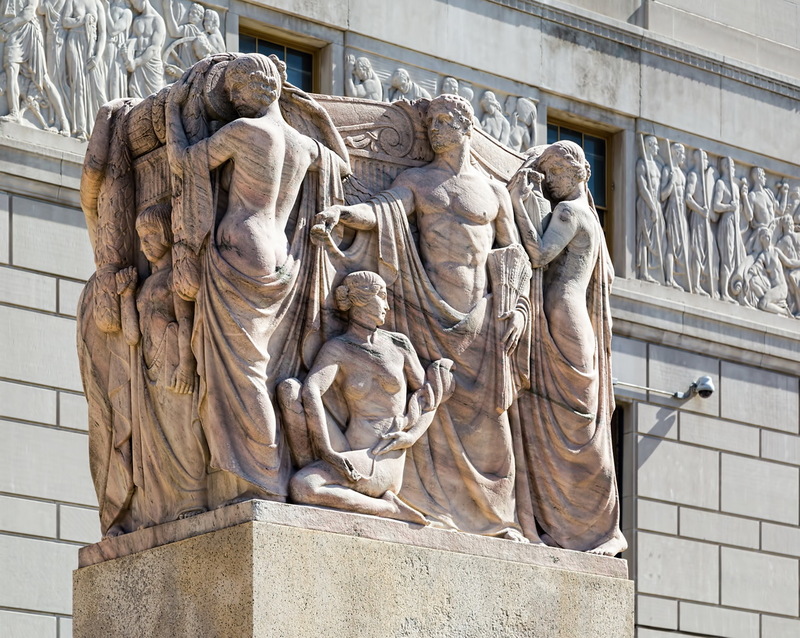 The design is symmetrical, each side almost identical except for the sculpture. 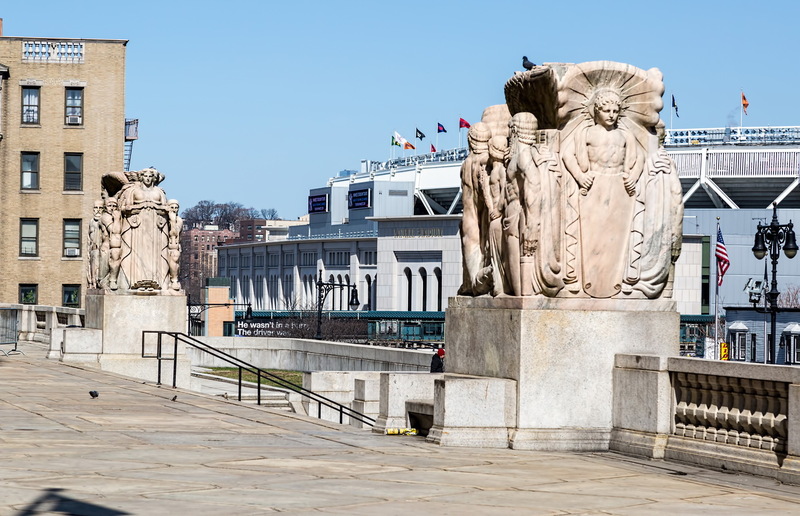 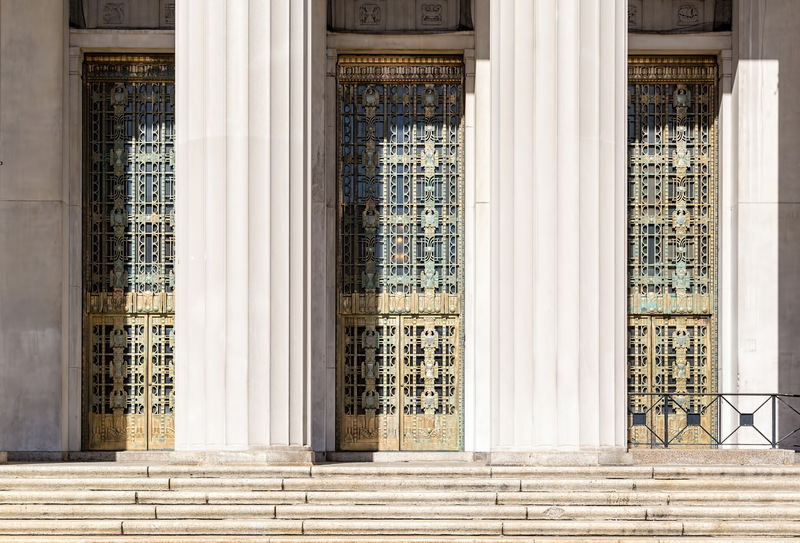 A six-columned portico is centered on each side, flanked by a pair of pink marble sculpture groups. 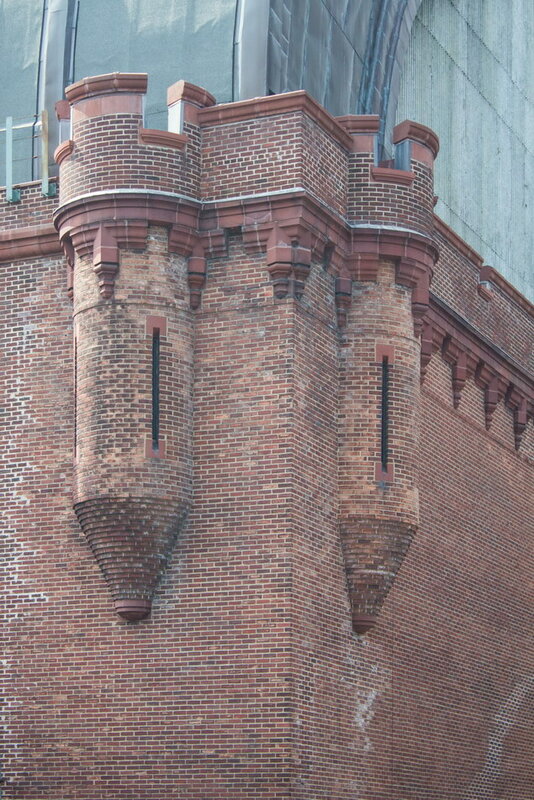 The north and south facades are broken by 13 lines of windows; the east and west facades have 15 bays. 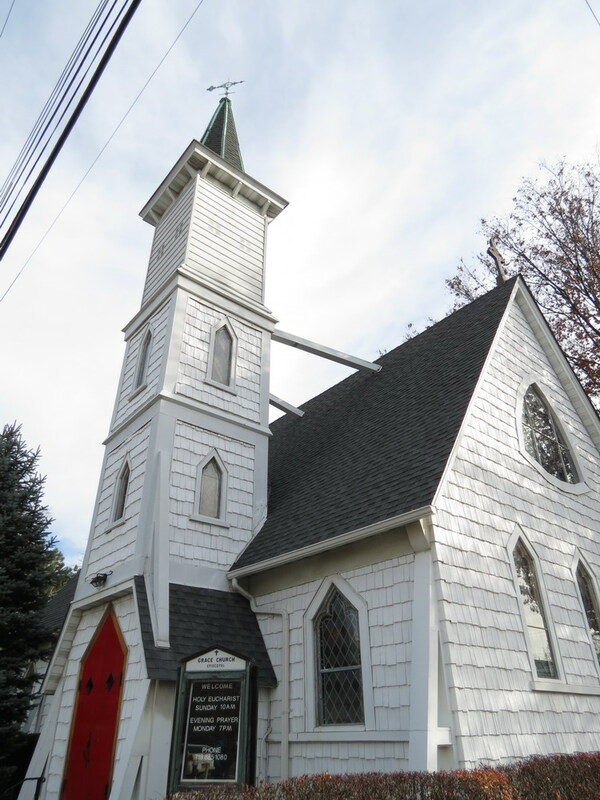 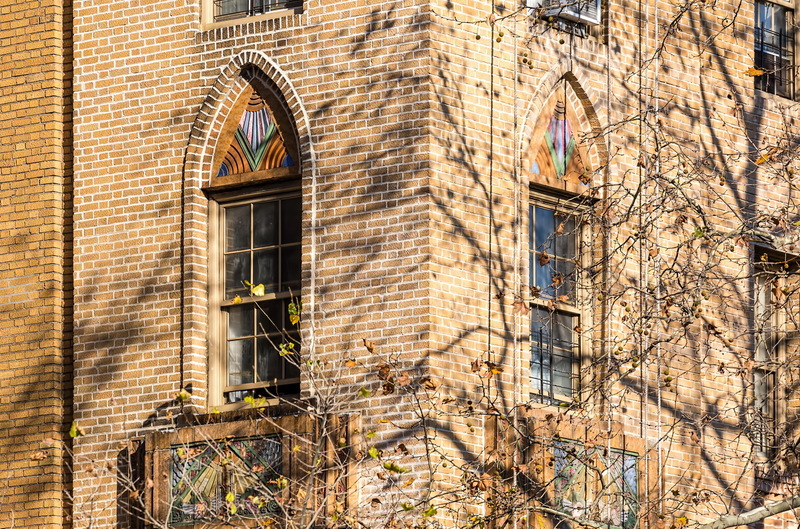 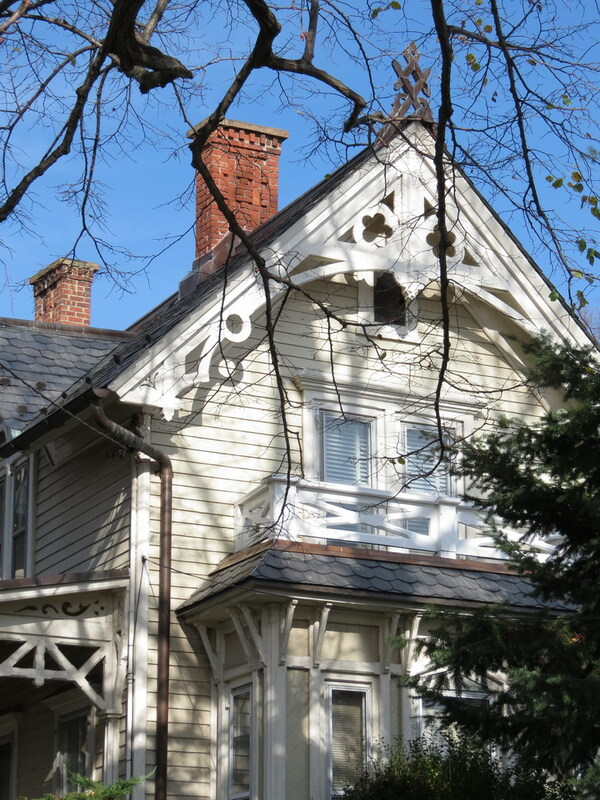 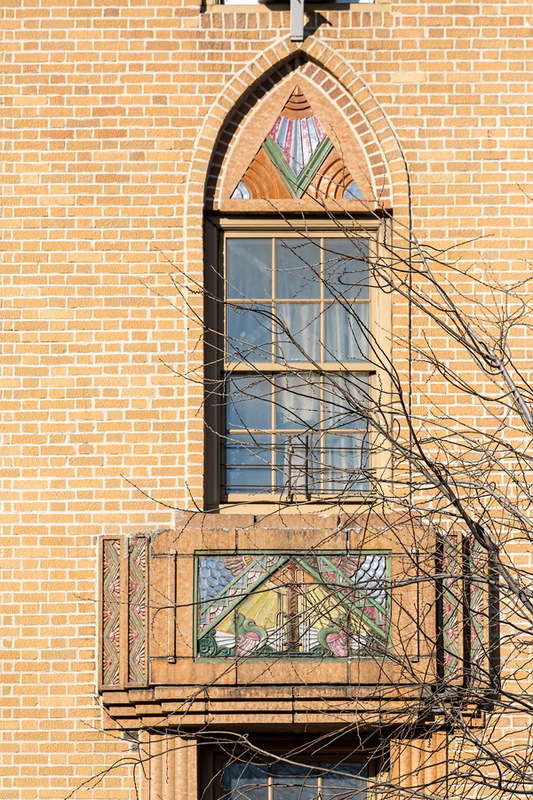 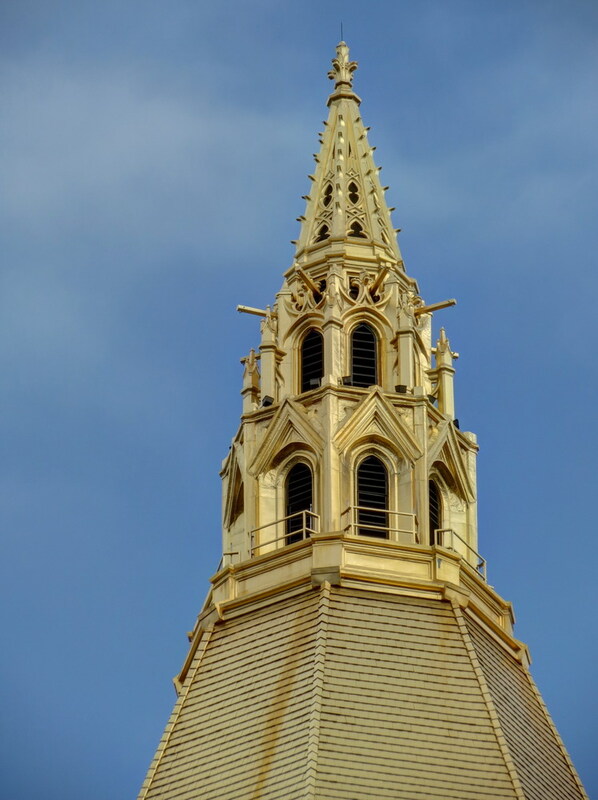 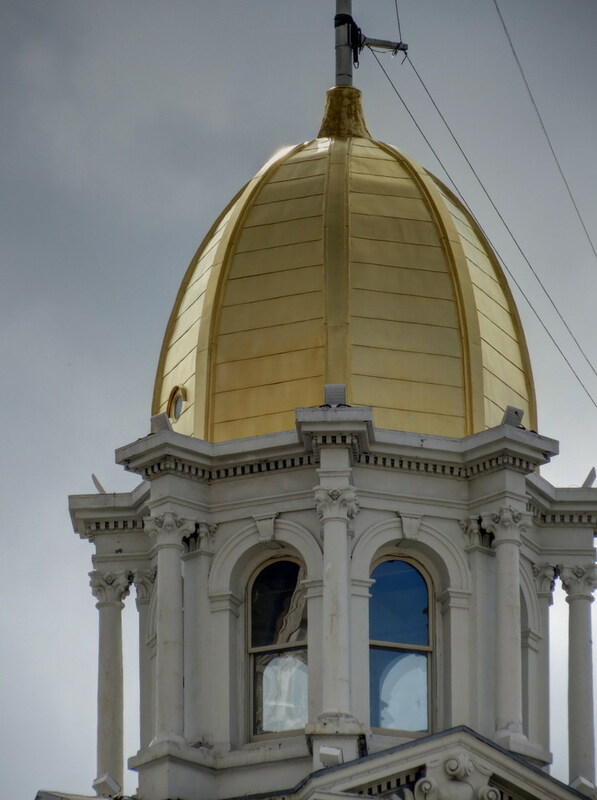 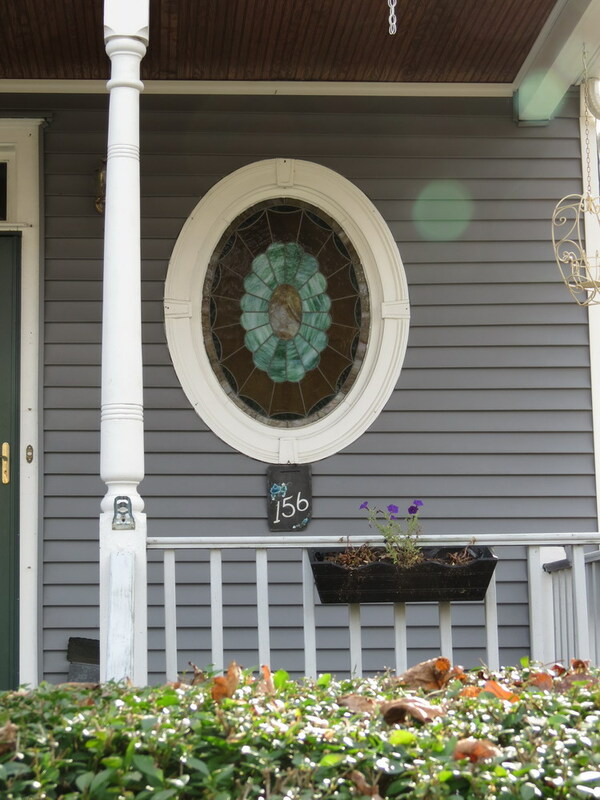 Polished copper spandrels separate the windows; the first-floor spandrels have nickel inlays. 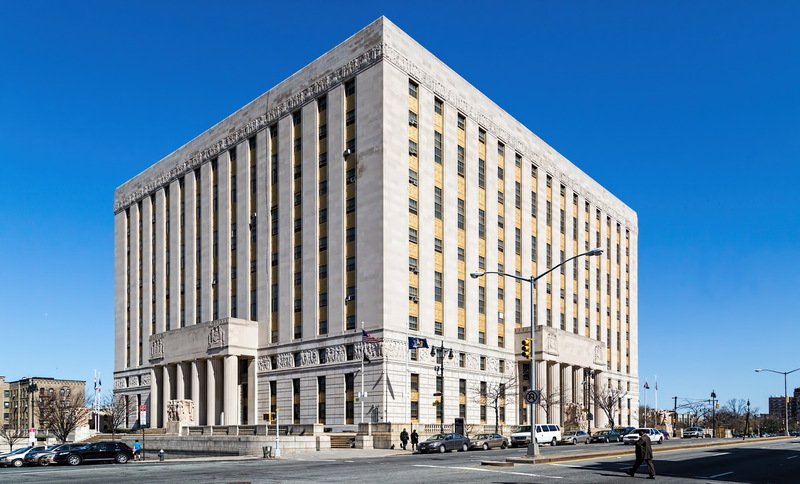 The county’s judicial needs have outgrown the building – at one point the building was so crowded that there were reports of juries deliberating in storage rooms. 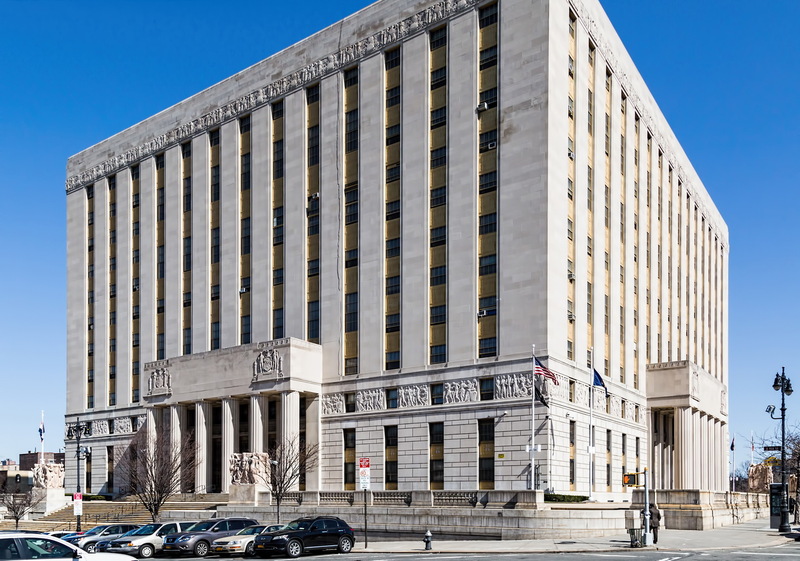 Larger courts have since been built to the east on E 161st Street and to the north on Grand Concourse. 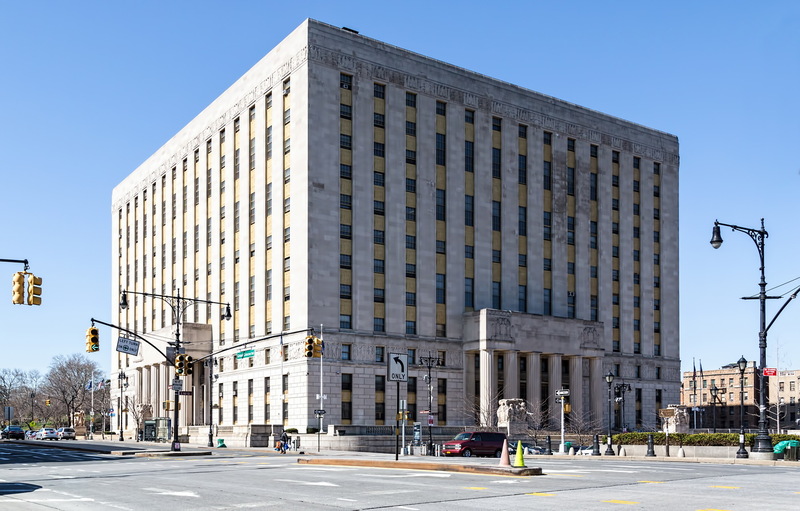 The building now serves as the Bronx County municipal building. 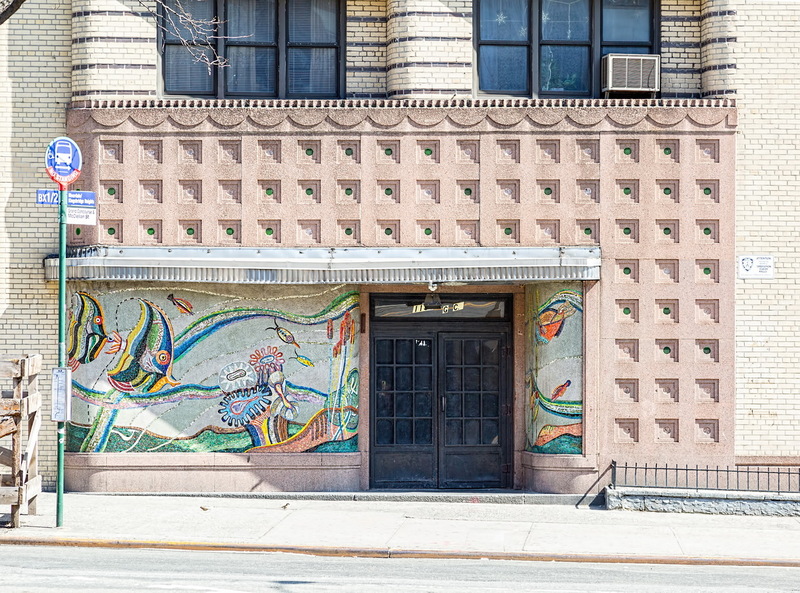 March 2, 2015 Bronx, Collectionsarchitecture, bronx, New York City. 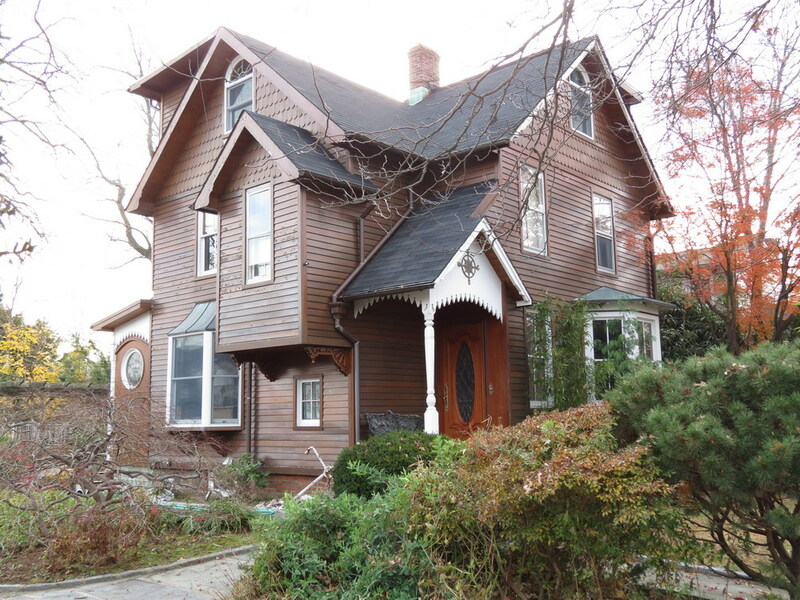 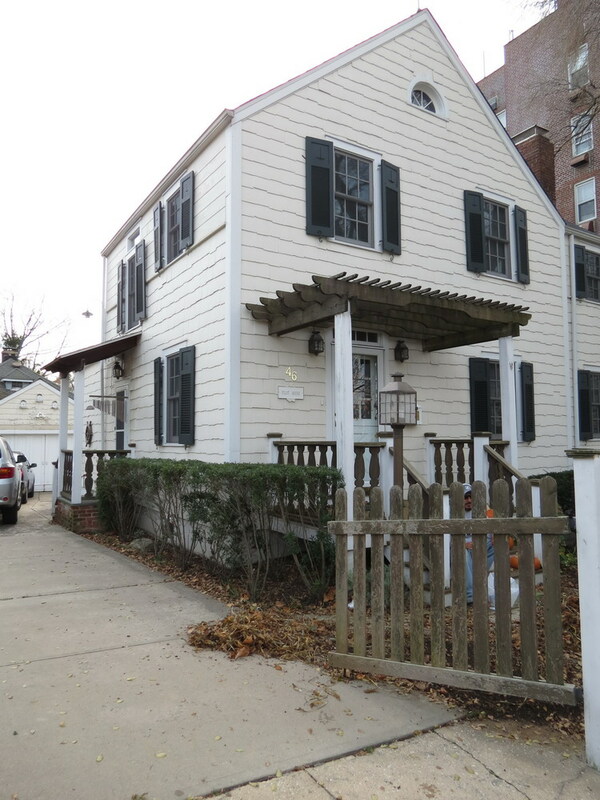 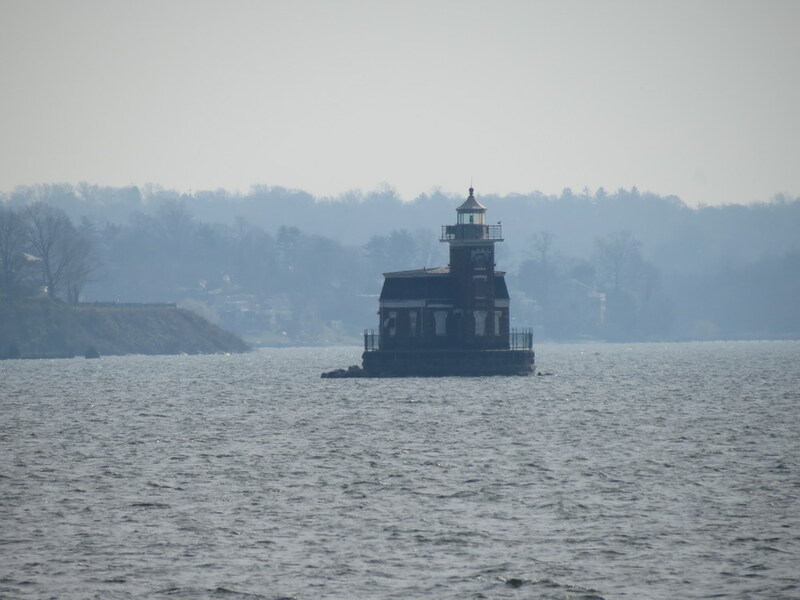 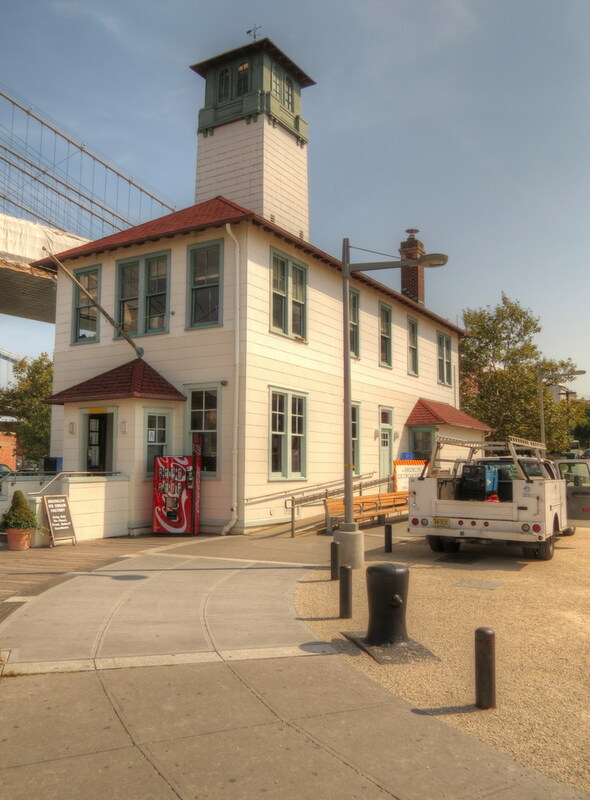 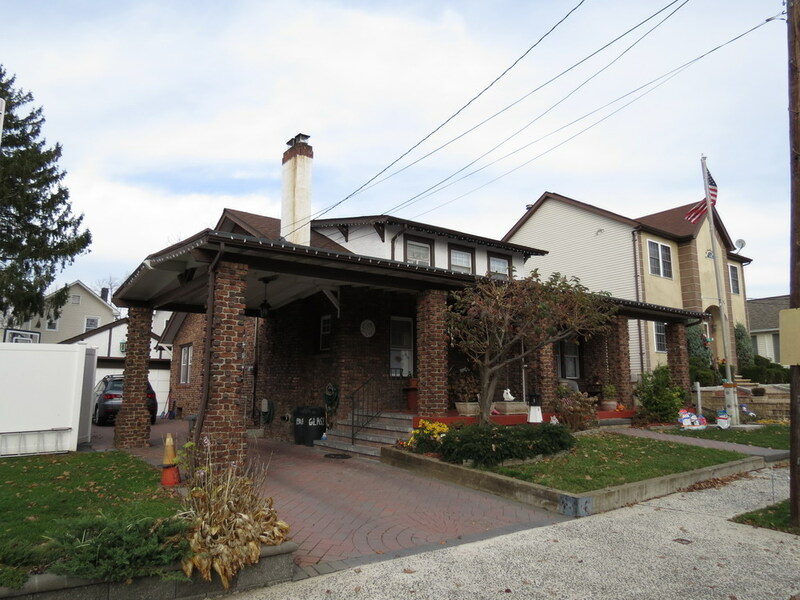 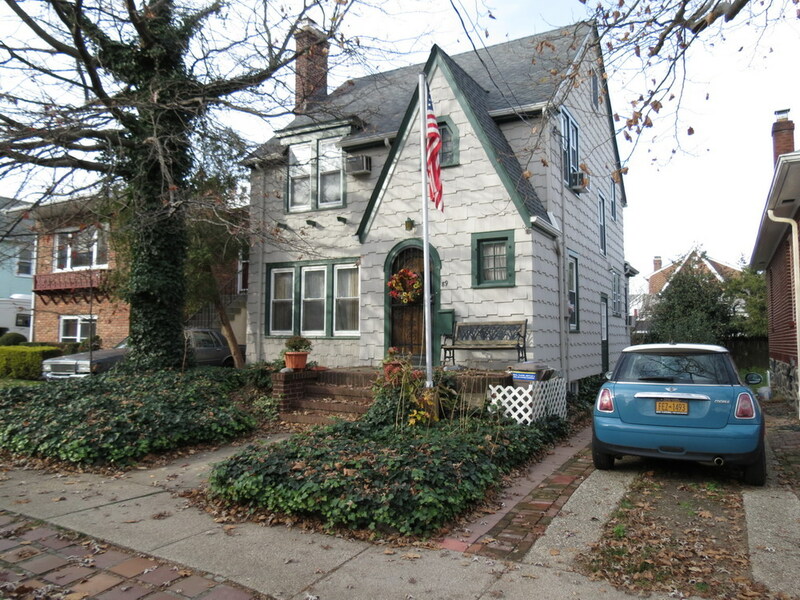 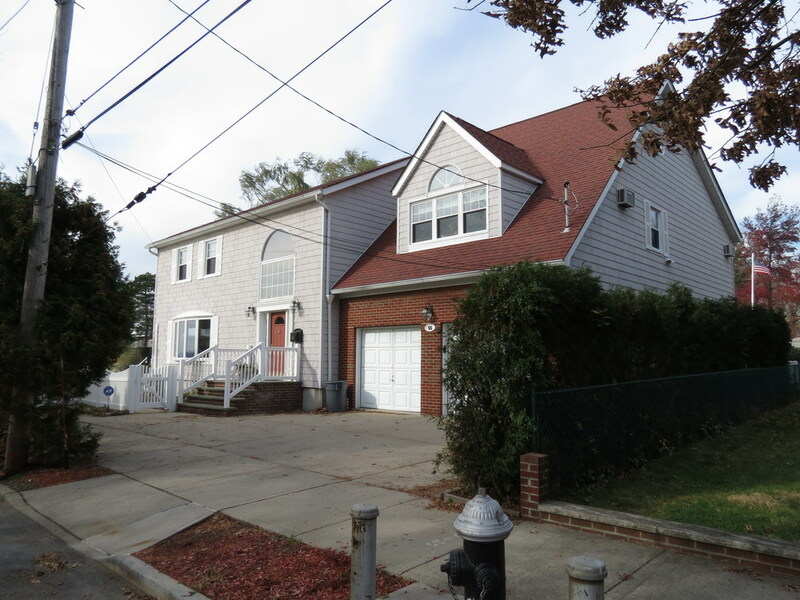 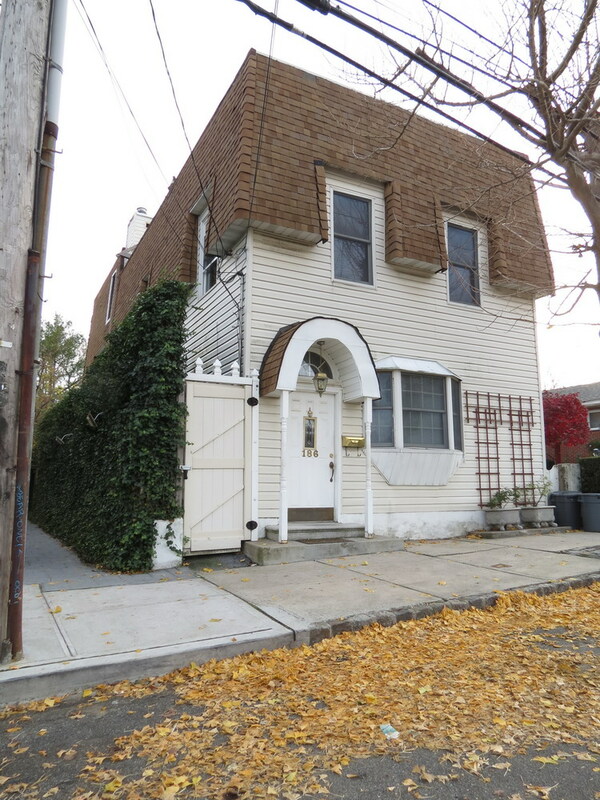 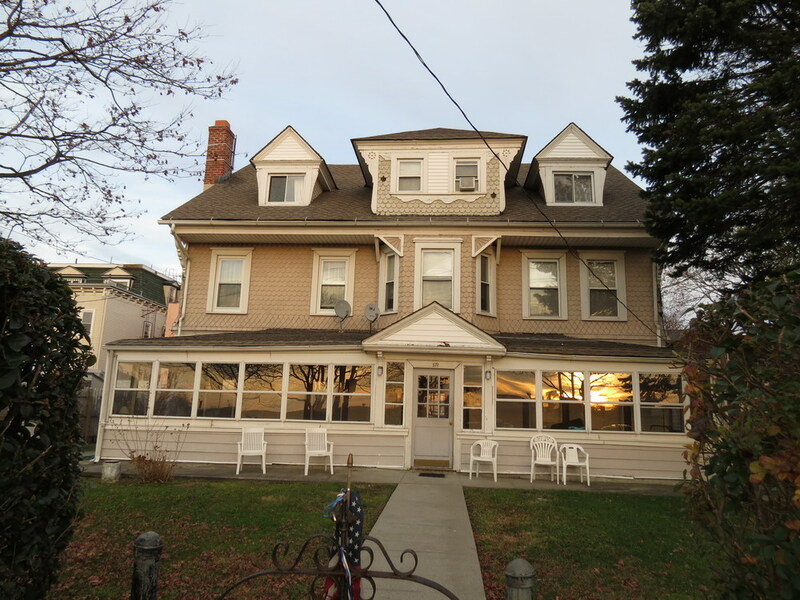 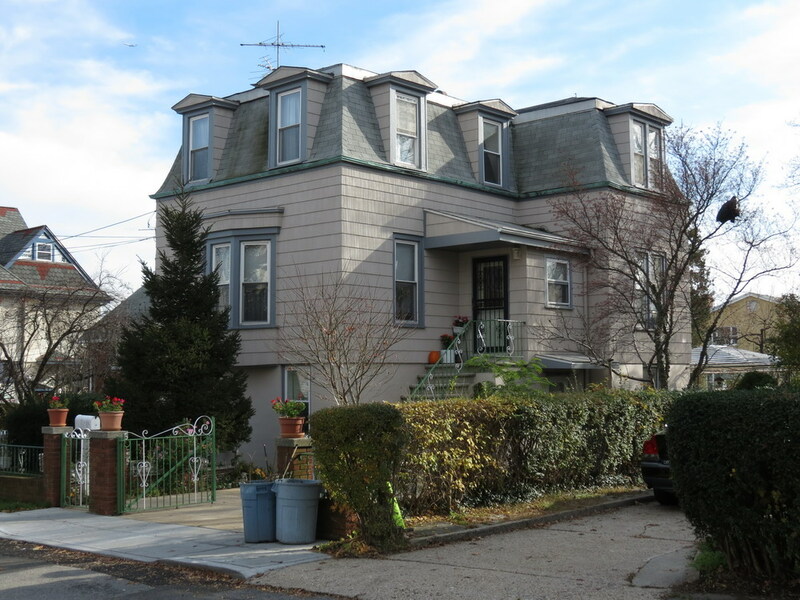 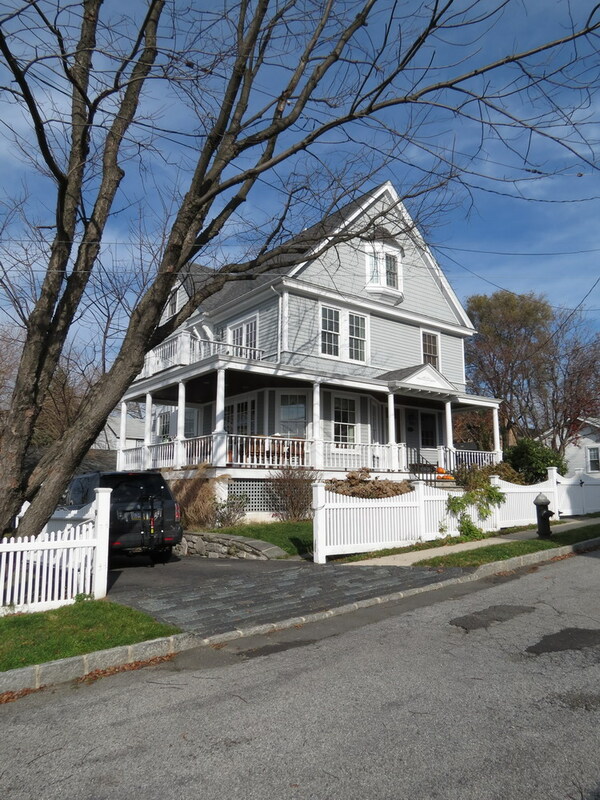 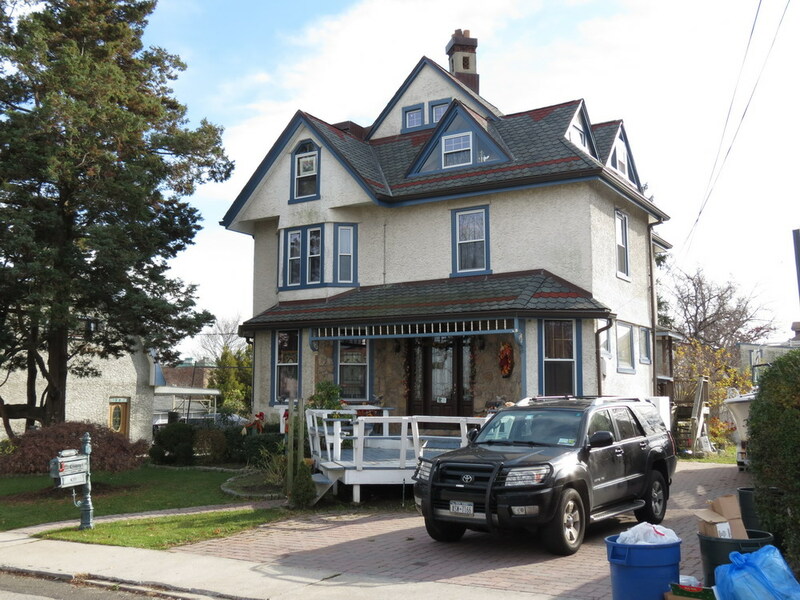 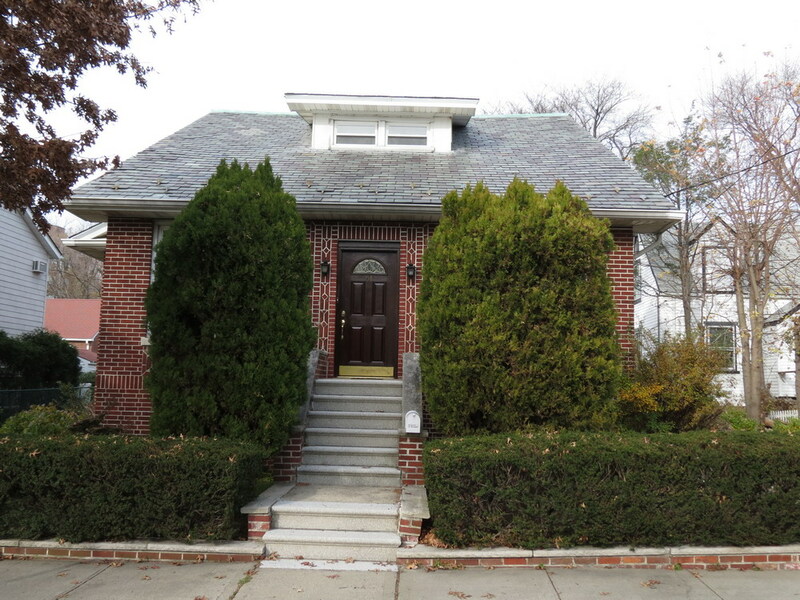 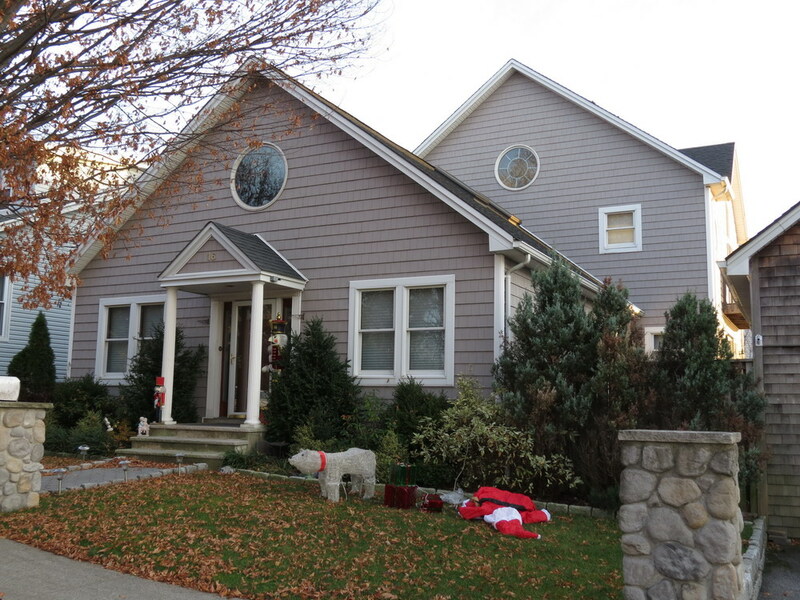 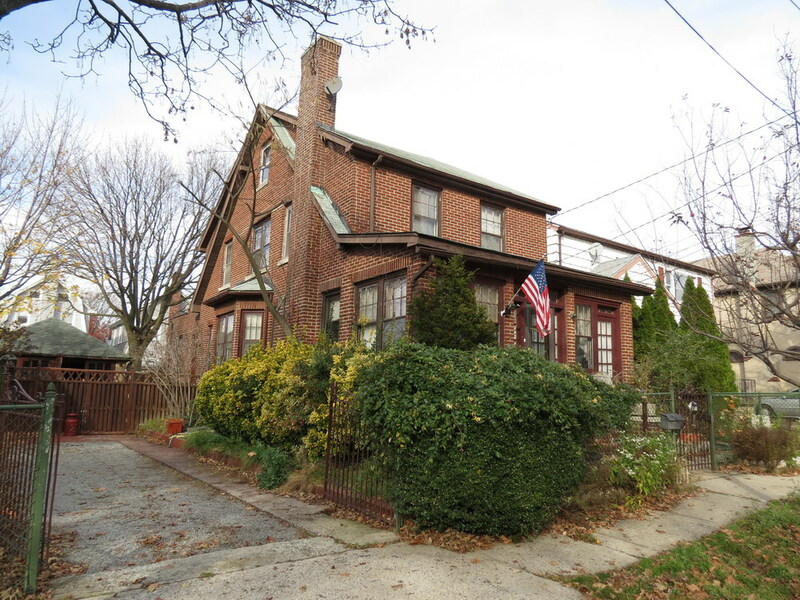 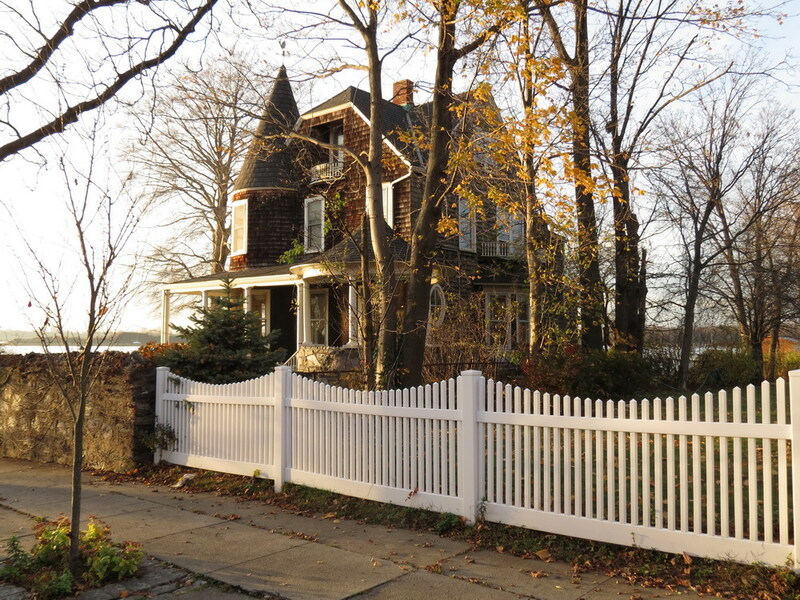 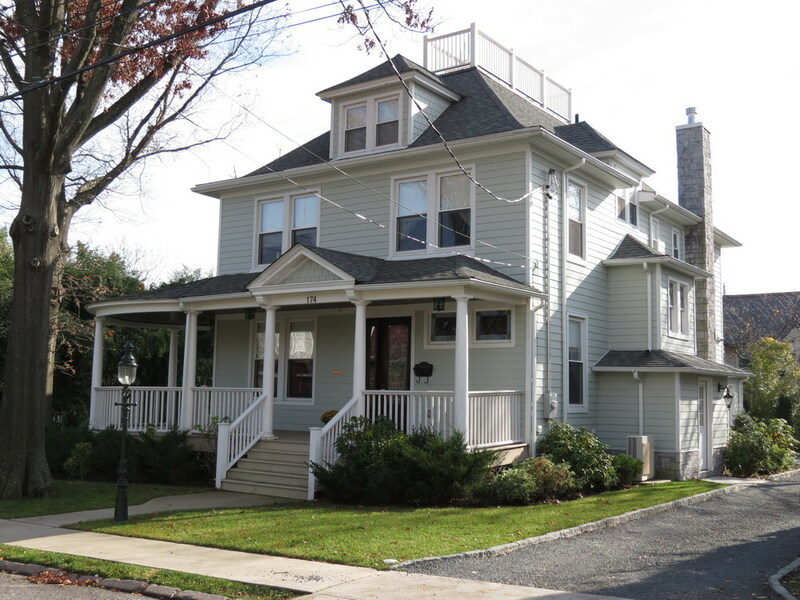 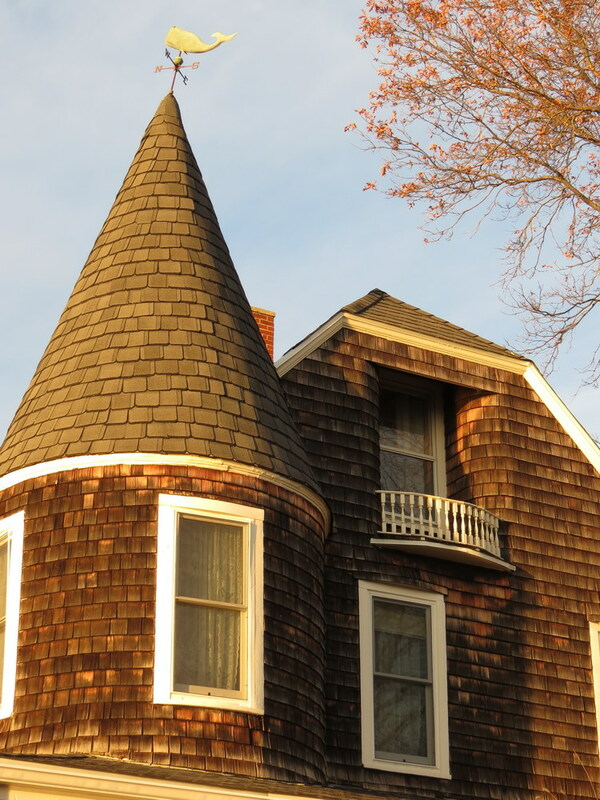 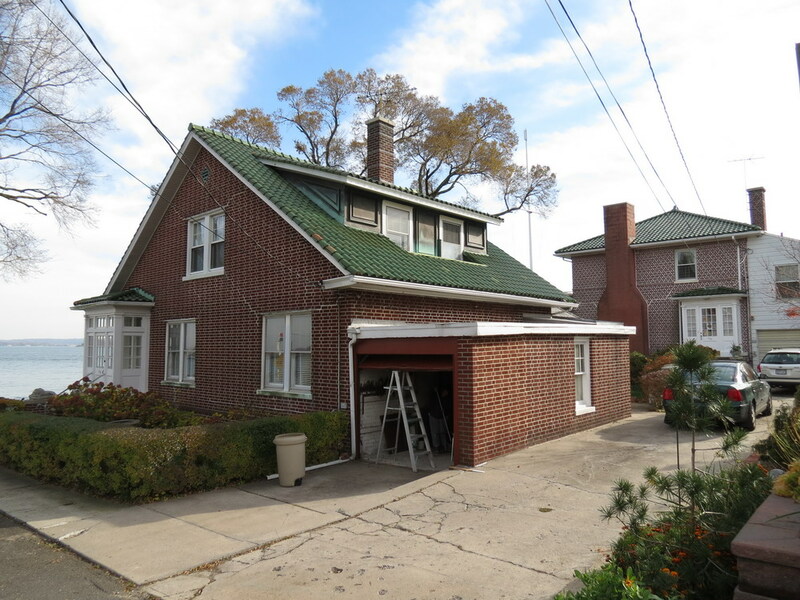 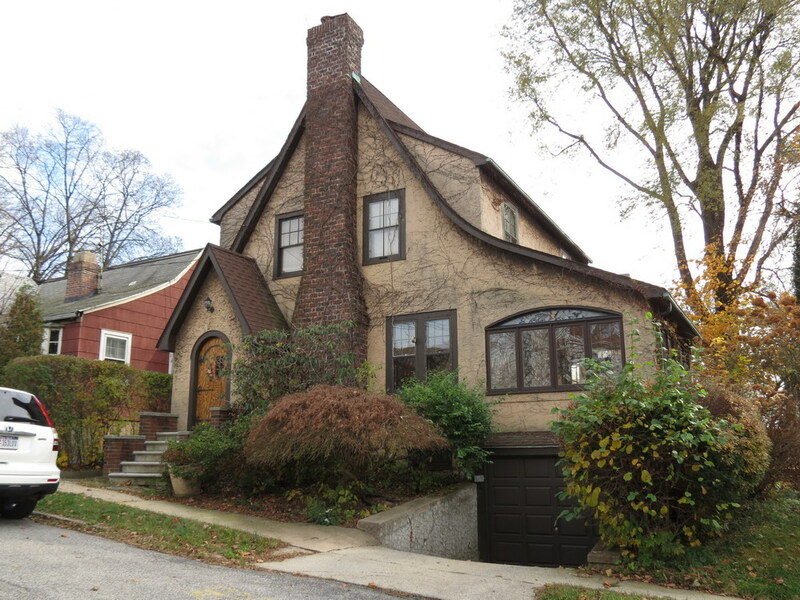 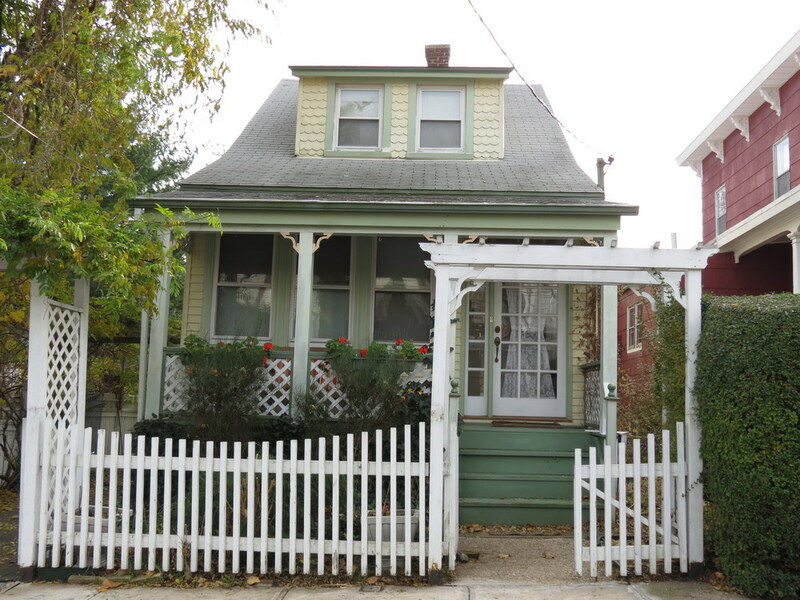 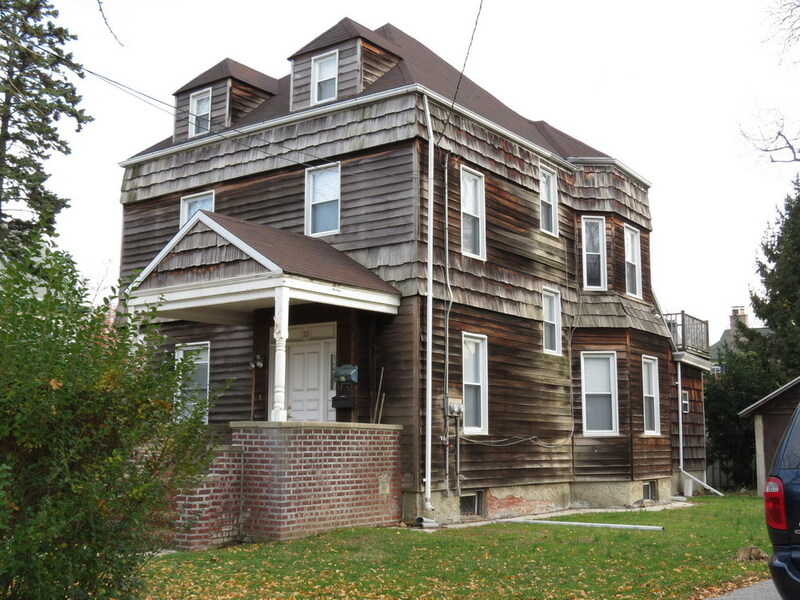 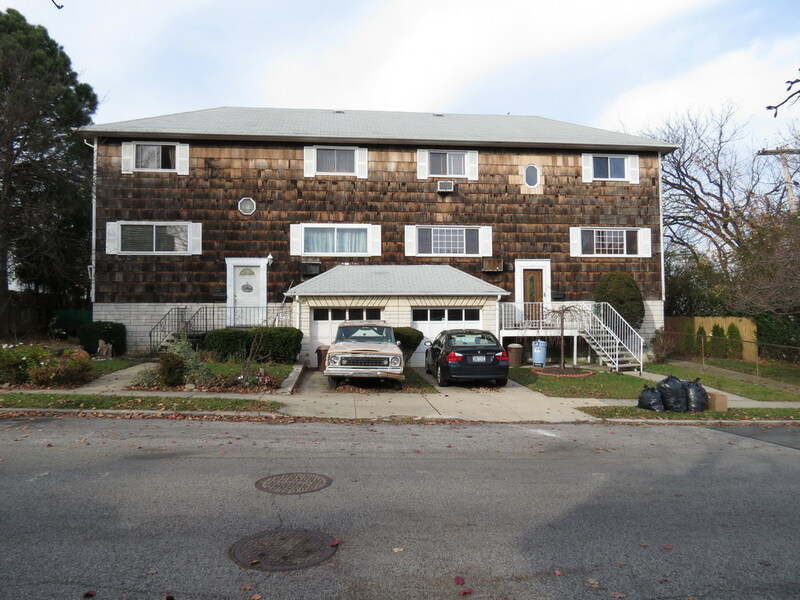 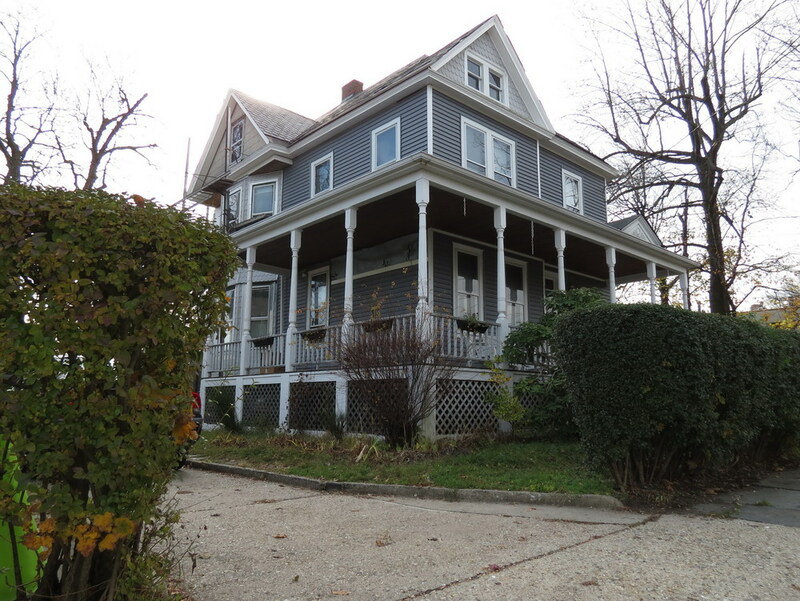 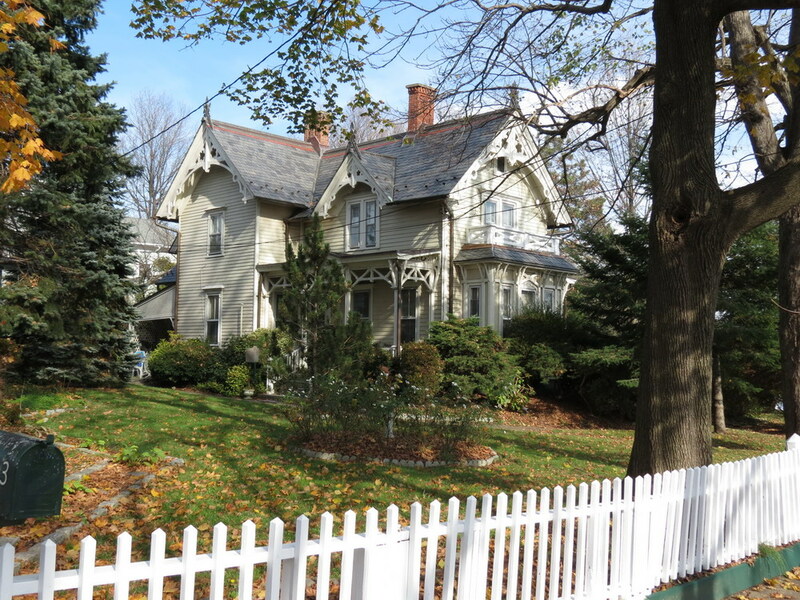 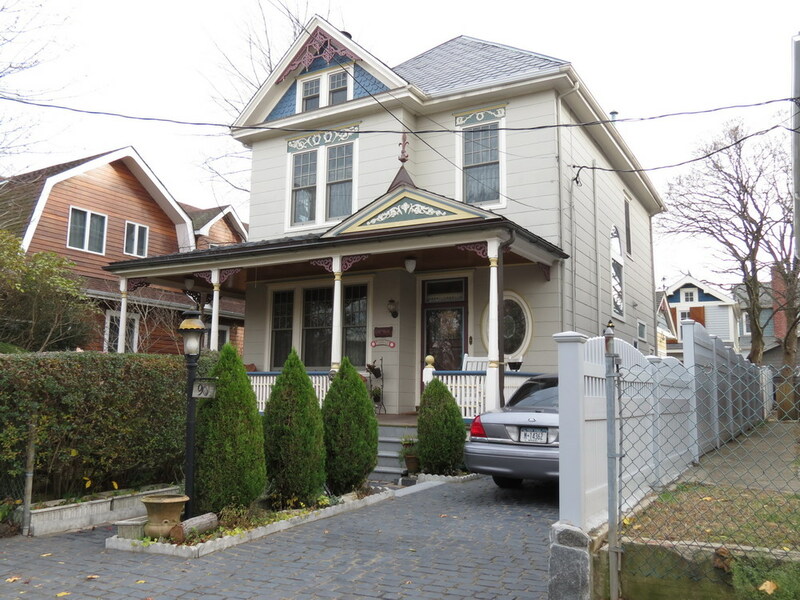 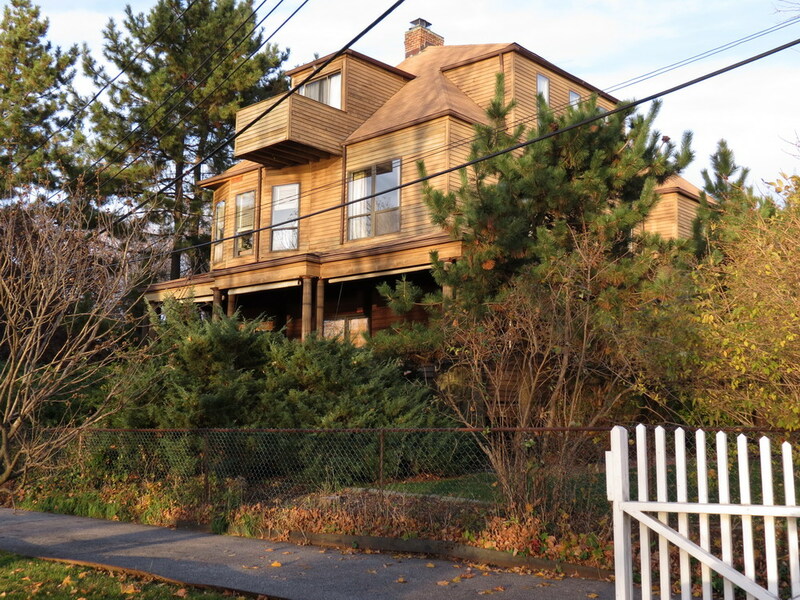 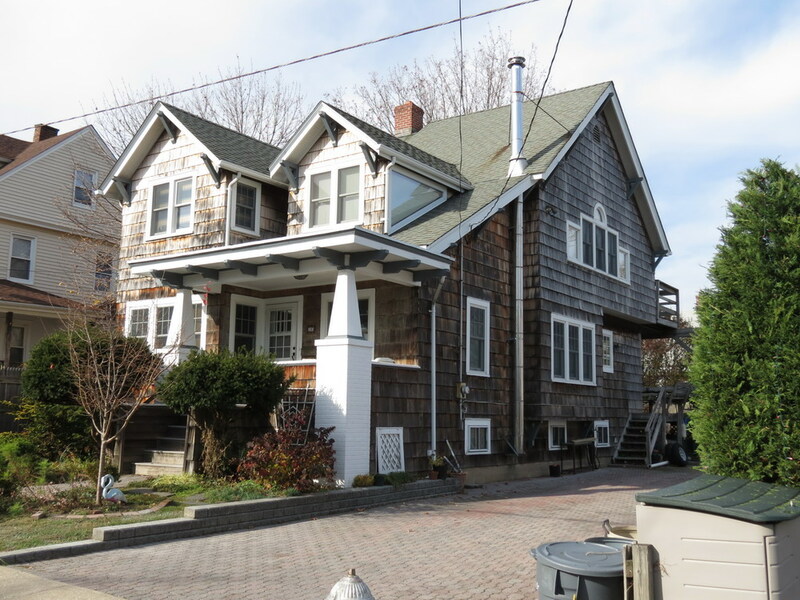 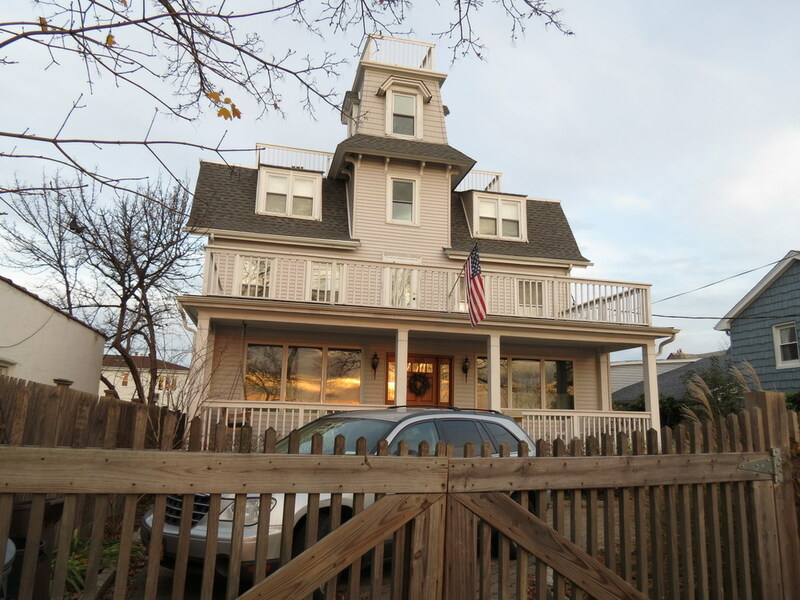 Although part of the Bronx, City Island has a distinct personality that seems imported from New England, reflected in the island’s architecture. 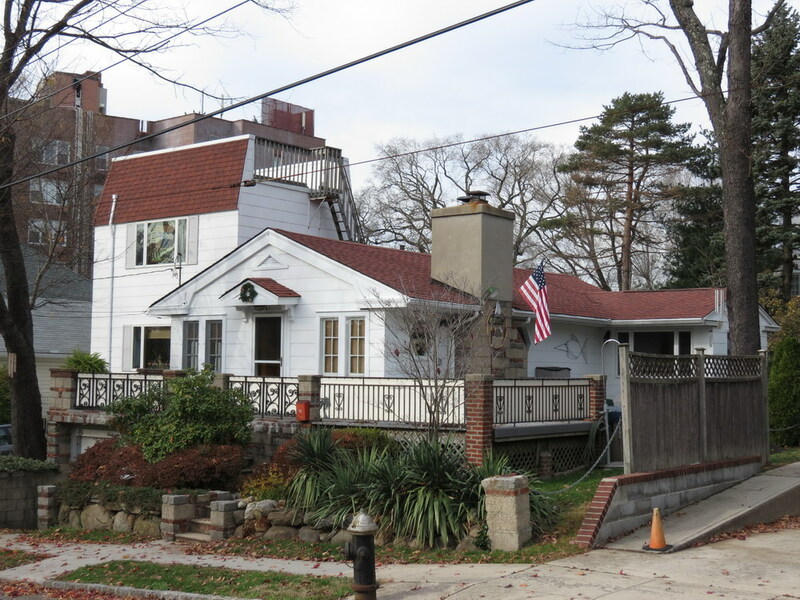 City Island Avenue is the island’s main north-south thoroughfare; side streets are one or two blocks long east and west. 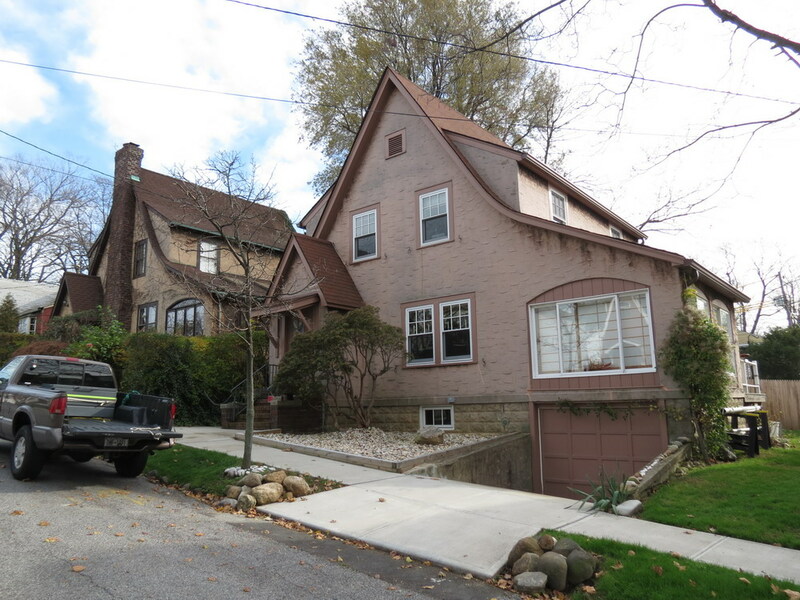 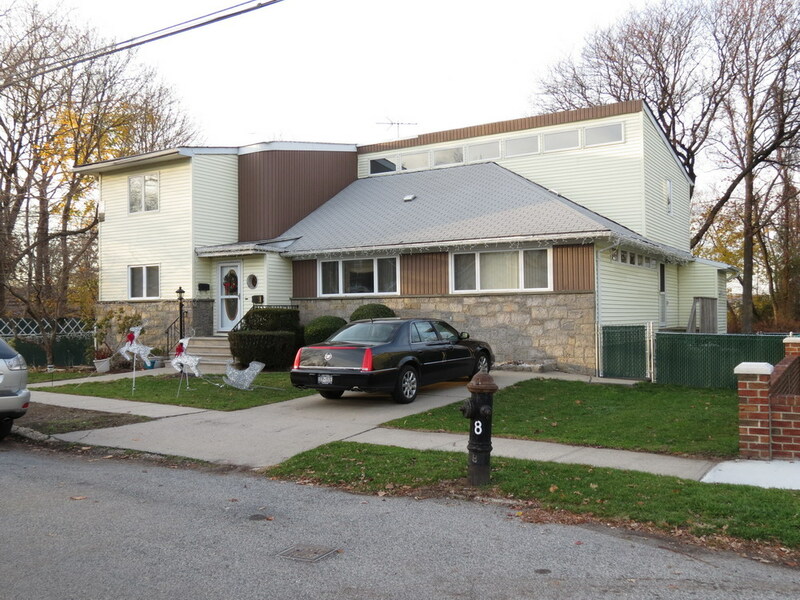 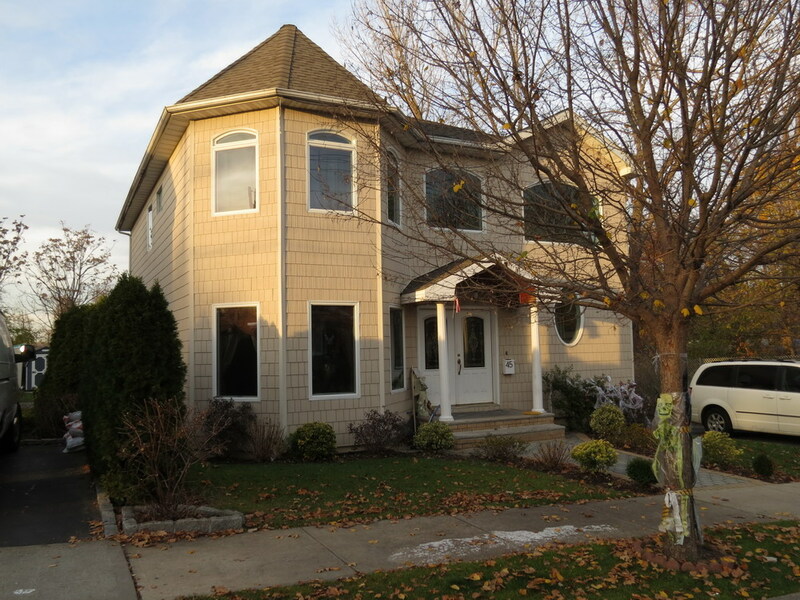 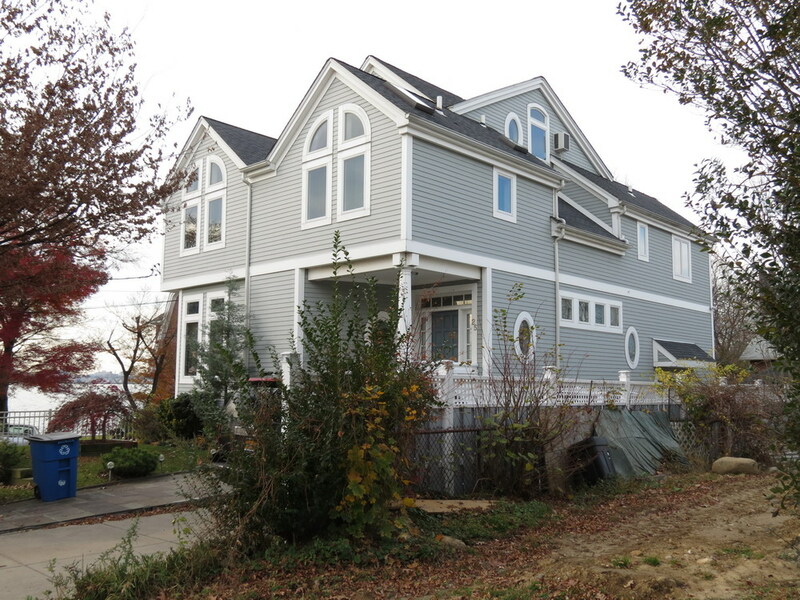 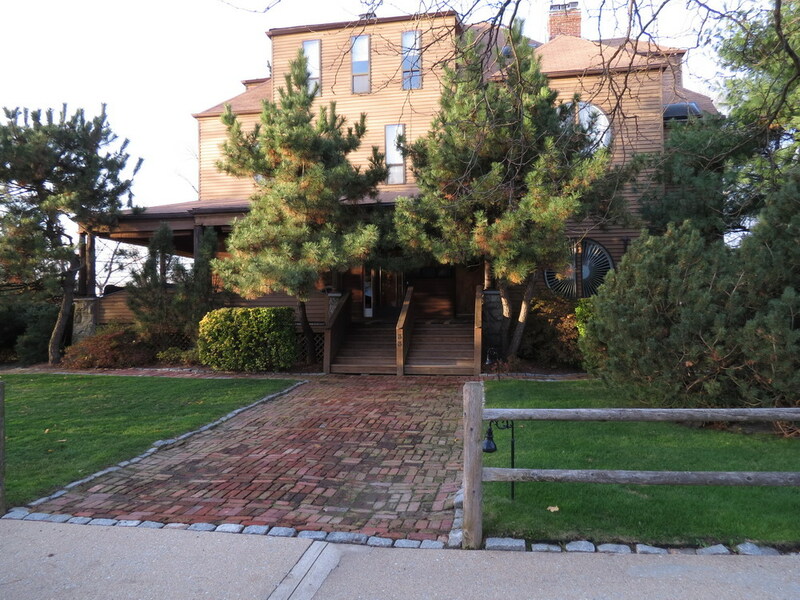 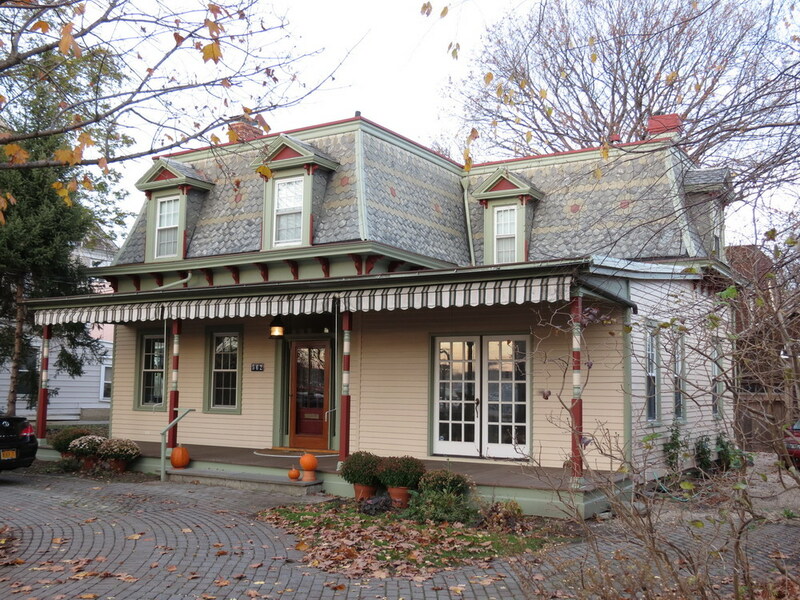 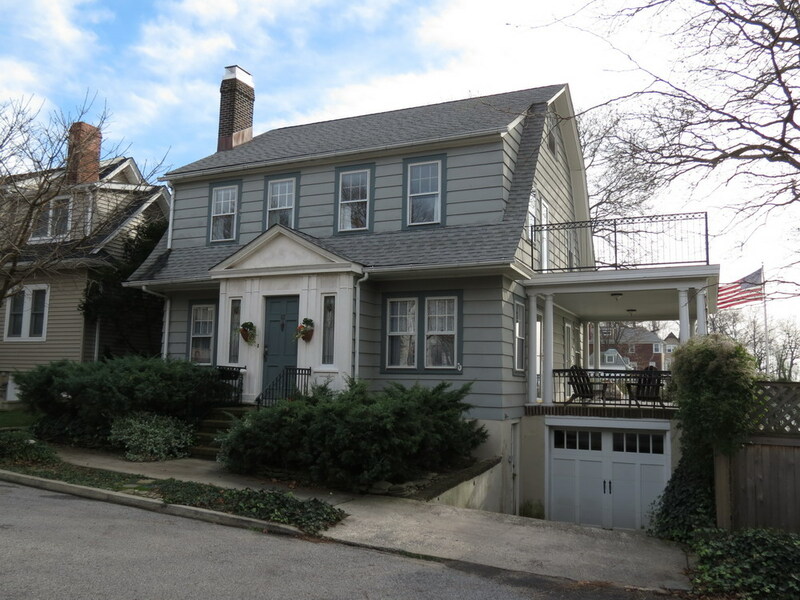 Rule of thumb: The most interesting homes are at the ends of the street, overlooking the water. 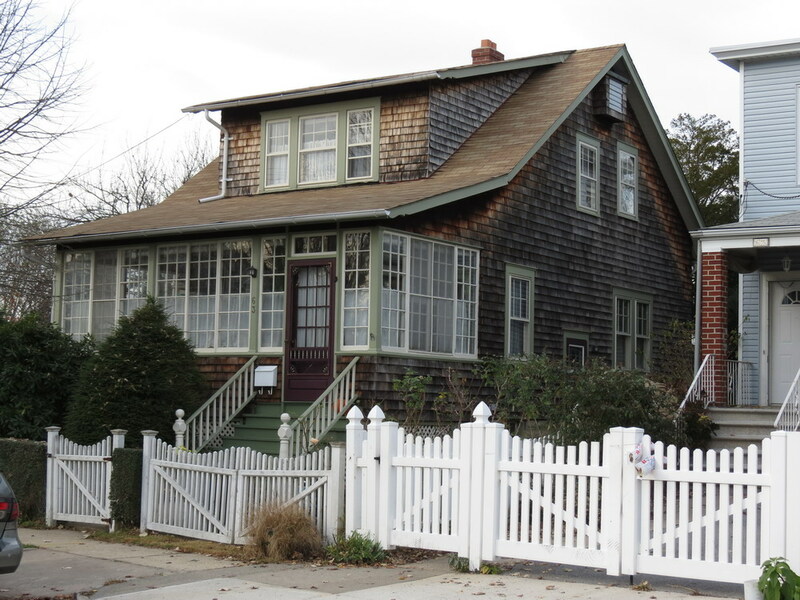 It may seem that the most interesting homes are all at the southern end of the island; not necessarily. 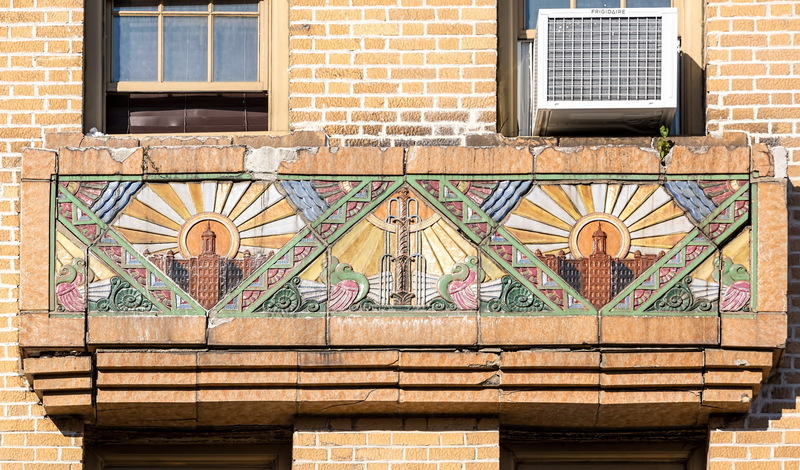 I must confess, the sun was getting low in the sky, forcing me to rush a bit – I didn’t explore every block. 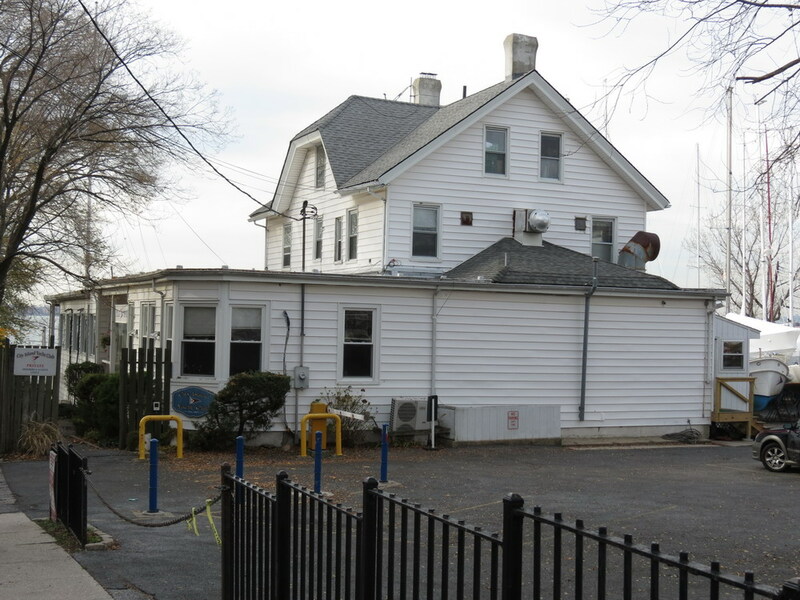 Getting There: Take the number 6 to Pelham Bay (end of the line), transfer to the Bx29 bus, which goes all the way to the southern end of the island. 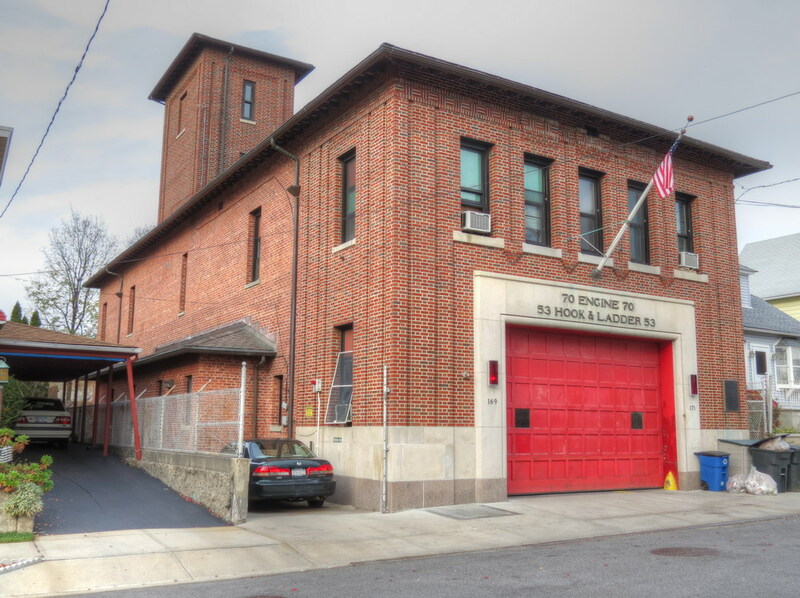 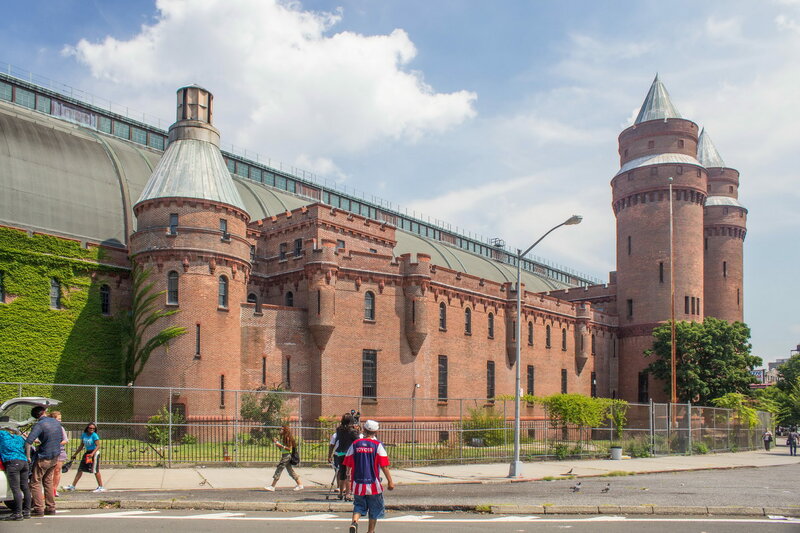 February 23, 2015 Bronx1917, 29 W Kingsbridge Road, armory, bronx, civic, historic, landmarks, New York City, Pilcher & Tachau, romanesque. 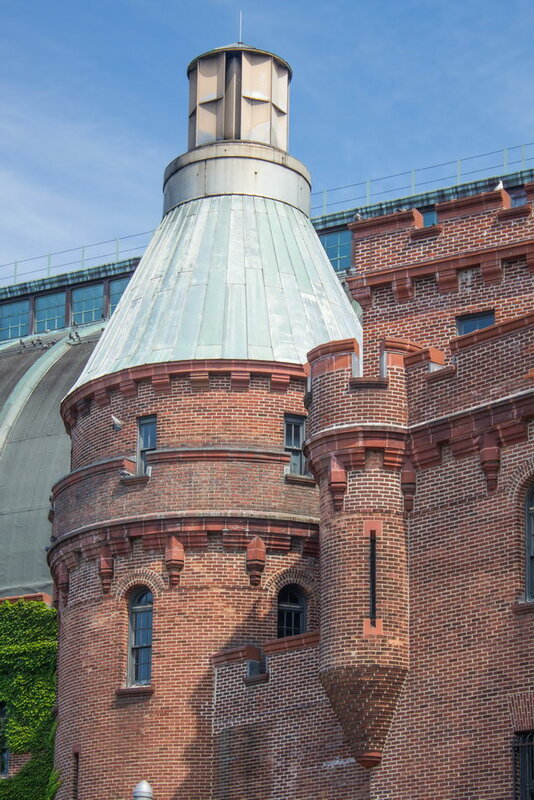 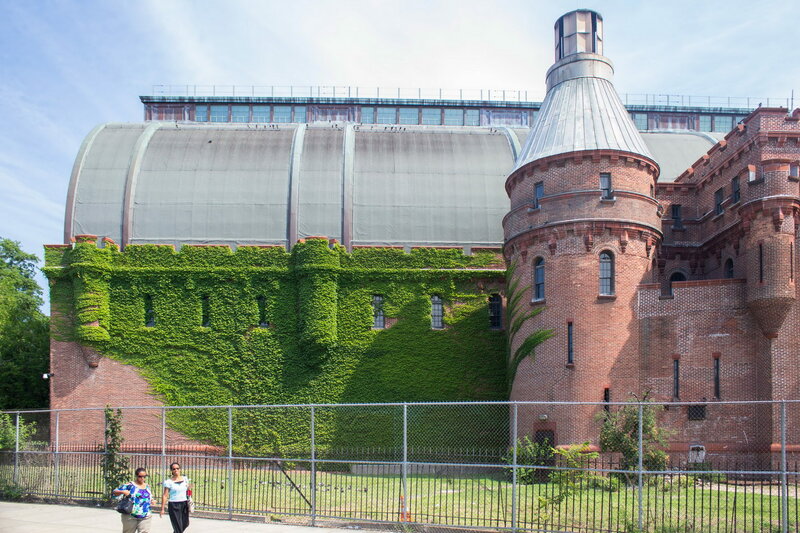 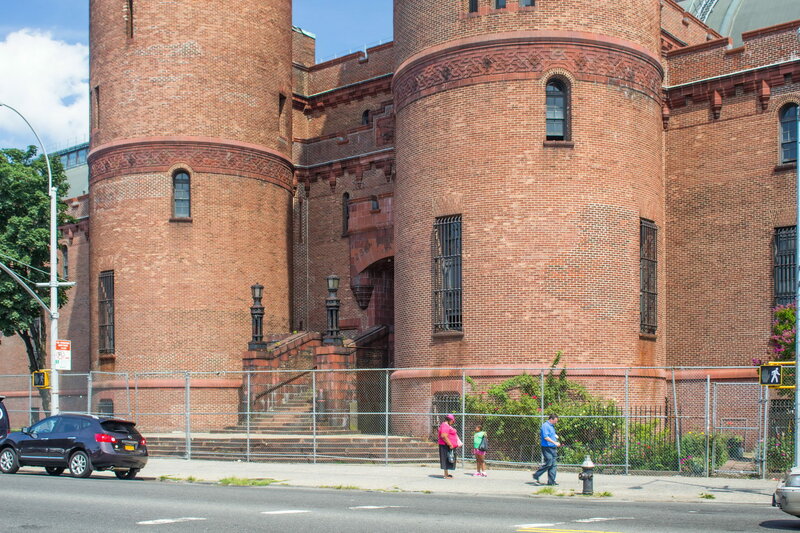 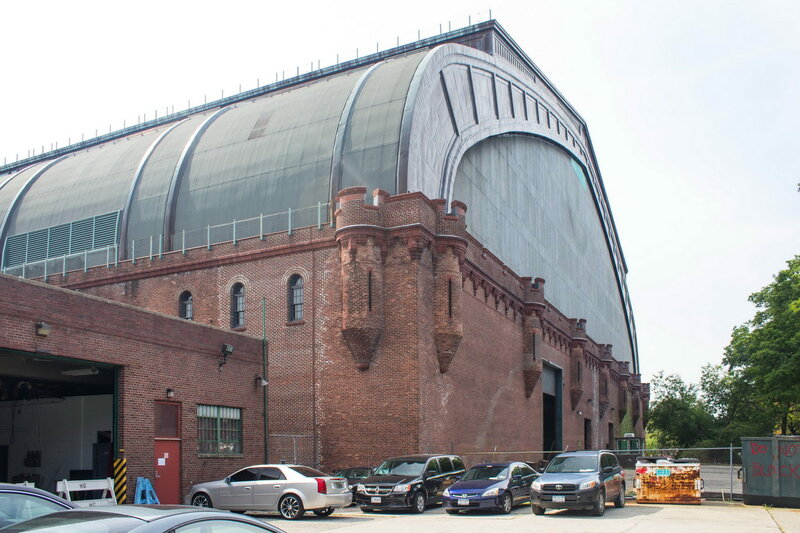 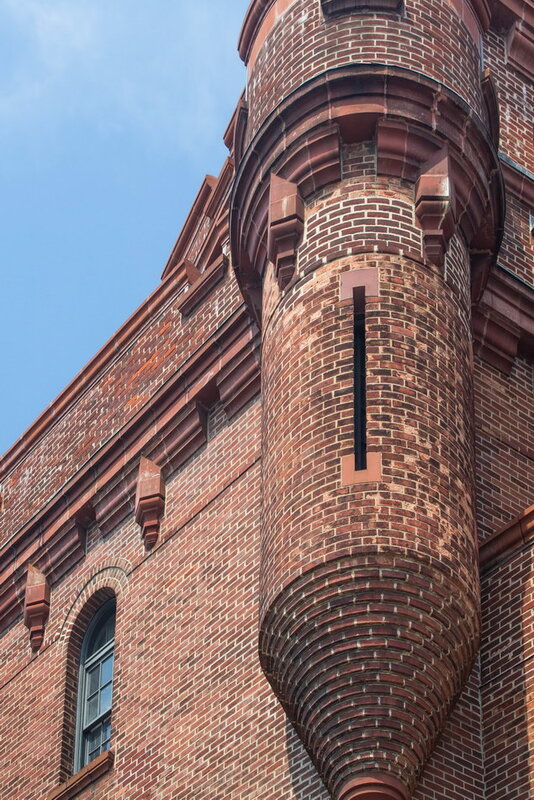 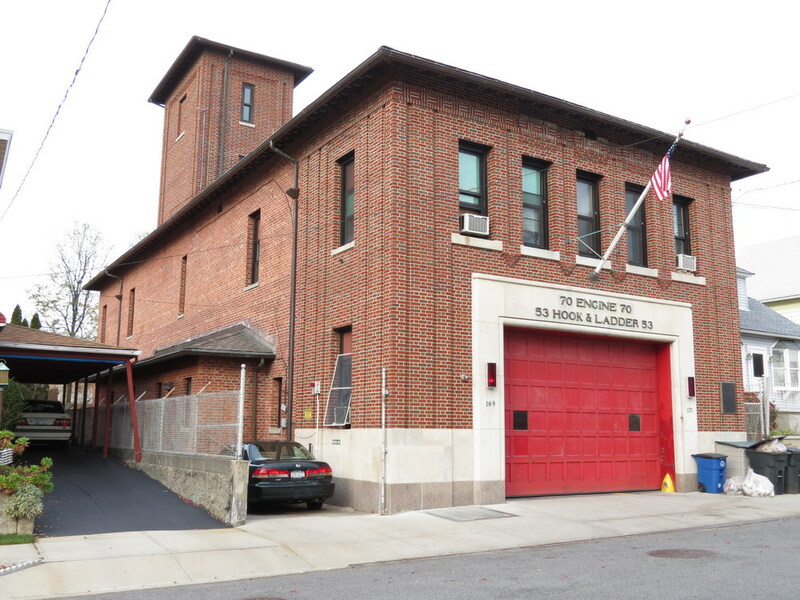 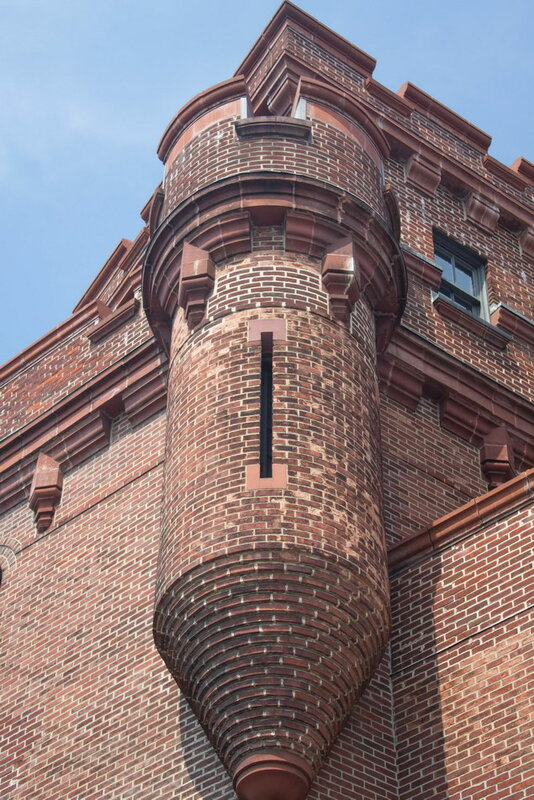 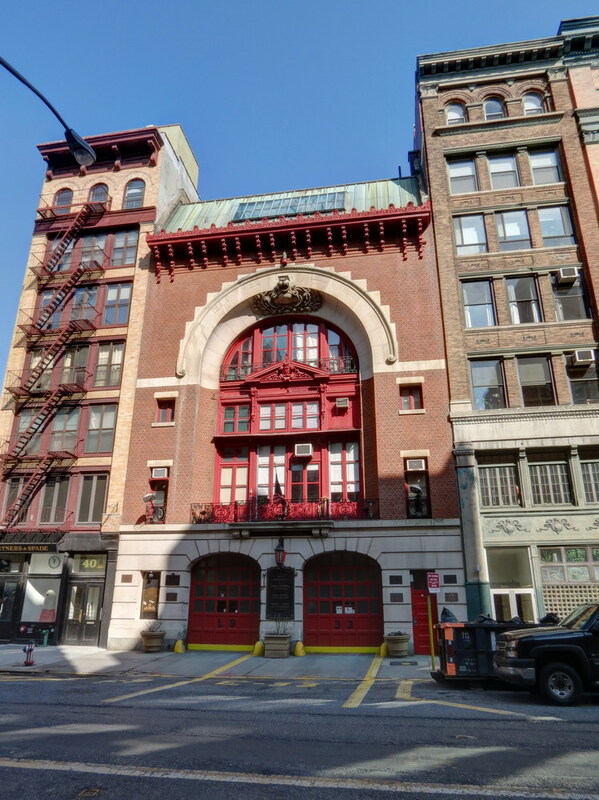 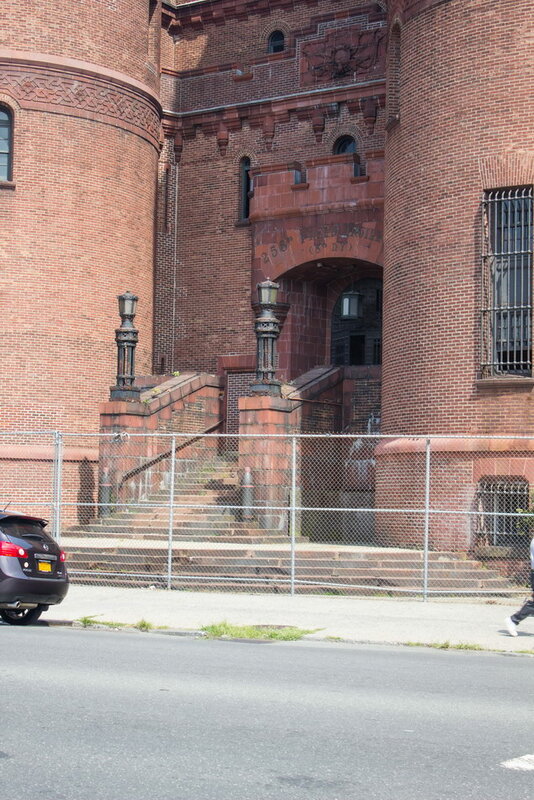 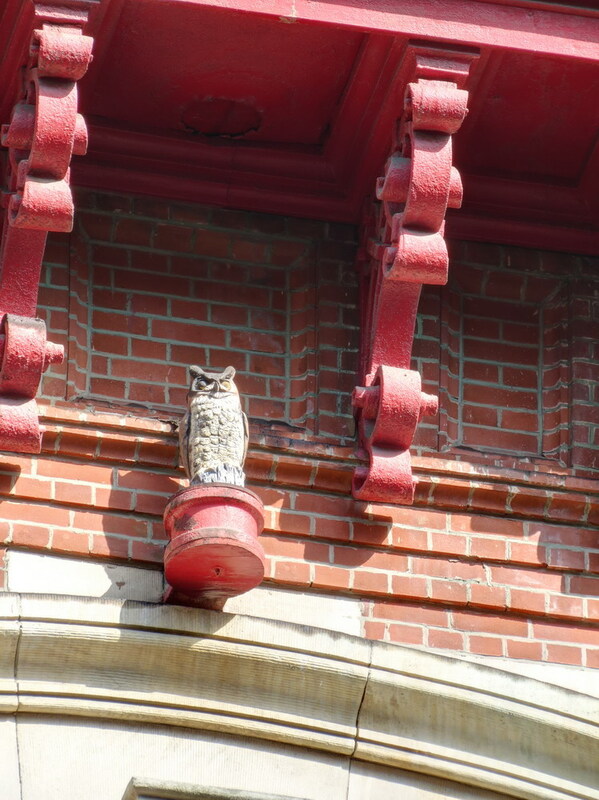 Originally known as the Eighth Coastal Artillery Armory, Kingsbridge Armory was built in 1912-17 with what was then the world’s largest drill hall, to accommodate artillery. 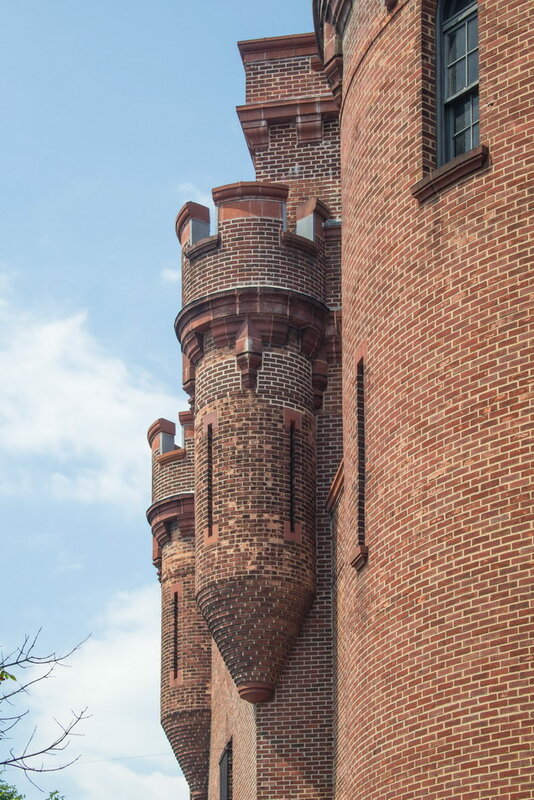 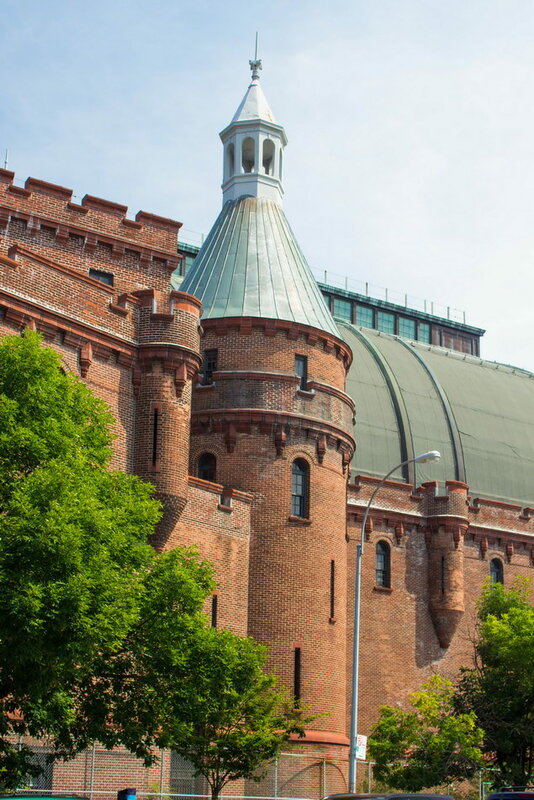 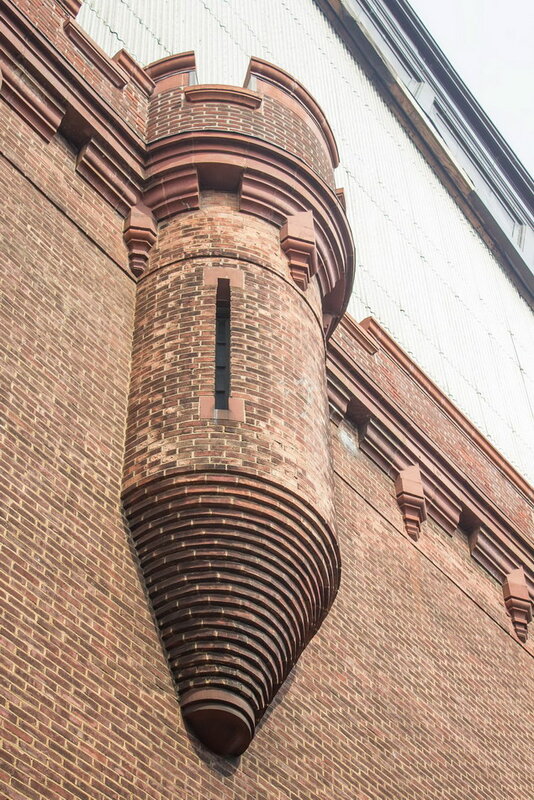 According to “Guide to New York City Landmarks,” the armory was designed by Pilcher & Tachau and inspired by a medieval French castle at Pierrefonds. 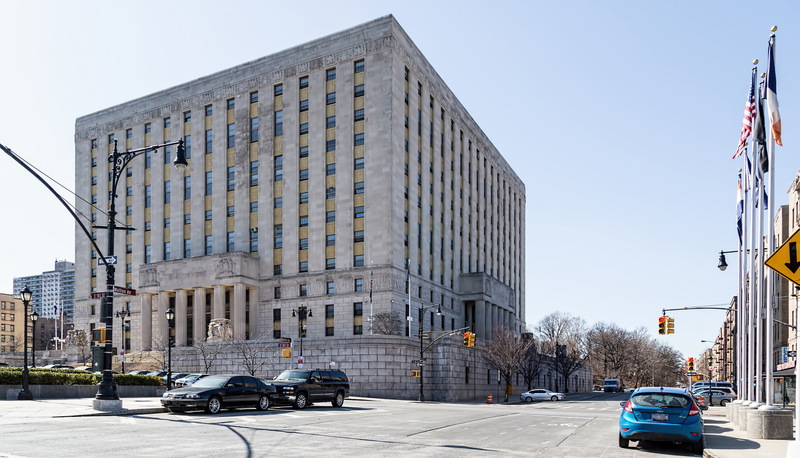 The main hall has been unused by the military for more than a decade, and New York City now controls the building. 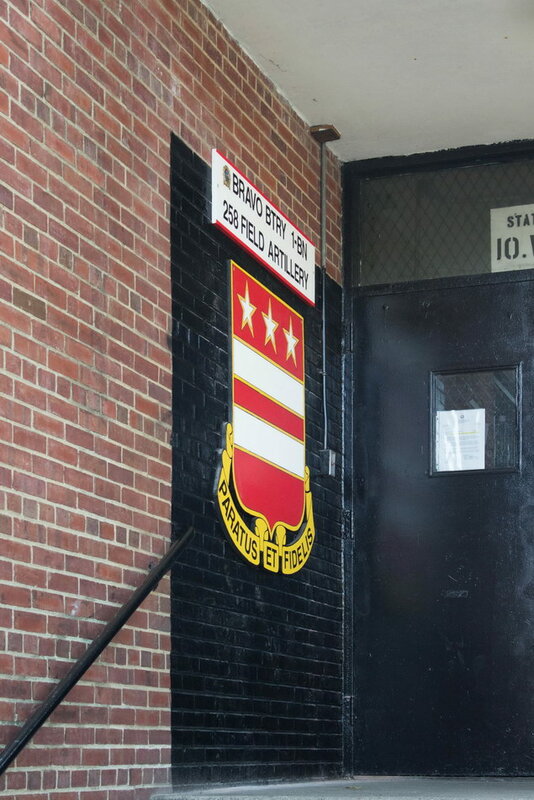 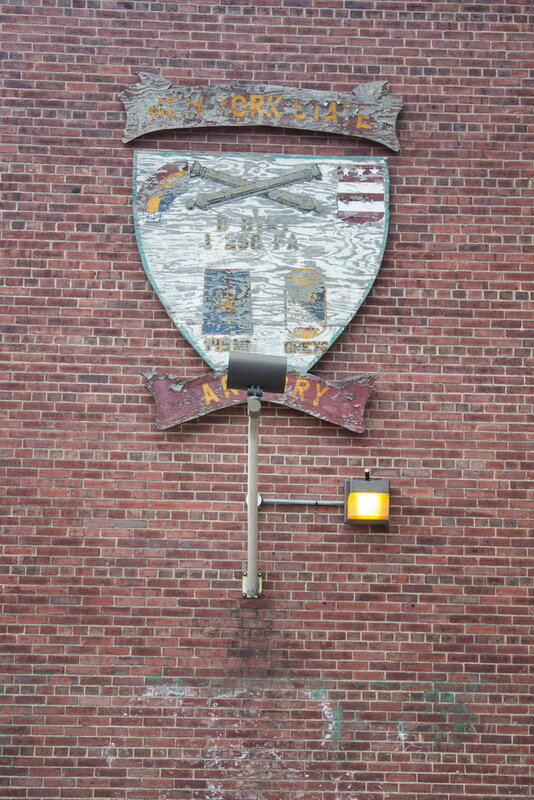 (A National Guard unit still uses the north annex, adjacent to the armory.) 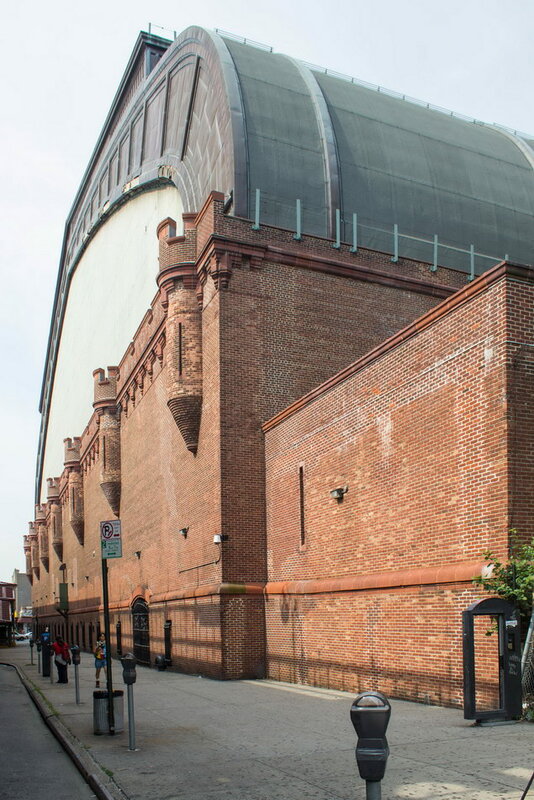 The Bronx Borough President has endorsed a proposal to turn the armory into an ice skating center with nine rinks.